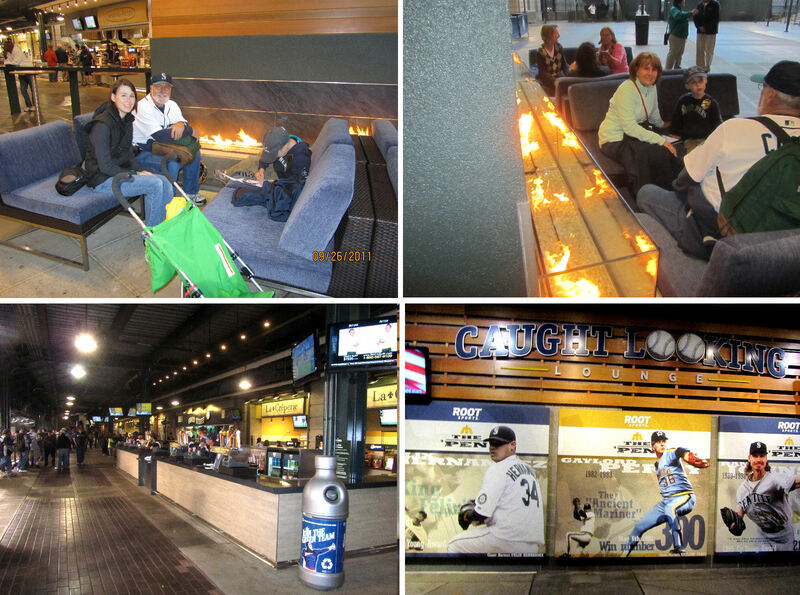 During the week leading up to Saturday, April 28, 2012, we were looking forward to our first game of the season at Camden Yards. But the weather outlook was sketchy. Rain seemed to be in the forecast. 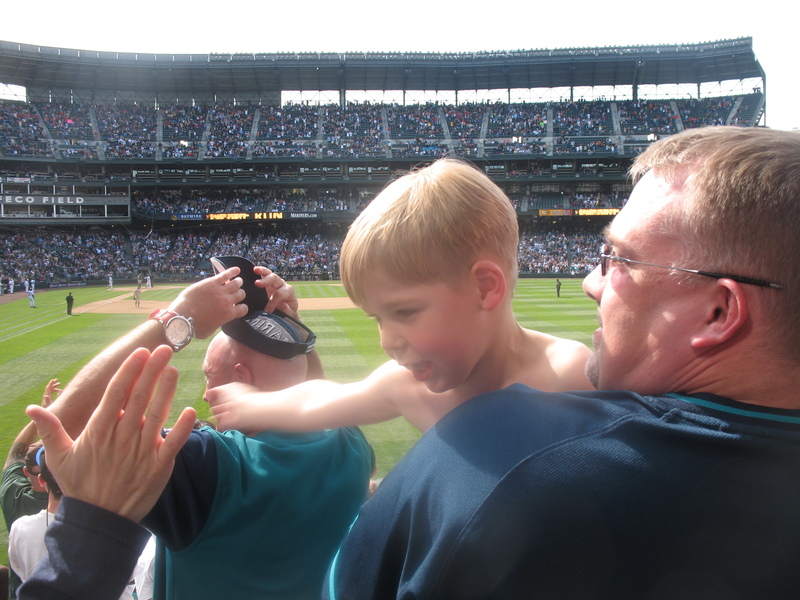 And I was going back-and-forth regarding whether Kellan should join me and Tim for this game. I wanted him to join us, but I feared having to corral him in the rain. But on Friday, I made the decision: Kellan would definitely join us. 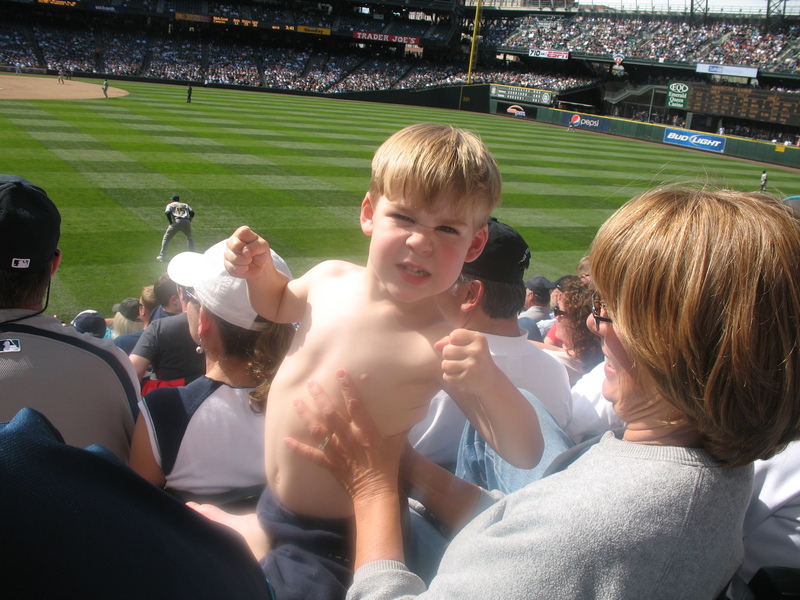 …, which apparently upset Kellan (he wasn’t too interested in getting his picture at the time). …and so were we. 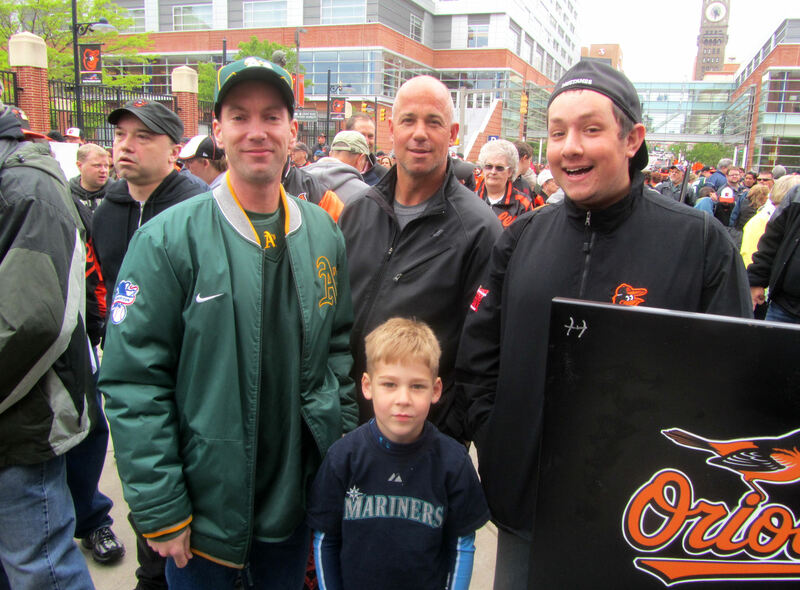 In that last picture, along with Tim, Avi Miller and Matt Hersl, that is 1,100+ baseball ballhawk and east coast Oakland A’s fan, Rick Gold. 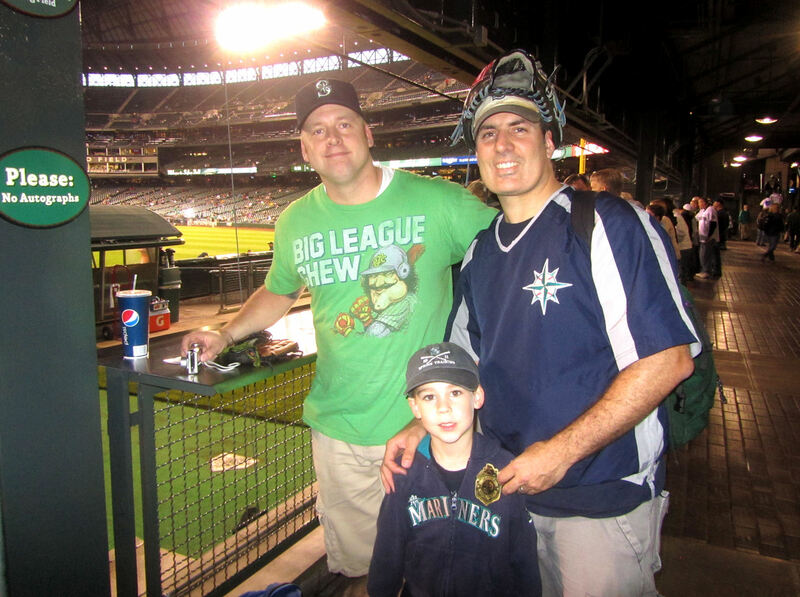 Rick and I have known each other for a while through myGameBalls.com and twitter, but this was the first time we had ever met in person. Despite rooting for the wrong A.L. West team, Rick is a pretty cool guy. 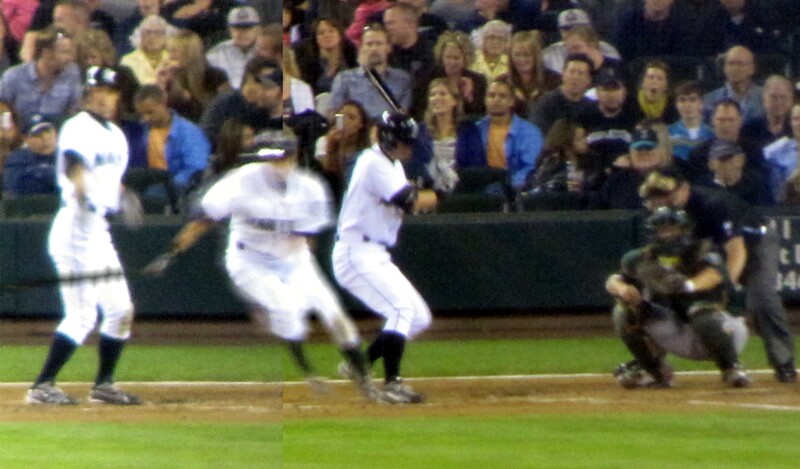 …and I took two of the worst possible pictures of him – that last one is the *better* of my two Eddie Murray pictures! 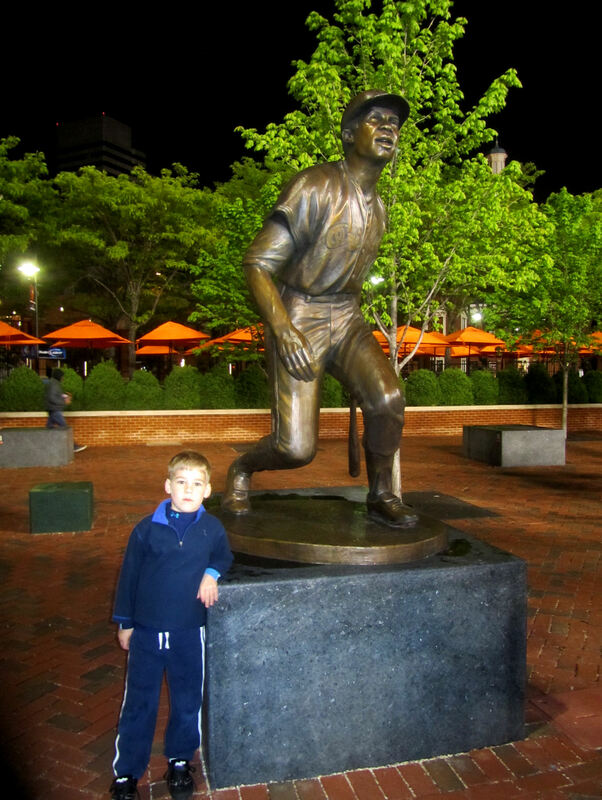 The statue unveiling was part of the Orioles’ celebration of the 20th anniversary of Camden Yards. 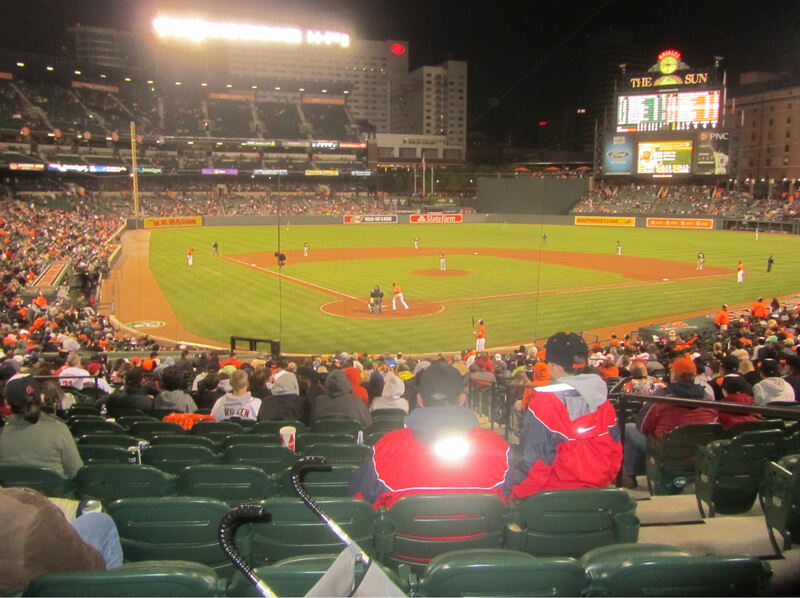 (Think, when Camden Yards opened, Fenway Park was a mere 80-year-old spring chicken of a ballpark). That is easily my favorite picture of the season so far. 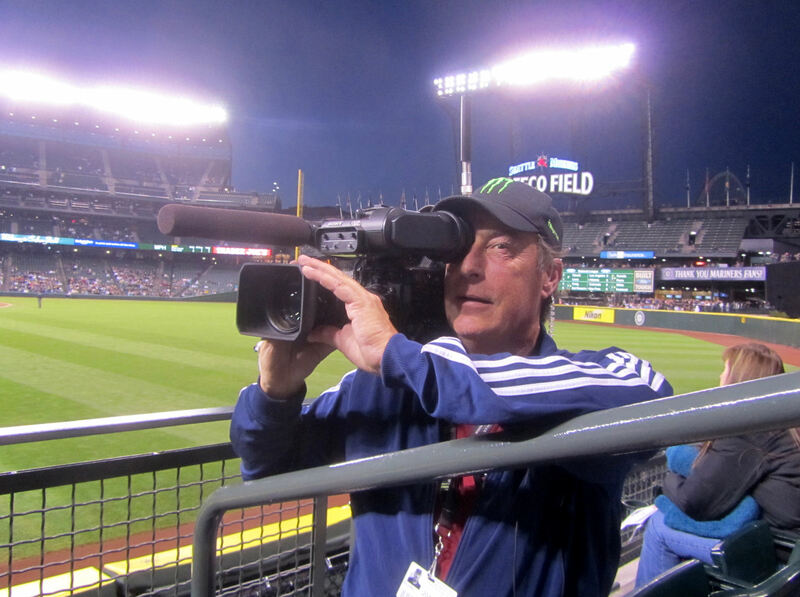 In our first three games, my camera has been annoying me like nobody’s business. It is ruining a ton of my pictures and really seems to have it out for me. But my camera apparently felt the gravity of the situation and it worked perfectly in the crunch and captured that last picture. 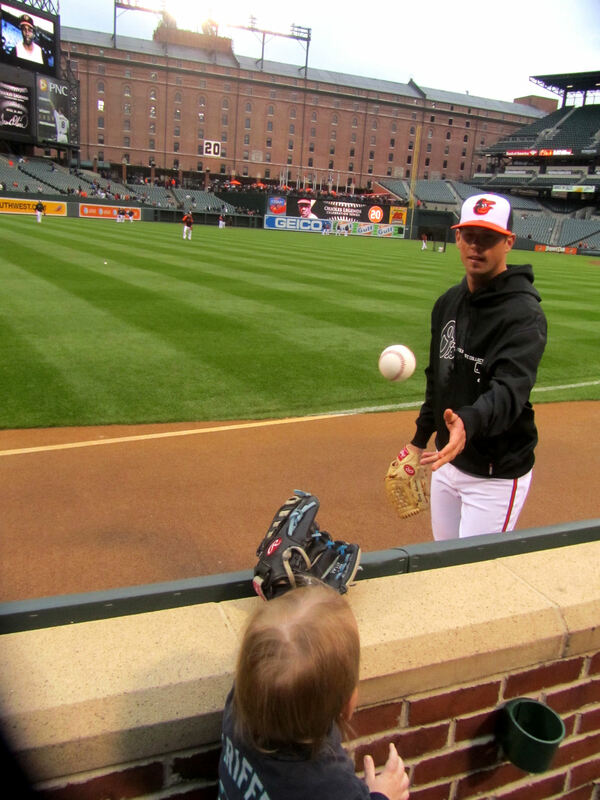 And thank you, too, Brian Matusz! 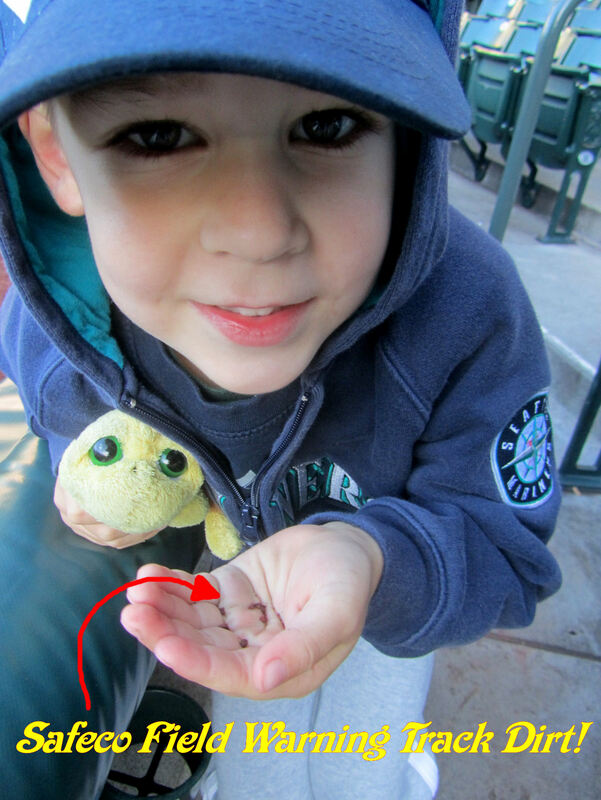 By the way, the ball bounced off of the side of Kellan’s glove and fell to his feet. But it was a great moment anyway. We decided to head over there for a little peak. 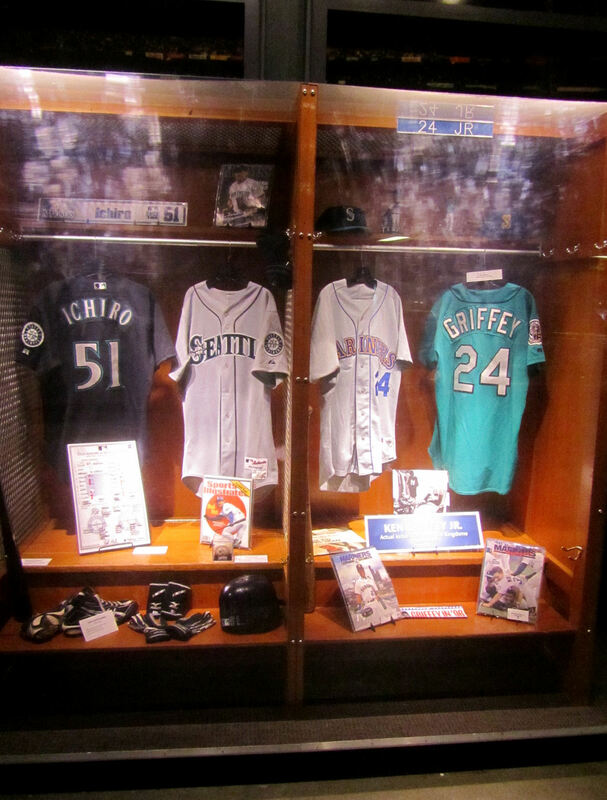 But it was so crowded we could hardly see the panel of Hall of Famers – and my only picture attempt came out totally unrecognizable because I had to take the photo through trees, flowers, people, etc., etc. And get back out there we did. 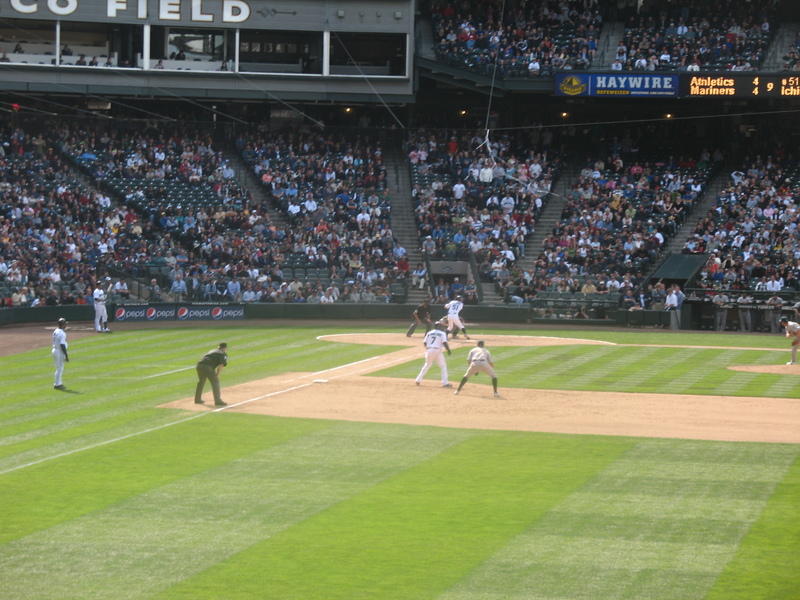 We headed back to the third base line. 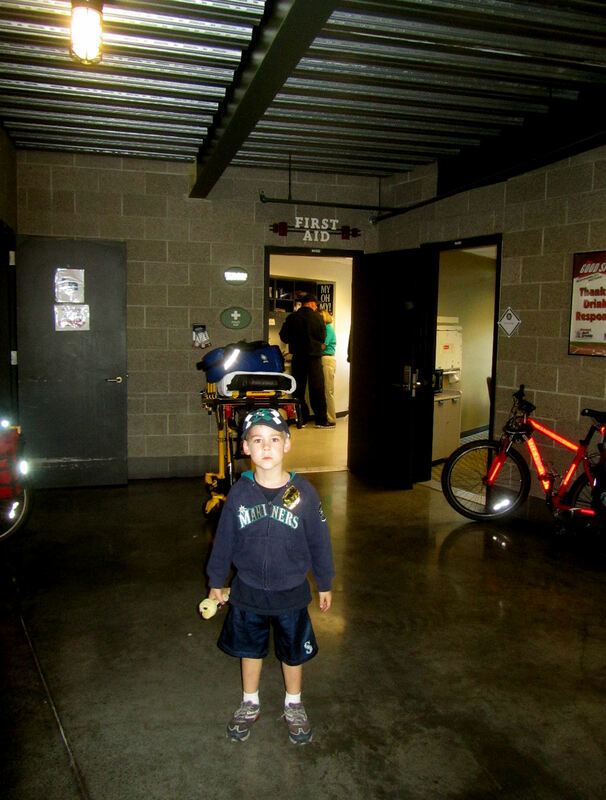 Unfortunately, he had taken Kellan’s umbrella stroller into the stadium, which was a terrible idea. 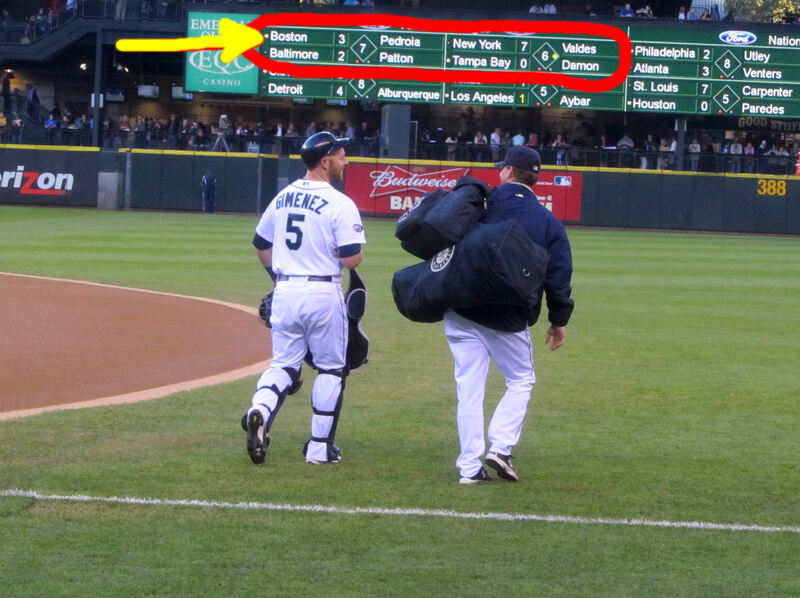 Tim was in charge of rolling it around (empty) and finding places to stash it during BP. 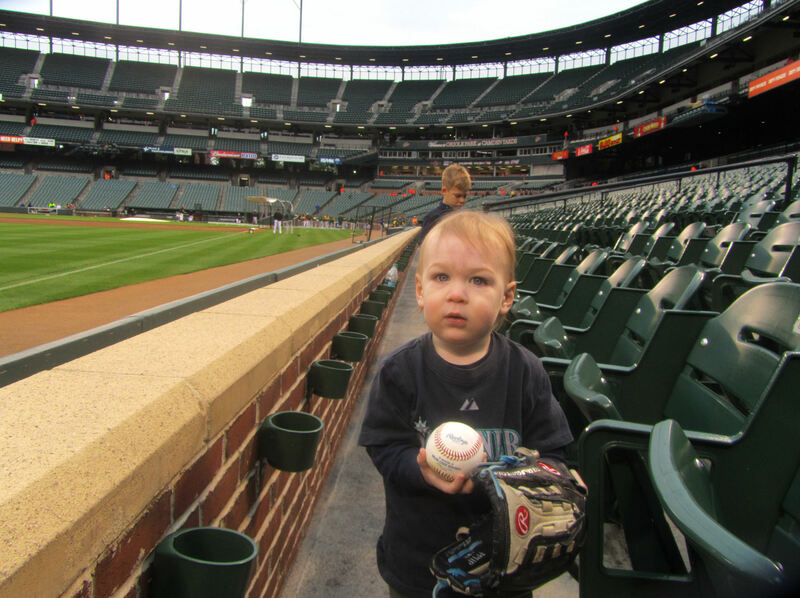 He seemed to like taking charge of this task and he was vehemently opposed to just leaving it out in deep LF while we went back to the third base line. It was a long slow climb and during the process Tim dropped his baseball. It rolled all the way back down to the first row. I had to run back down and scooped it up for Tim. …and all of the speakers were broadcast over the PA system. It was really cool being in the same building and hearing Hank Aaron speaking about his friend Frank Robinson, and then hearing Frank Robinson talk about himself and his teammates. We were up there a loooooooooooooooooooooooong time. 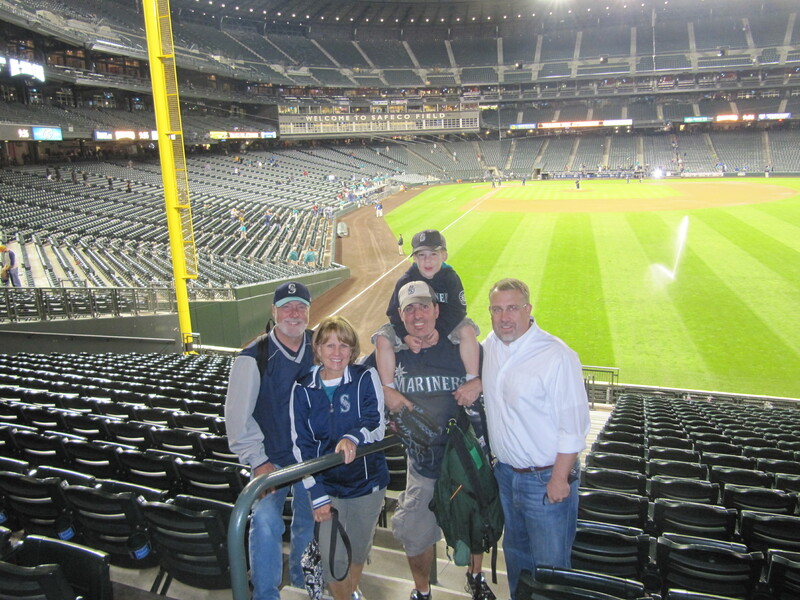 I’m not sure what time the rain started coming down, but it felt like we were up in the Club Level for about ten hours. When I finally looked at the clock on my phone, I saw that it was still another whole hour until the game was set to start! Yikes. 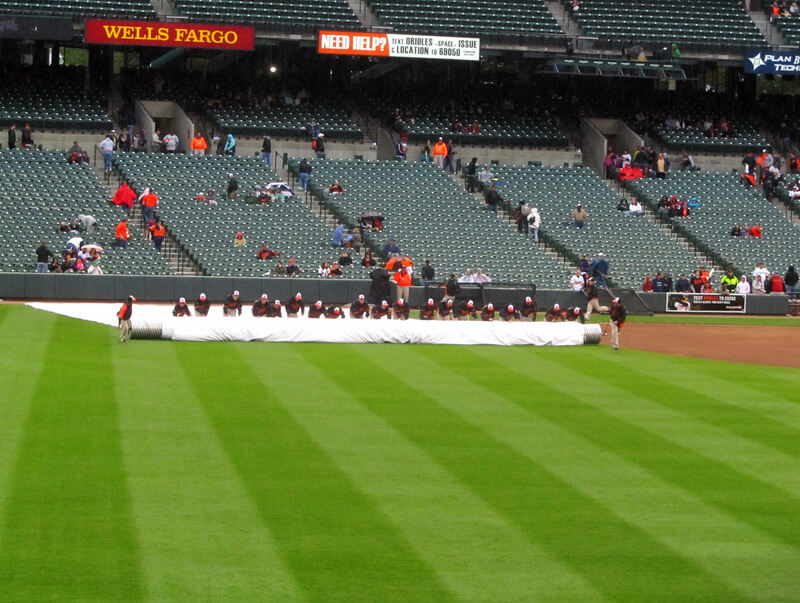 Rain outs during BP make for a whole lotta down time. 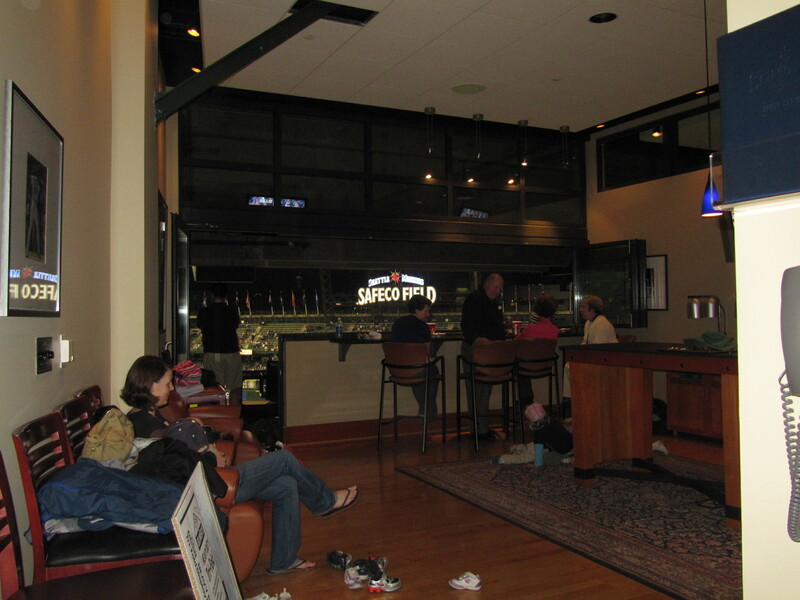 …and Kellan ran a million laps around two people sitting in chairs watching TV (one of them is above Kellan in that picture). 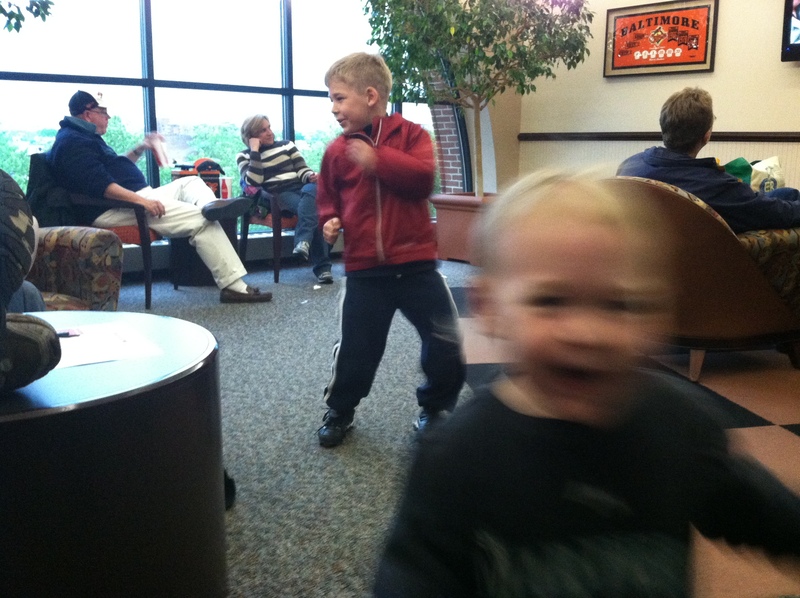 Eventually, this resulted in a giant catastrophe – Tim decided to show Avi’s friends how fast he is, so he ran two laps around the chairs in the opposite direction of Kellan and the two collided chest-to-chest on the second lap. I could see it about to happen in slow motion as the scene unfolded, but I was helpless to stop it. Tim completely flattened Kellan, who fell back and smacked his head on the floor. It was a bad scene with lots and lots of crying. Luckily, after five minutes sobbing uncontrollably on my shoulder, Kellan pulled through and was back to giggling and running around again. 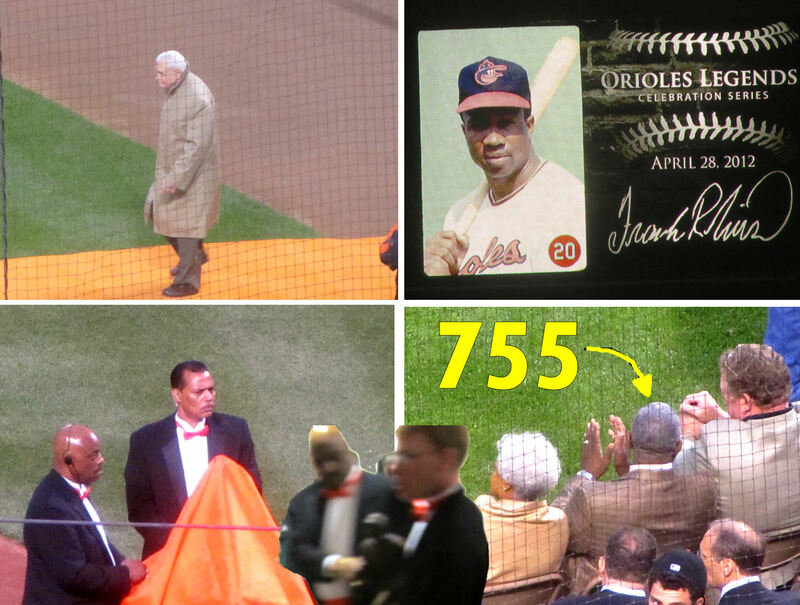 In the upper left, that is Earl Weaver walking the “orange carpet.” In the bottom right, of course, that is Hammerin’ Hank Aaron. 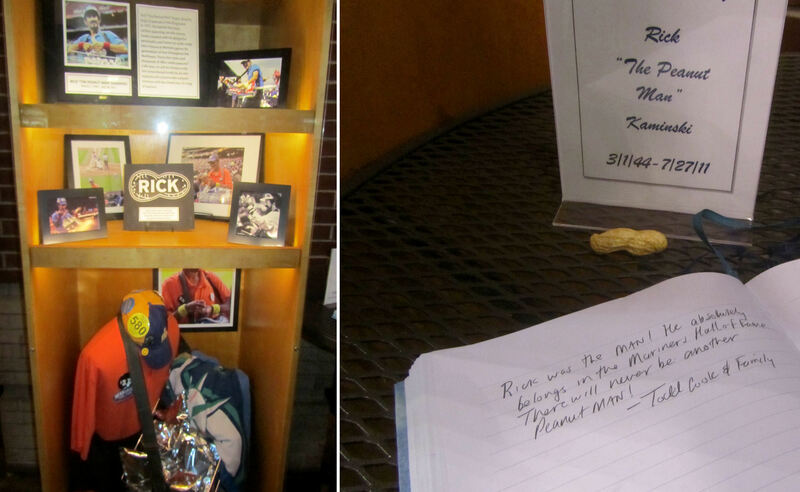 Hidden under the orange sheet (bottom left), the Orioles presented Frank Robinson with a 2-foot tall replica of his new statue. Half an hour later, two guys walked by us in the Club Level carrying that little statue (which looked really heavy) to a suite (which I assumed was the owner’s suite) where all of the Hall of Famers watched the game. Although he has such a wonderful smile, Tim is prone to do these “grumpy” faces in pictures because he thinks it makes him look cool. He’s a big fan of being cool! Always has been. Growing up is an interesting process, eh? He keeps it fun, even if his *cool* / *grumpy* face stands in for his big smile in some pictures. 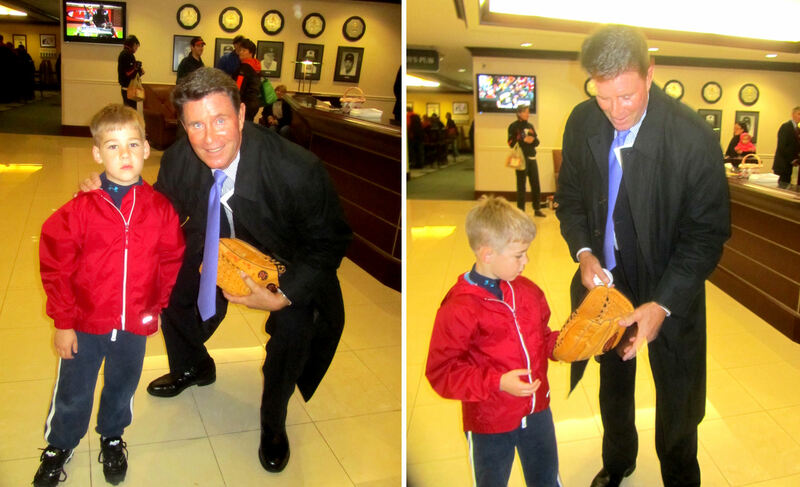 Anyway, after the photo with grumpy-faced Tim, Jim Palmer handed a “Luis Ayala” embroidered glove to Tim and was like “here, try this on.” Then Palmer handed Tim a baseball and was like, “here, hold this baseball…but you can’t have it because I have to give it to Frank Robinson.” I’m pretty sure the glove and baseball were used by Frank Robinson when he threw out the first pitch. 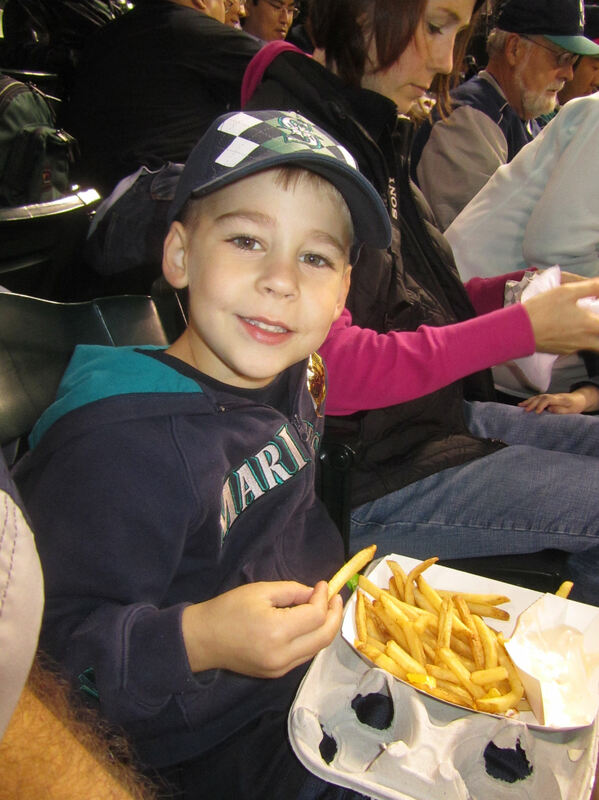 …and Tim opted for some chicken fingers and fries. The previous tall, two foot wide padded wall at the front of the flag court is now replaced with a short wrought iron fence. 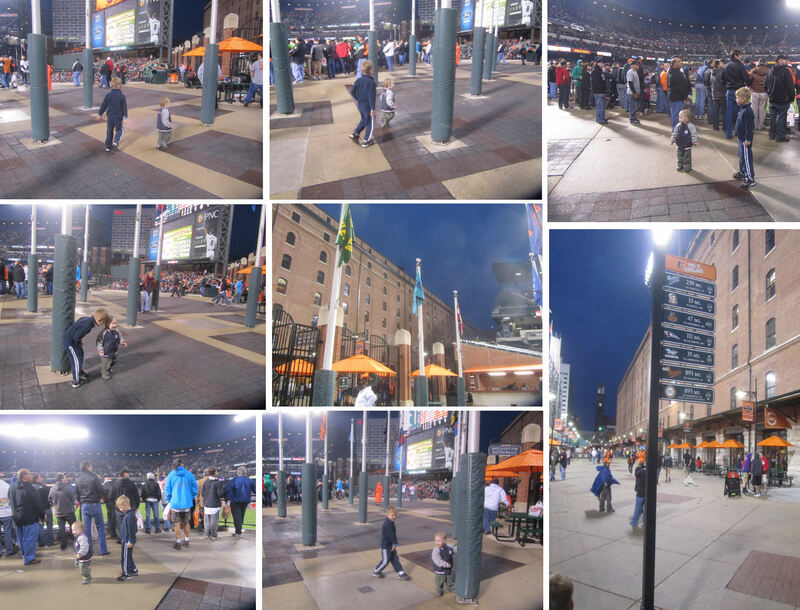 Just like when Tim was 2-3 years old, Kellan LOVED the flag court and he ran around like crazy all over the flag court and Eutaw Street. 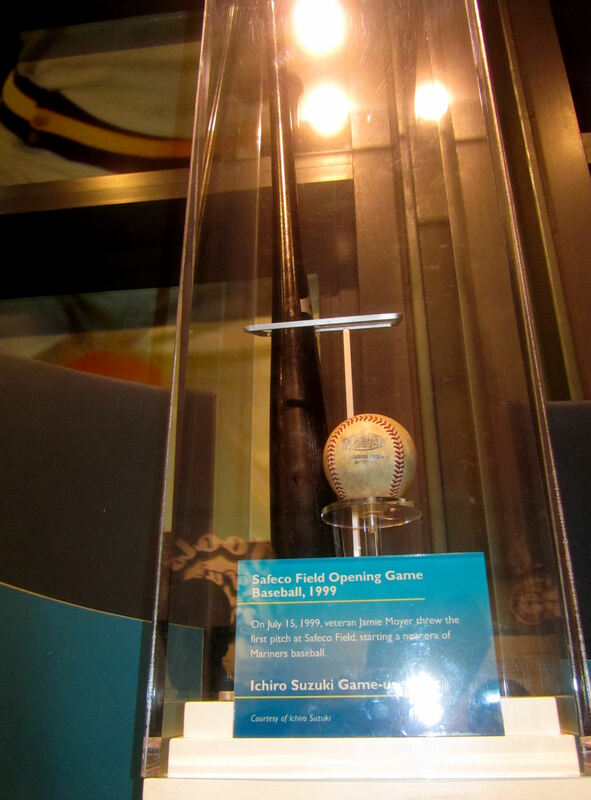 Of course, Frank Robinson played RF and the Orioles have retired his number 20. 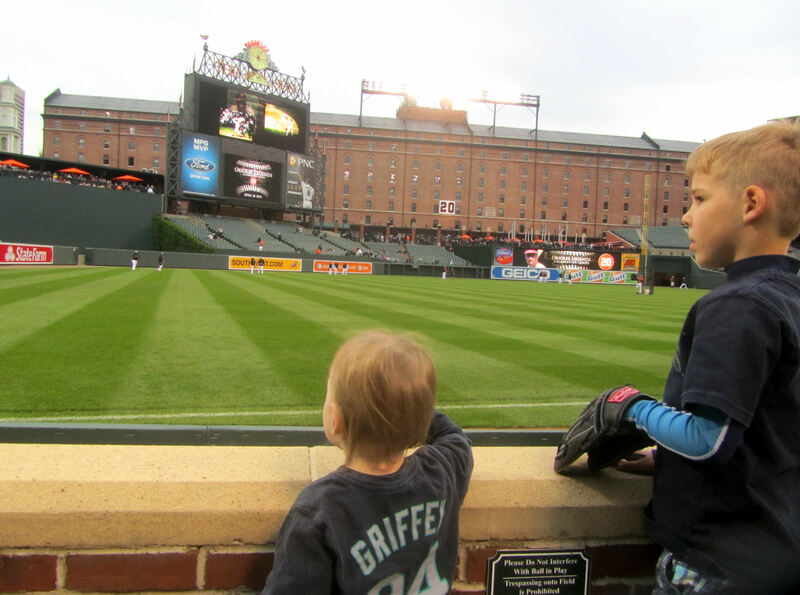 While we were out in the flag court, it was the top of the second inning and the Orioles put up a 5-spot on the strength of six singles (by Adam Jones, Wilson Betemit, Chris Davis, Ronny Paulino, Robert Andino, and Nolan Reimold) and a sacrifice fly by J.J. Hardy. 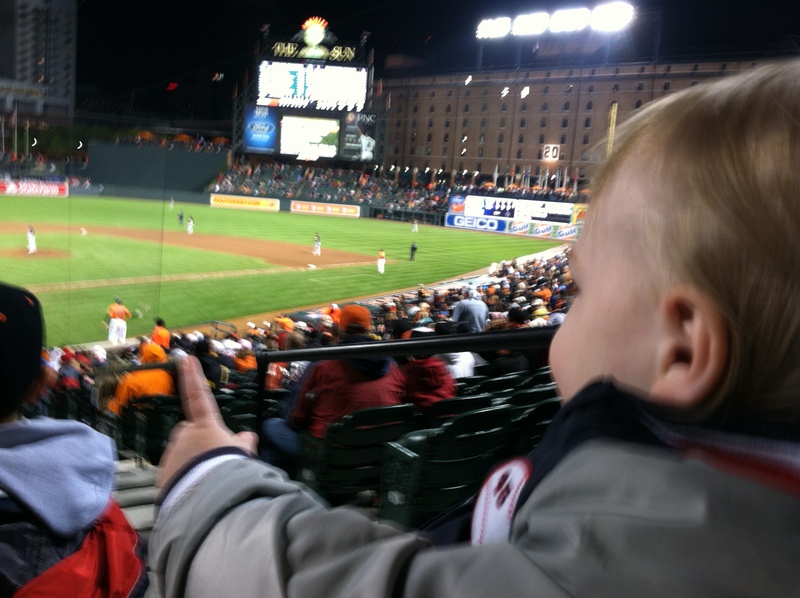 That made the score 5-0 Orioles. 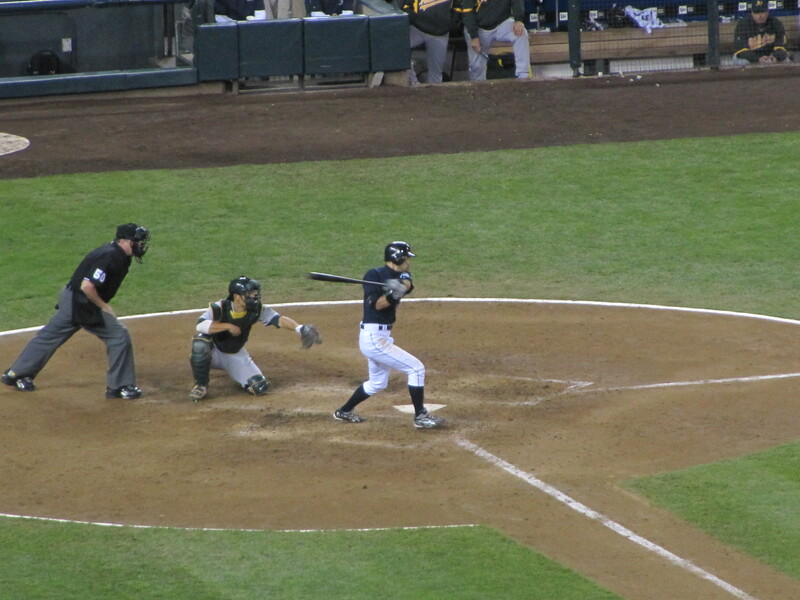 He came up empty on that hack, and then hit a foul pop out to first base. 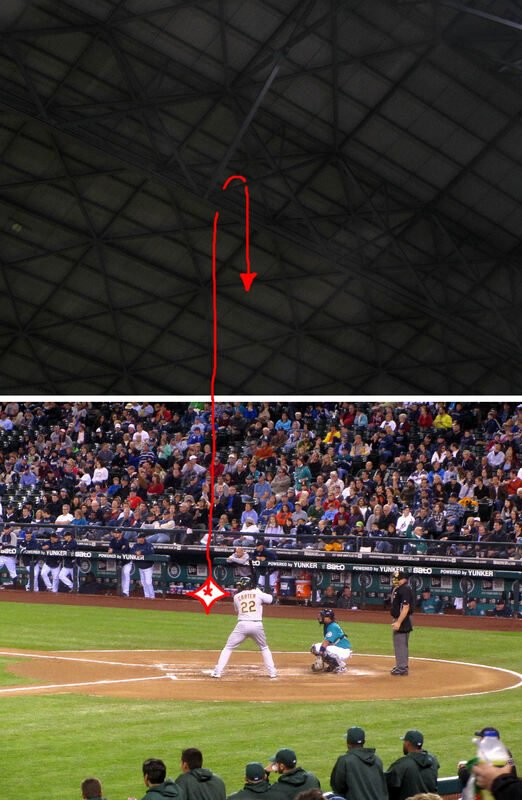 Tim grabbed his glove and tried to catch specific drops as he tracked them on their way down to earth. 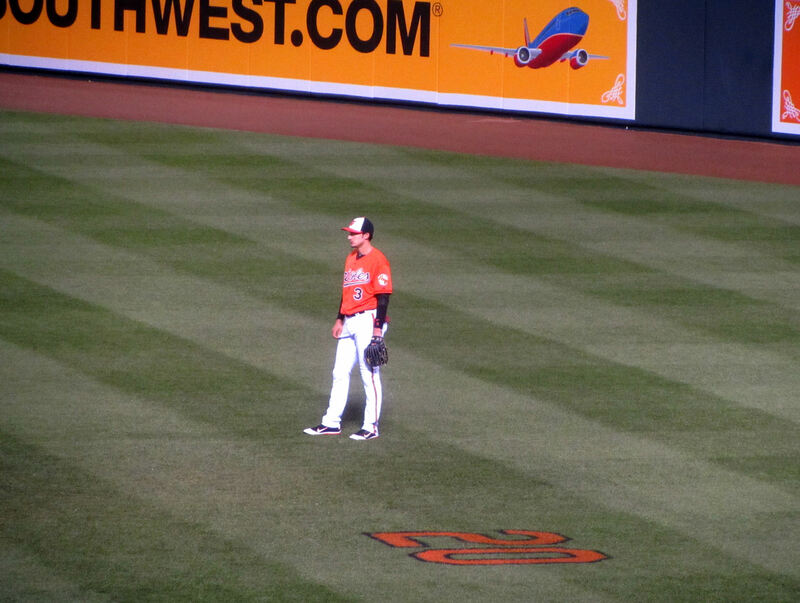 While we were out in LF, Adam Jones led off the top of the third inning with a single and then scored the Orioles sixth run of the night on a double by Wilson Betemit. That made it 6-0 Orioles. 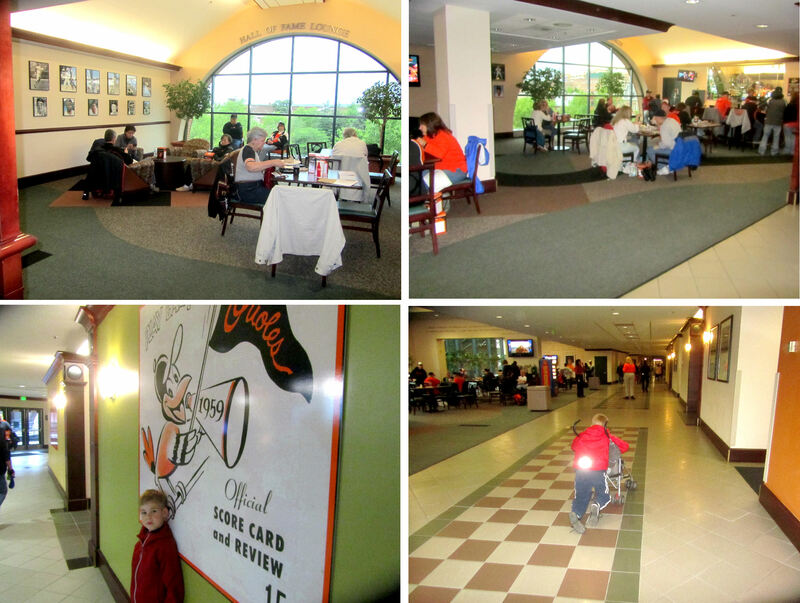 Things were looking good for the Orioles on a night dedicated to celebrating Frank Robinson. 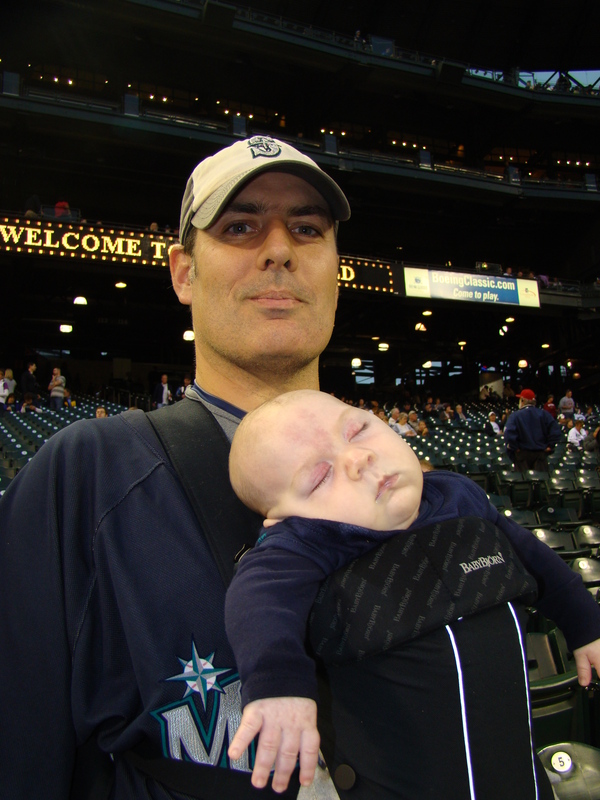 Tim and I watched for foul balls (and a couple came somewhat close to us) while Kellan relaxed in my arms, never quite falling asleep. 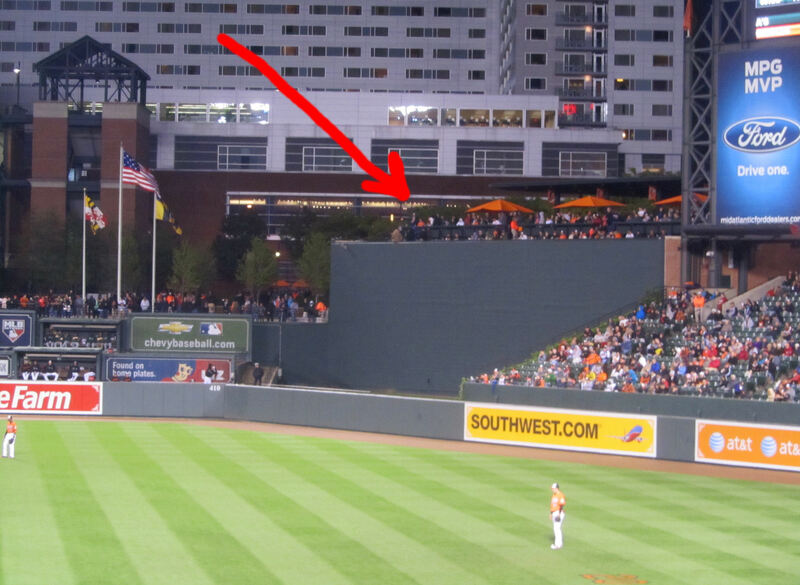 During the seventh inning stretch, the Orioles Bird (as he is prone to do) sat on the ledge of the TV booth behind home plate. Kellan totally loved it and he repeated “BIRD!” about 800 times. 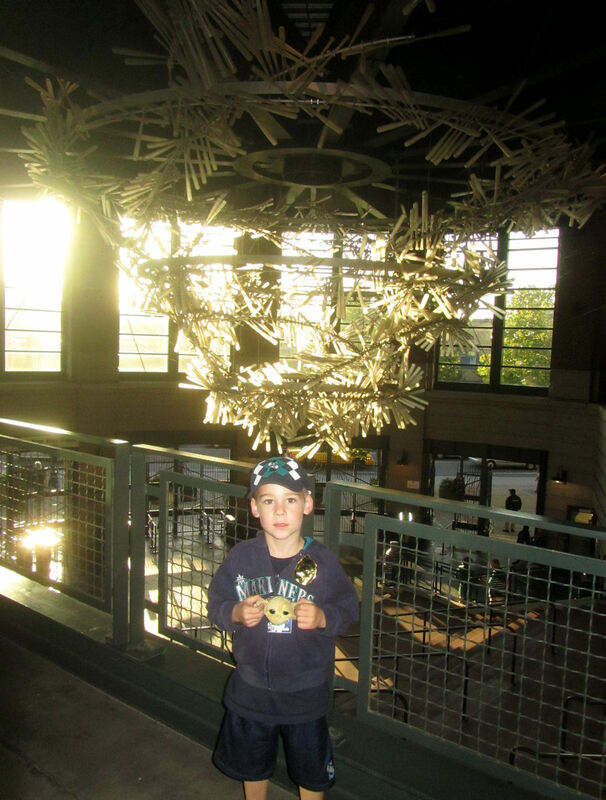 While the Bird was up there, Kellan’s “BIRDs” were declaratory (i.e., “there is a bird!”). Then, after the Bird left the ledge, Kellan’s “BIRDs” turned inquisitive in nature (i.e., “where are you, bird?”). It was pretty cute. 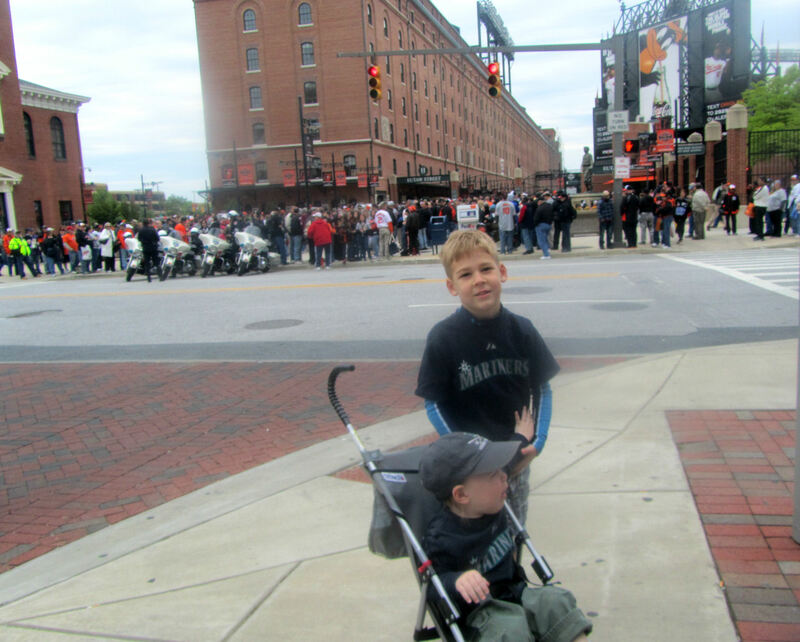 The homerun cleared the flag court and crashed down on Eutaw Street. 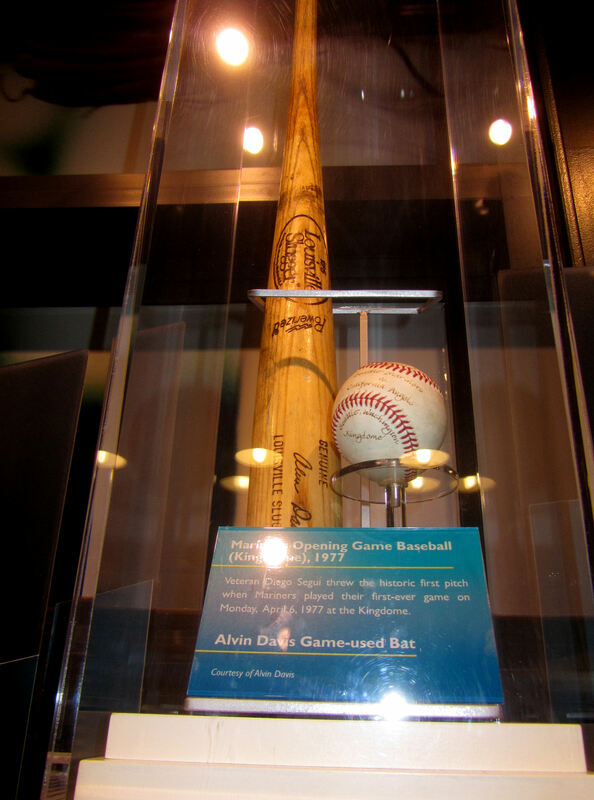 After the game, I heard one of the TV announcers mention that it was the 25th Orioles homerun to land on Eutaw Street…or maybe Davis was the 25th Oriole to hit a homerun out to Eutaw Street, I’m not quite sure. 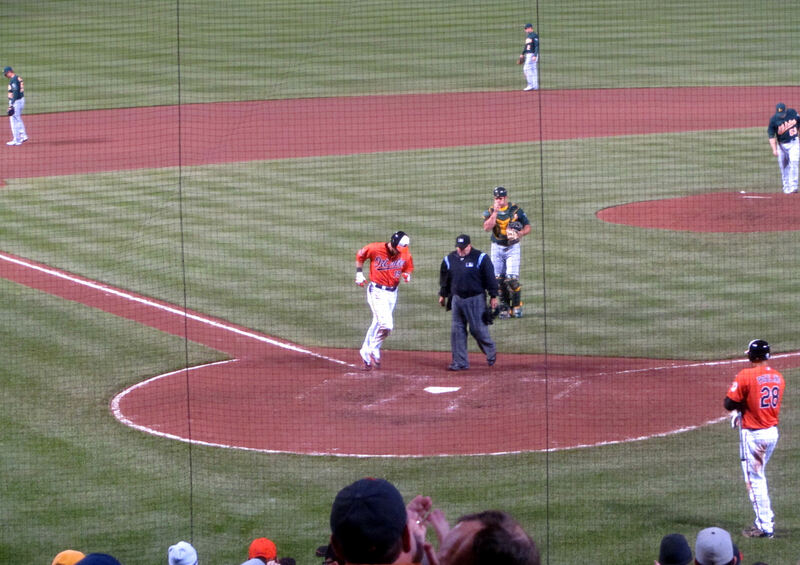 I missed some scoring, the Davis blast made the score 10-1 Orioles. 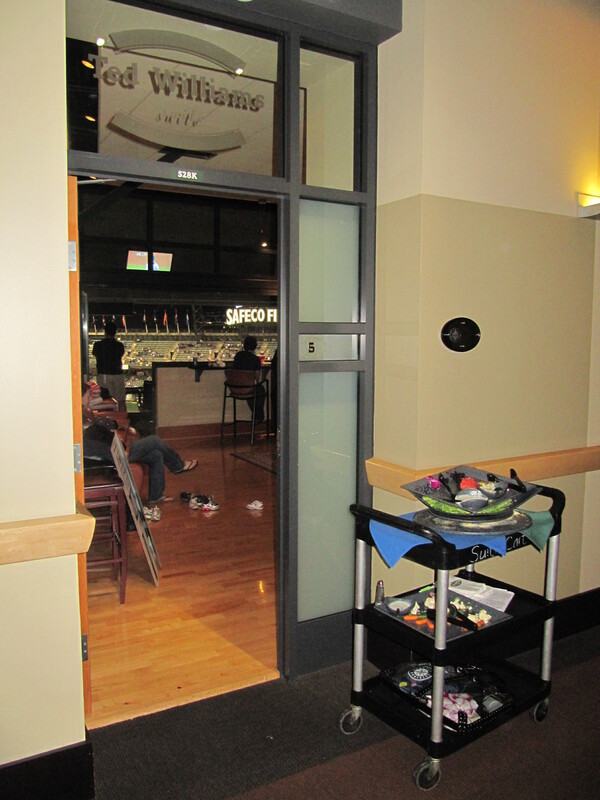 We decided to head back up to the Club Level where we had left Kellan’s stroller at the front desk. We really went up there because Tim wanted to see Avi. 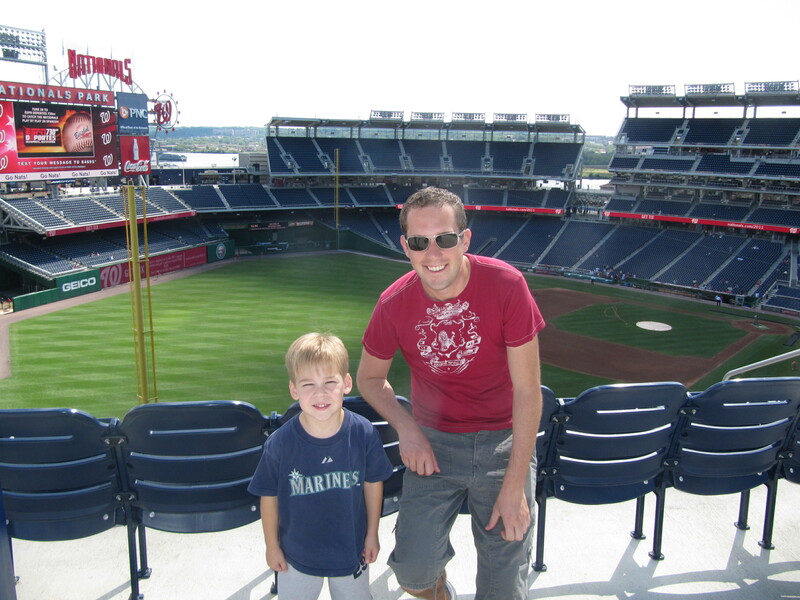 We met up with Avi and watched Bryce Harper’s first at bat of his MLB career…an incredibly weak groundout to the pitcher. 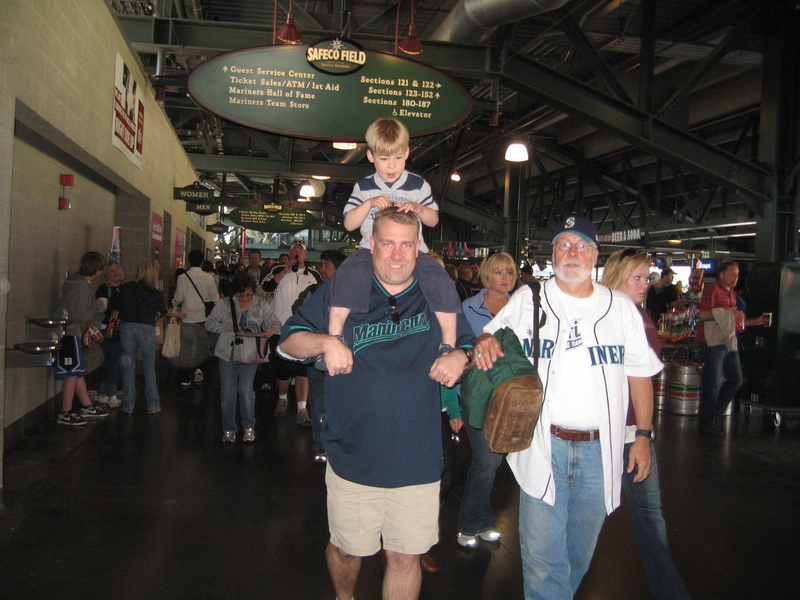 And then we all (including Avi) headed back down to the Cross Aisle behind home plate. 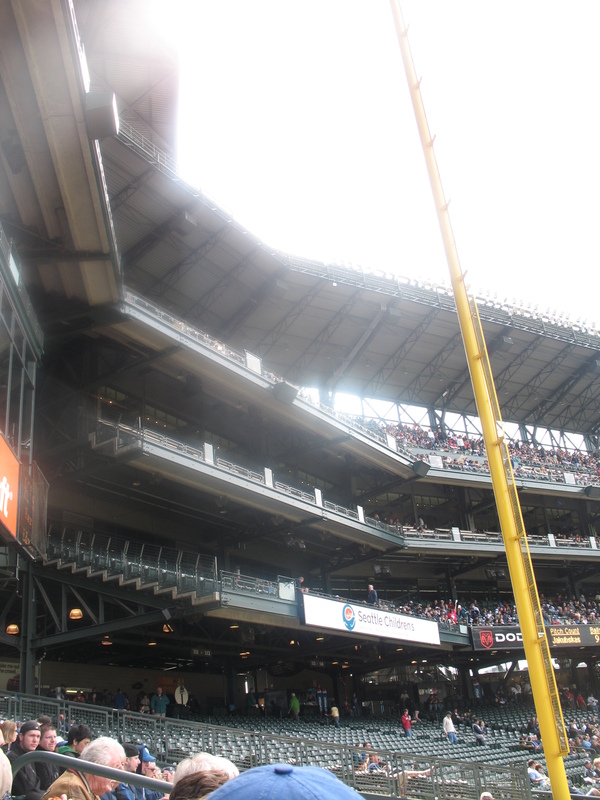 As we approached our spot, someone hit a foul ball to the guy sitting next to the person directly behind/above the spot where we had been standing for several innings. 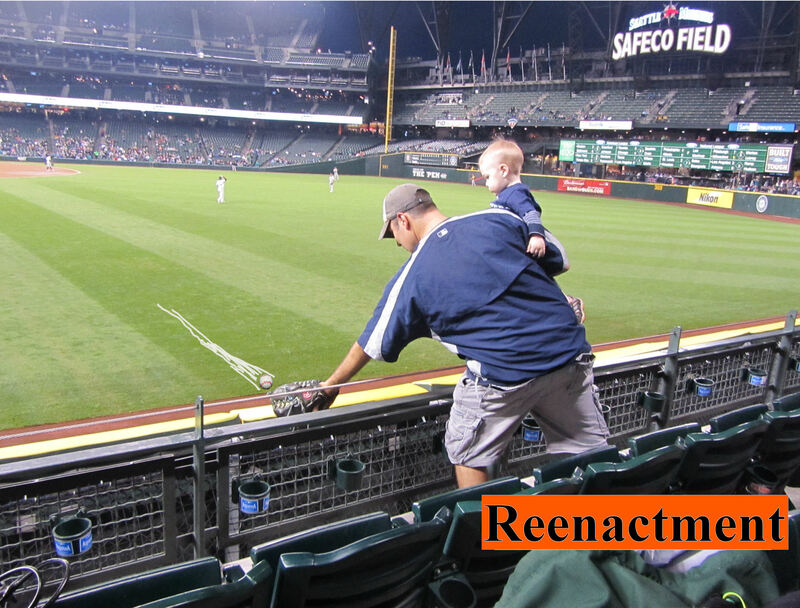 Had we been there, I might have had a play on it, but it would have required me to make a jumping catch above my head while holding Kellan, which would have been very difficult. We still could have got it if the ball had bounced down into the Cross Aisle, but the guy took the ball directly to his gut, and it fell harmlessly to his feet for an easy pick up. 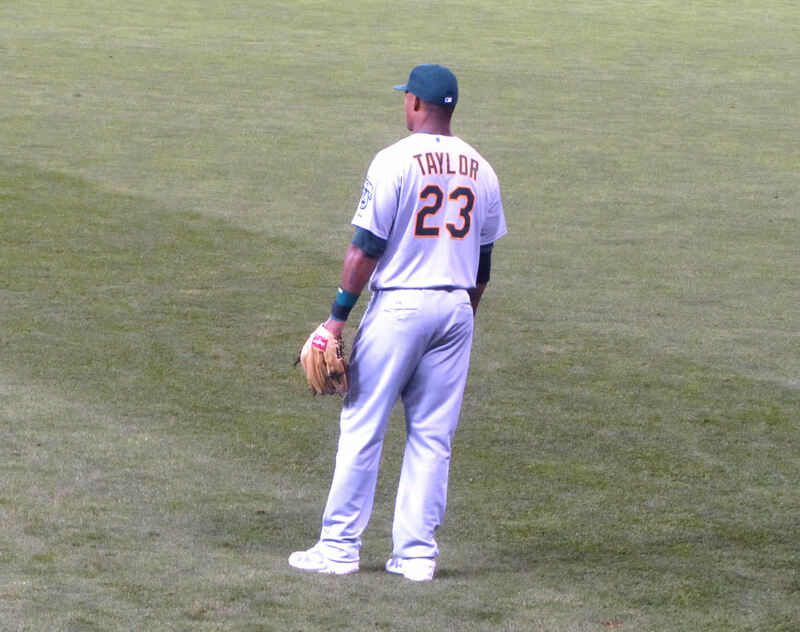 He was from Oakland (or at least he was decked out in A’s gear) so it was no doubt a cool moment for the guy. Anyway, we went back to our same spot. Over the course of a bunch of innings standing in the Cross Aisle, none of the ushers ever told us to get out of there. 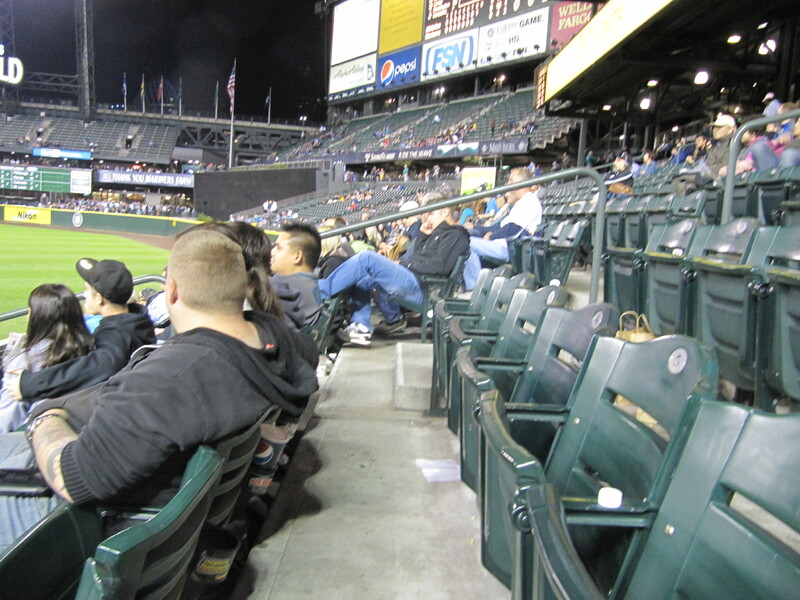 In fact, one of them eventually came and said, “Hey, why don’t you just sit down right here?” He was concerned that someone else running for a foul ball might fun us over. …but the scoring was done for the night. 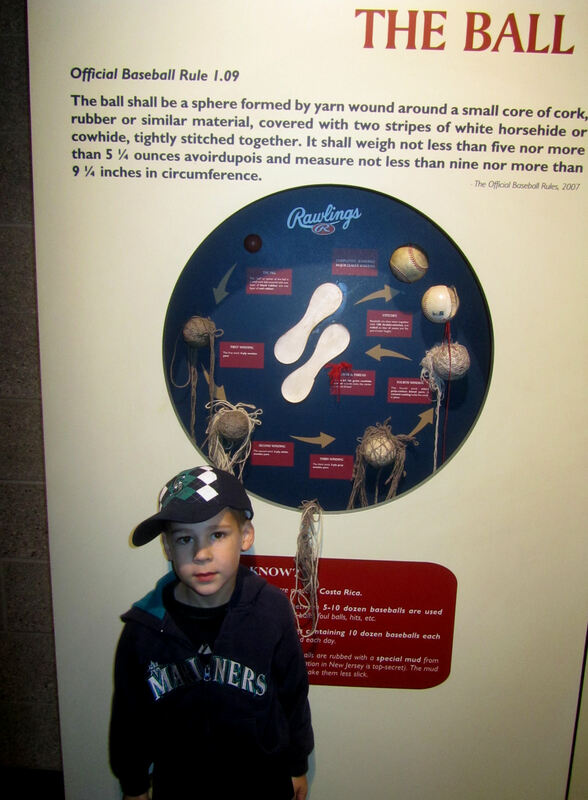 We kept moving forward because I wanted to go for an umpire ball. As we got closer and closer, about 10,000 kids, teens and adults all flocked to the tunnel with the same idea. 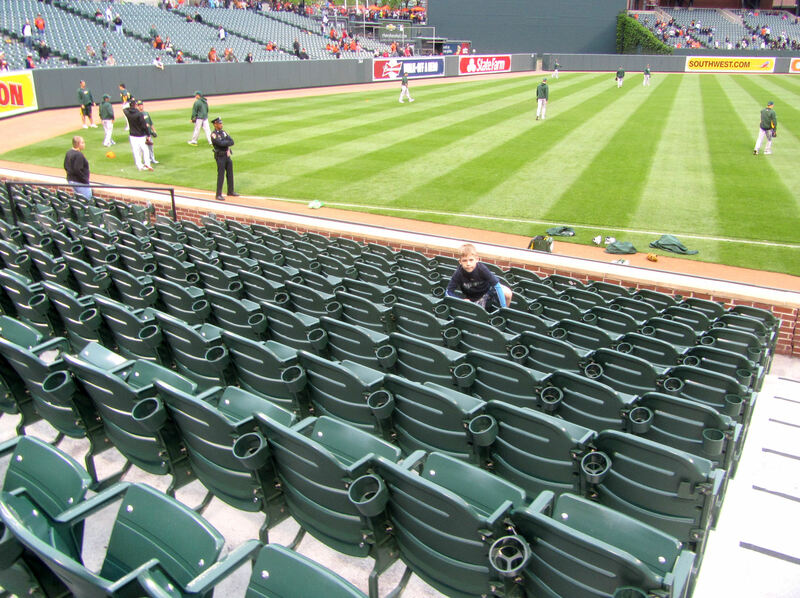 I guess everyone wants one of those nice commemorative Camden Yards 20th Anniversary baseballs. 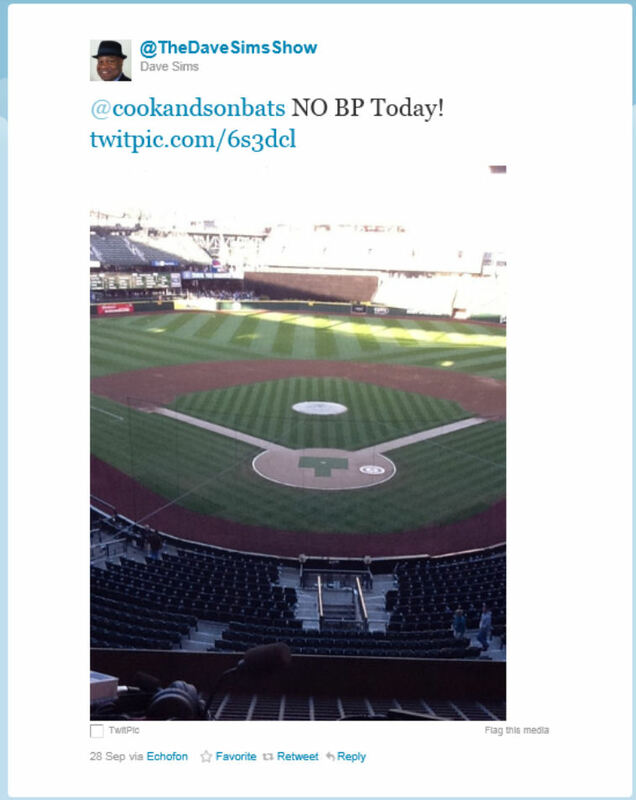 We made it to the very bottom spot and we were the first people there when home plate umpire Eric Cooper left the field of play. 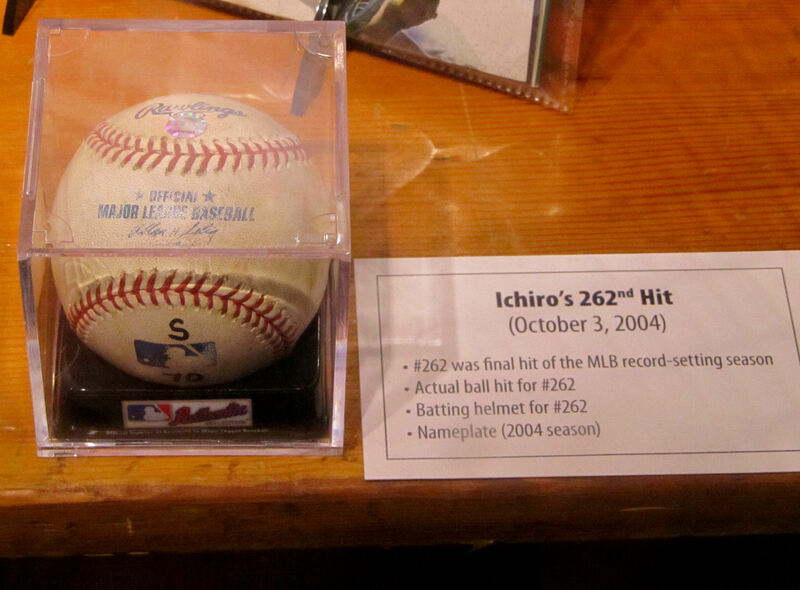 But he completely ignored everyone and gave out zero of those fancy commemorative baseballs. 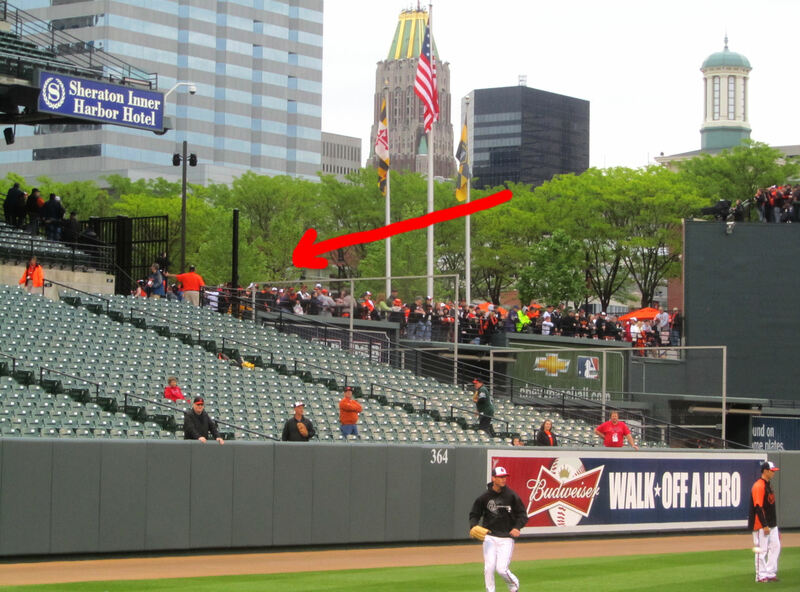 We had one more idea – get over to the Orioles dugout (which was packed with fans) to see if anyone might toss up a commemorative baseball over there. But that doesn’t mean there was *no luck* — indeed, there was a lot of luck left hanging in the night air. As Orioles bullpen catcher Ronnie Deck approached the dugout, I called out, “Hey, Ronnie!” and gave him the obligatory *hit me* glove flap. 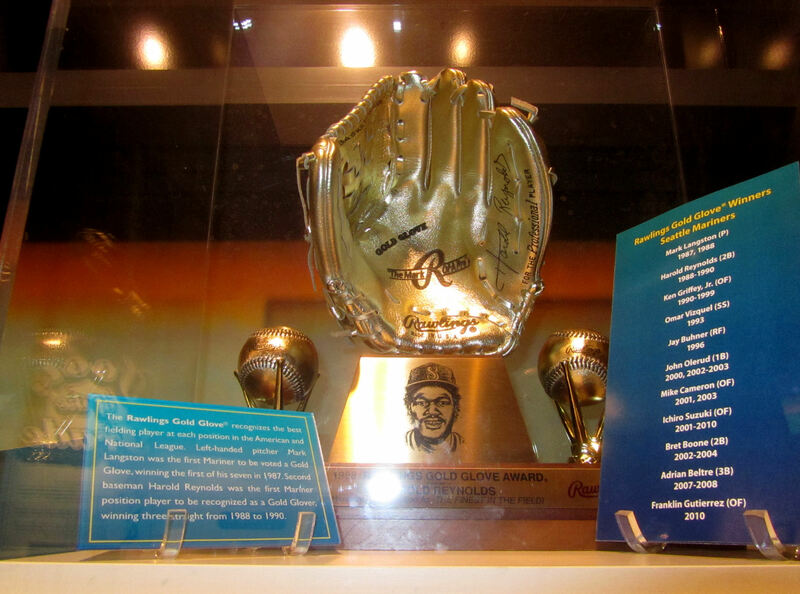 He had an equipment bag (which no doubt had a commemorative baseball nestled inside) hanging from his shoulder, but Ronnie just held out his open glove to show us *no baseball*, but then he looked down into his glove and gave himself a little *hmmm, okay* shrug. 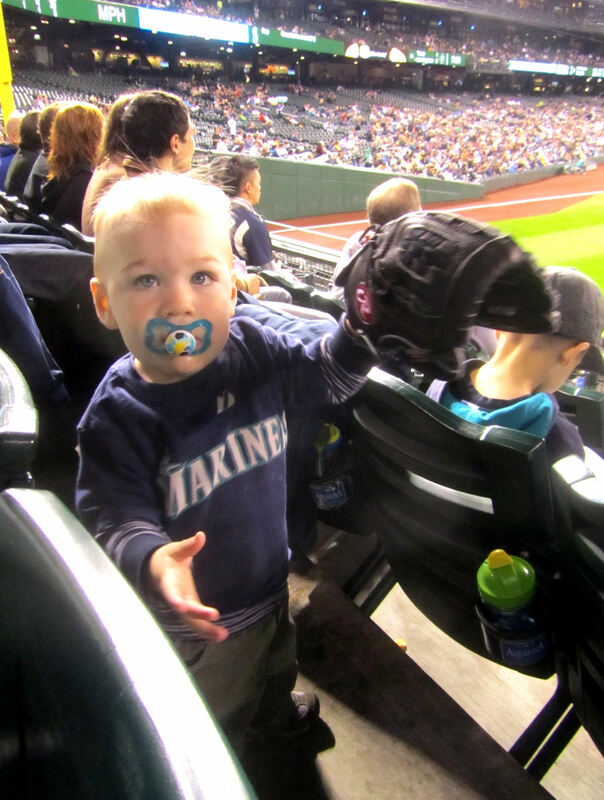 He reached into his baseball glove, grabbed his batting gloves and tossed them to us. 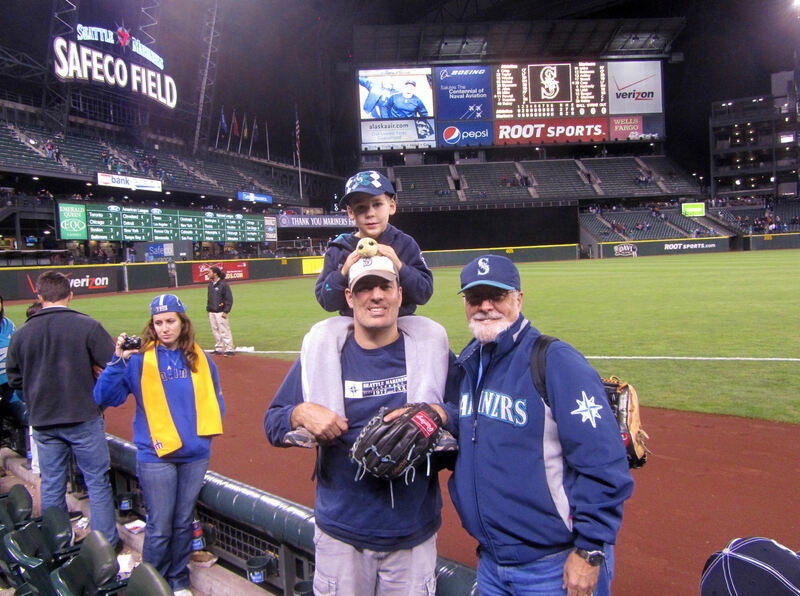 The fans in front of us were nice enough not to intercept the gloves, which were clearly intended for us but would have been easy for another couple fans to catch before they reached us, and I caught them in my baseball glove. 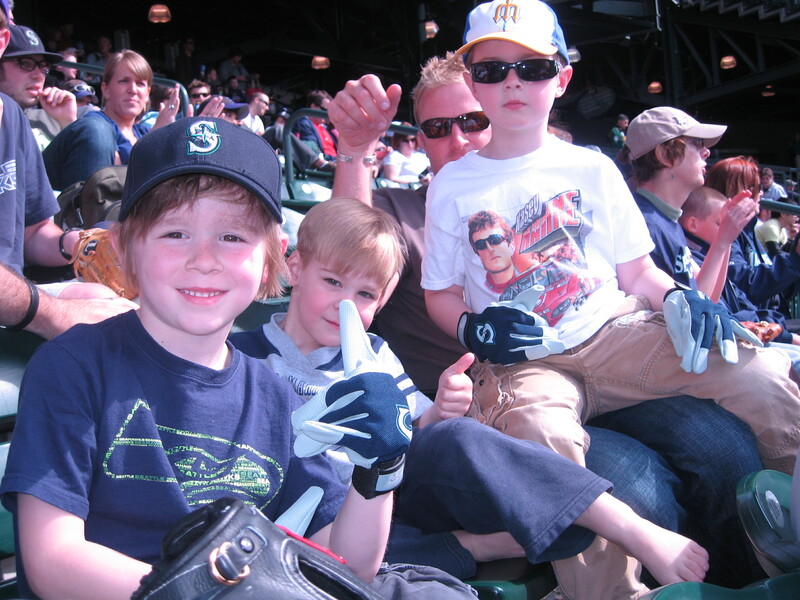 Tim was SUPER-EXCITED about these batting gloves. Note the cool “20” with a spot light on the side of the warehouse behind Tim. Cool. 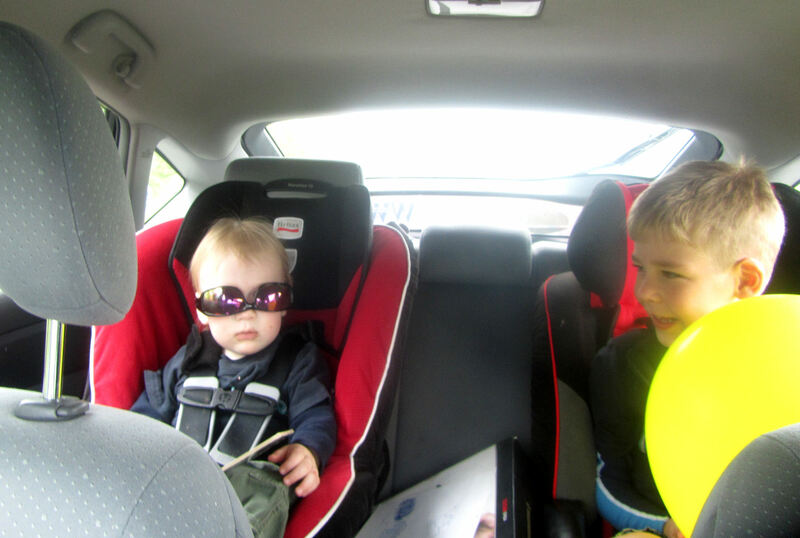 When we got to the car, Tim told me not to tell mommy about the gloves. They were a secret. When we got off the phone, he asked if he could show her something when he got home. Something secret. He slept then entire ride home (as did Kellan). 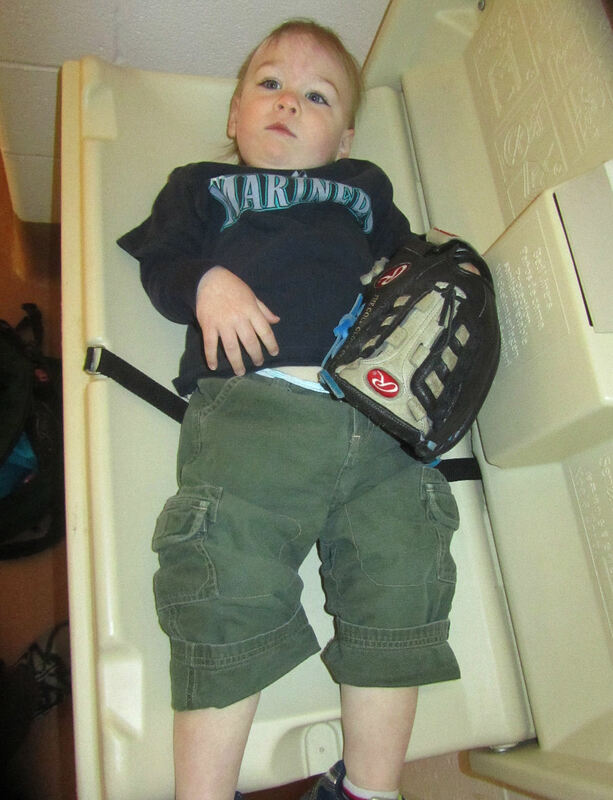 But at 1:00 a.m., Tim let mommy in on his little secret before hopping into his bed. 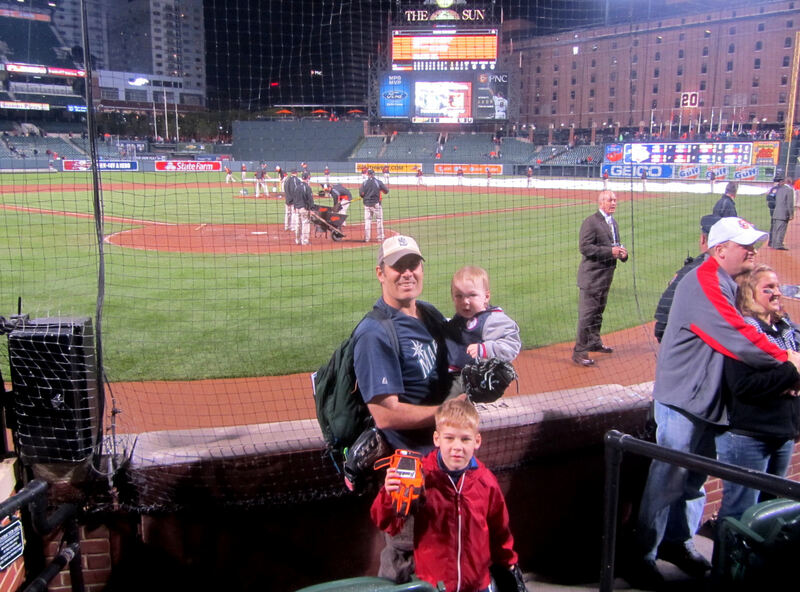 So, there you go, a great night of baseball at Camden Yards. 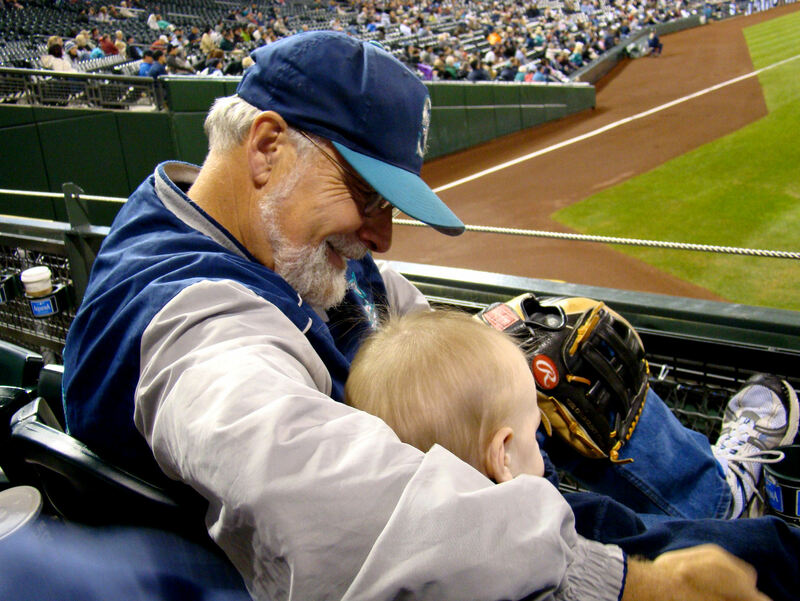 Now we have an off-week and then it’s time for the Fifth Annual Cook Grandfather-Father-Son Baseball Roadtrip. 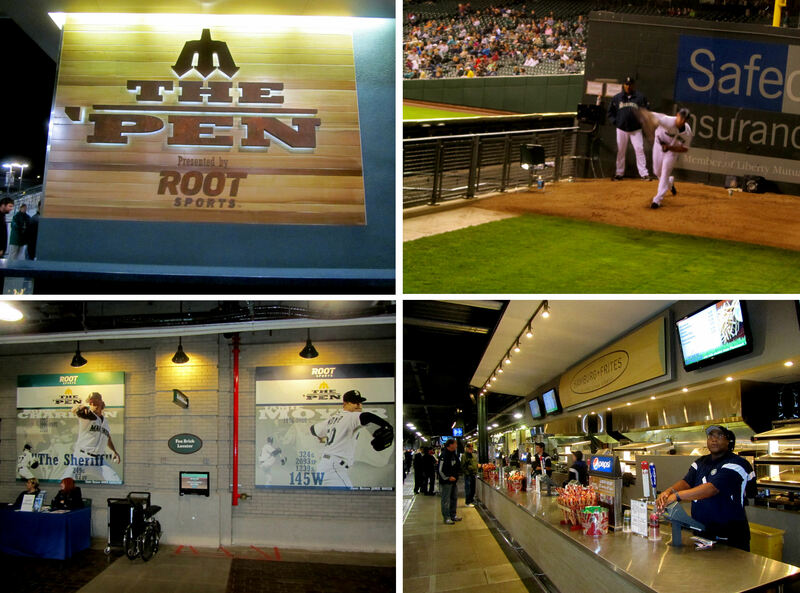 It is going to be an AWESOME trip this season with stops in Minnesota, St. Louis, Kansas City, and Denver. 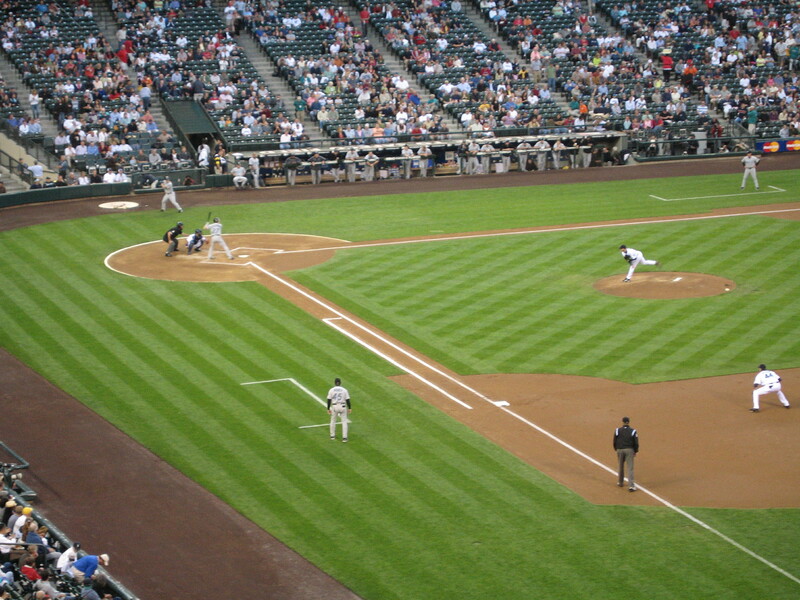 Our Mariners/Rockies games in Denver will mark a major milestone for me and Tim: we will finally have seen all thirty MLB teams play a home game (of course, with the opening of Marlins Park this season, we now have to go back to Miami before we can say we have been to every current MLB stadium – that will happen in September!). This season’s GFS Roadtrip will also be extra special because it will feature a new and improved lineup: Jim, Todd, Tim and Kellan! That’s double the “Sons” and double the fun! 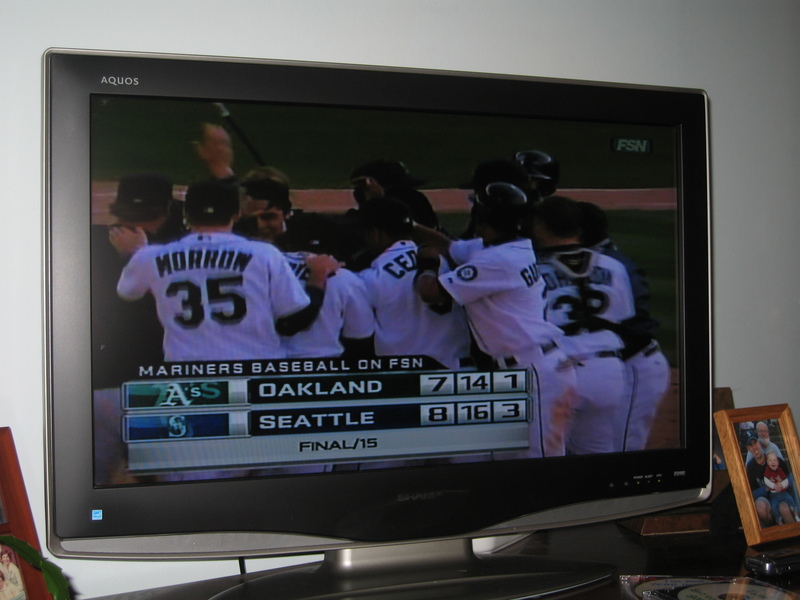 October 1, 2010 was a big day, and its going to result in a BIG game report. Here we go. 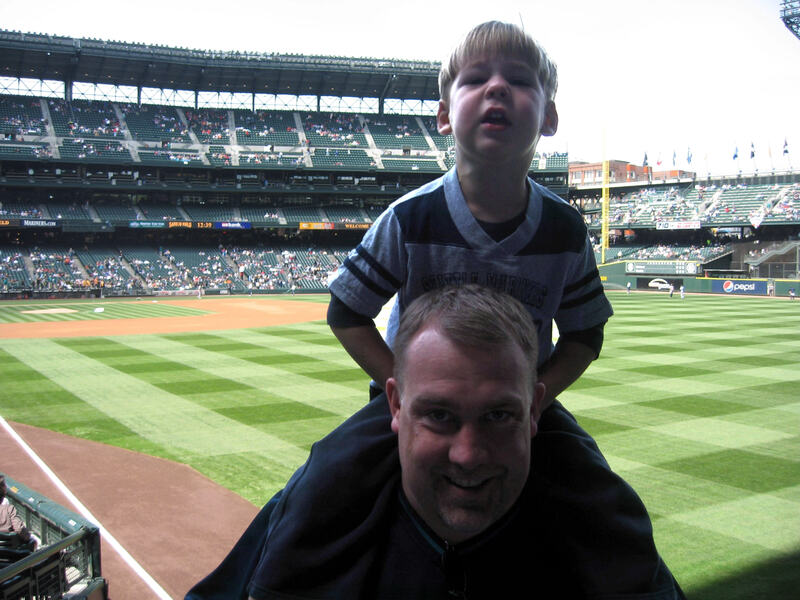 For this extra special game, I decided to don my extra special jersey: my official Mariners Ryan Rowland-Smith No. 18 jersey. 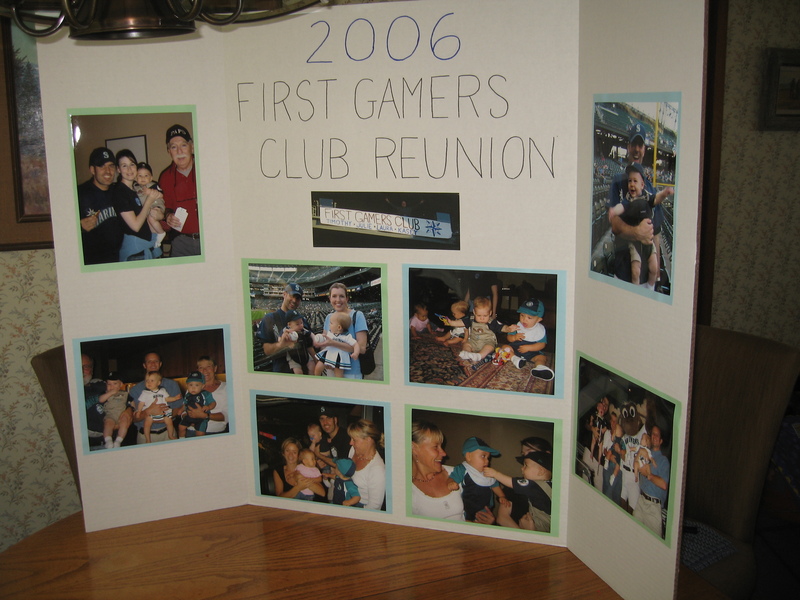 On September 12, 2006, we celebrated the first “First Gamers Club.” The guests of honor (the “First Gamers”) were Tim, Julie (my cousin Janet’s daughter), Laura (my cousin Daniel’s daughter), and Kasey (our family friends’ grandson). 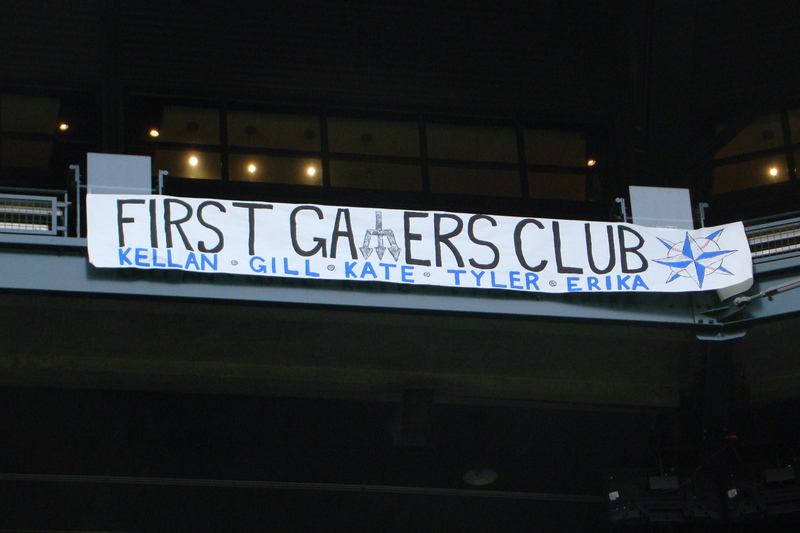 With the exception of Laura, all of the 2006 First Gamers would be in attendance for the second First Gamers Club celebration. This time, the guests of honor would be Kellan, Gill and Kate (Kellan’s and Tim’s only first cousins (my sister-in-law Kimberly’s and brother-in-law Kevin’s kids)), and Tyler and Erika (my cousin Janet’s 3-year-old twins). 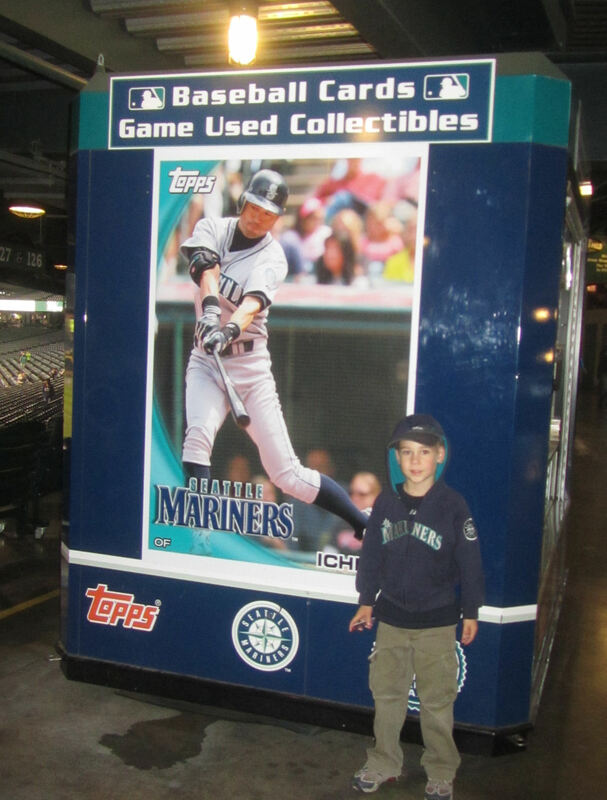 It was quite the chore to keep Tim from playing with (and thereby destroying) his Felix and Griffey cards during the game. He was very excited about them. 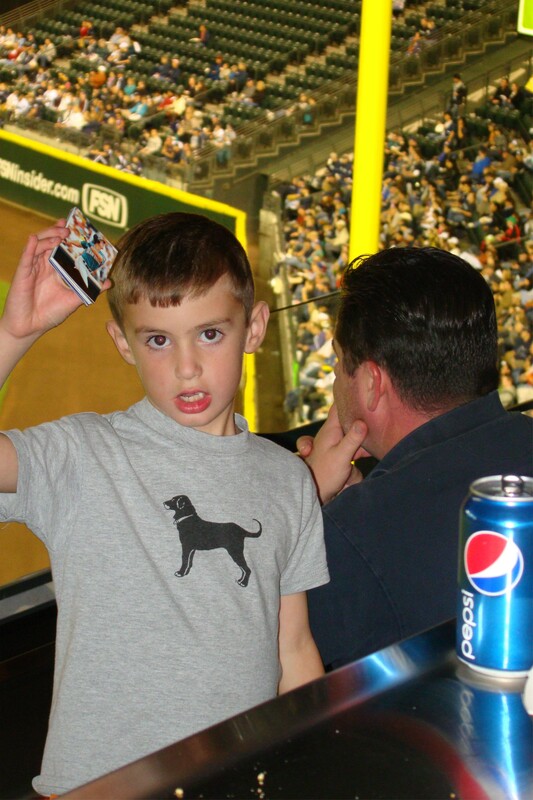 I kept them safe and let him play with (and destroy) several less important cards he also received from ushers during BP. 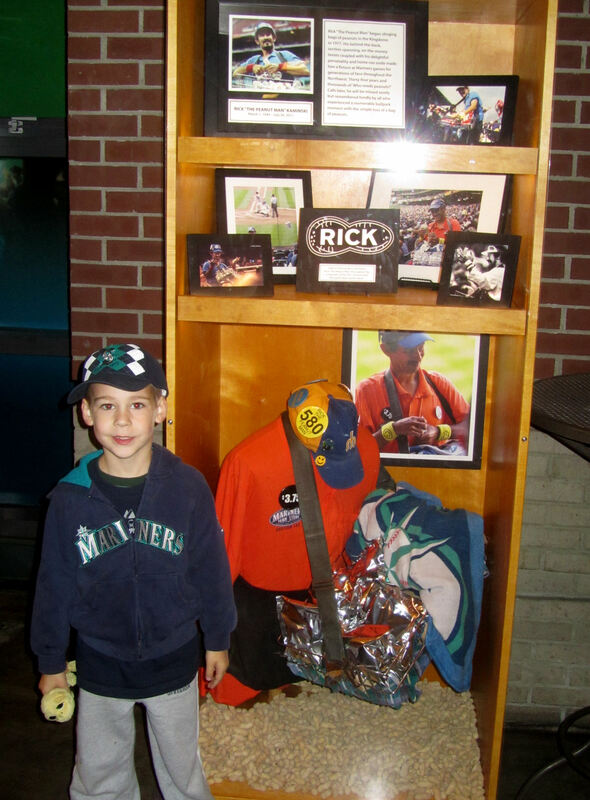 When we made it to the field level, Tim and Colleen headed to the team store where Tim got some cool Mariners athetlic shorts (pictured throughout this entry) and Kellan and I reported directly to the RF foul line to watch BP. 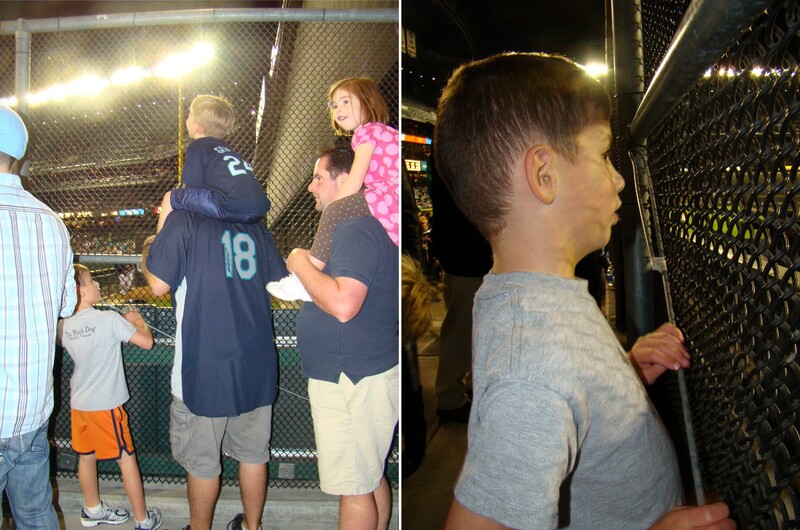 We watched BP from almost the exact same spot from which Tim and I watched BP at his first game. 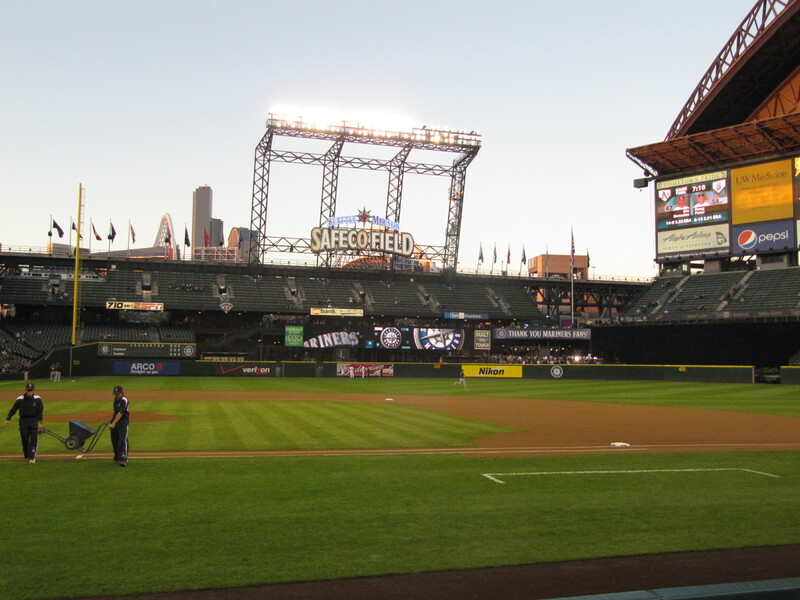 The only disappointing part of the pre-game events was that the Mariners were already off of the field when we arrived. 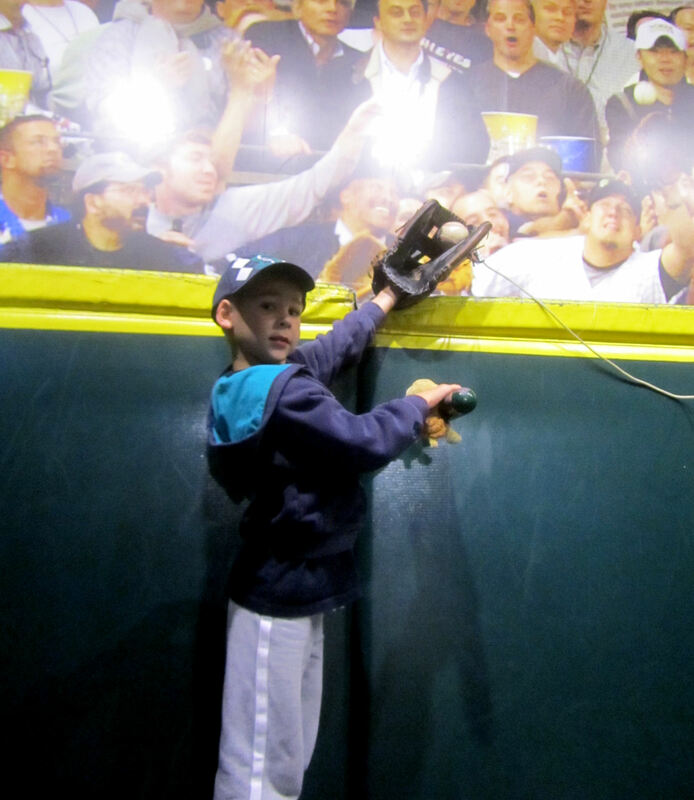 So Kellan’s first BP was limited to the visiting Oakland A’s. Bobby Cramer was very nice. 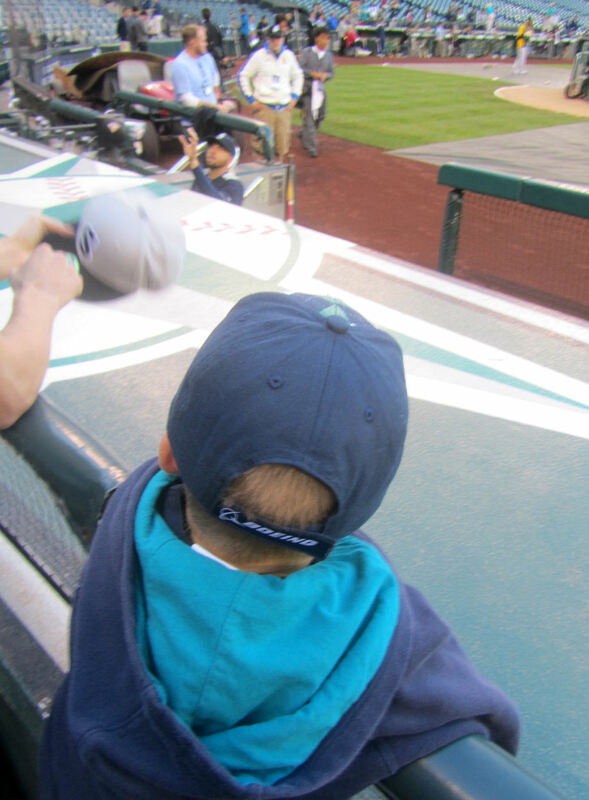 We chatted a little bit during BP and he agreed to sign Kellan’s first baseball after the conclusion of BP. Tim was excited for his little brother. He really loves that little guy. 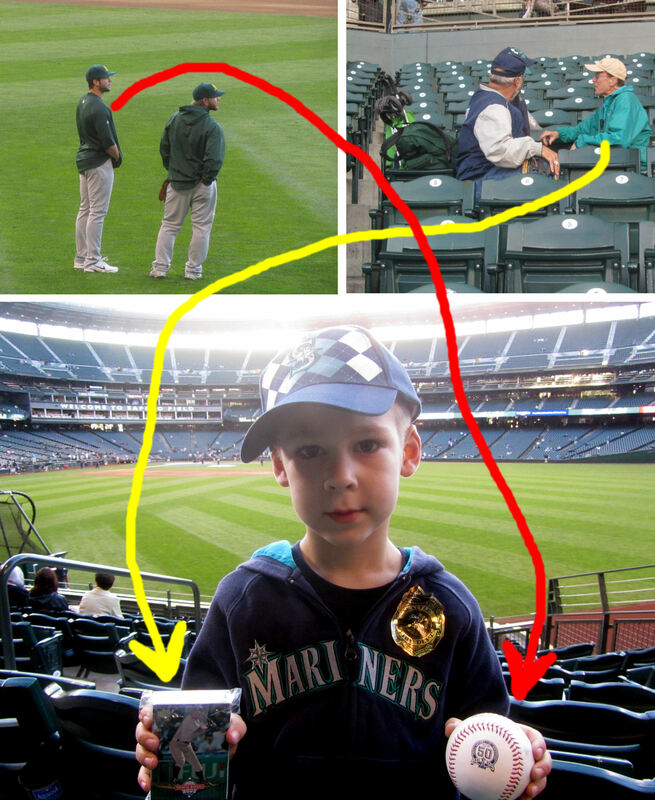 That kid in the yellow shirt explained that the Mariners had stamped some of the BP balls with a “CATCH & WIN” stamp. 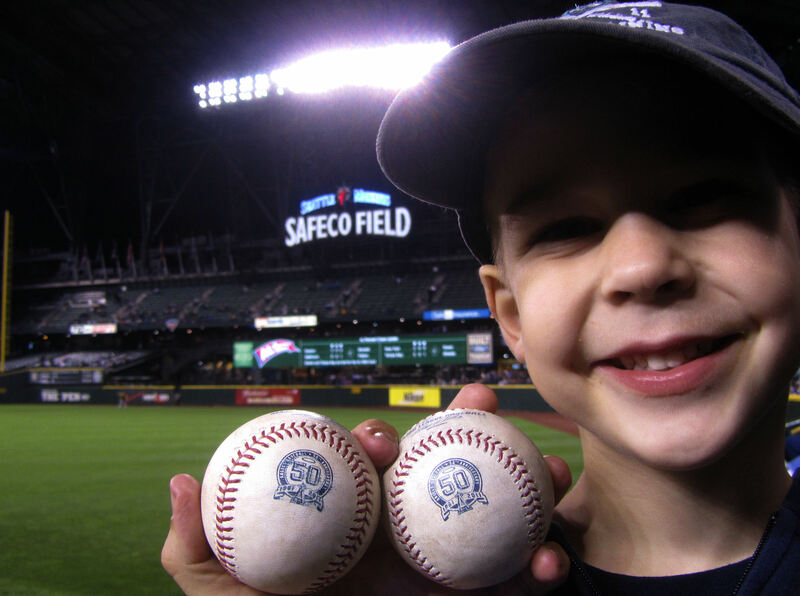 If you caught one of the stamped baseballs, you could turn it in for an autographed Mariners baseball at a prize table in the concourse behind home plate. 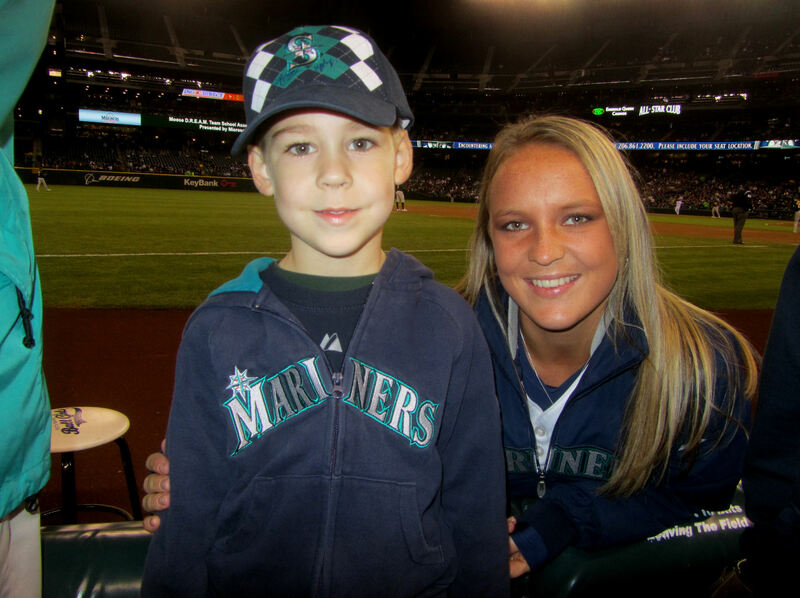 (I guess I should mention that it was Fan Appreciation Night). 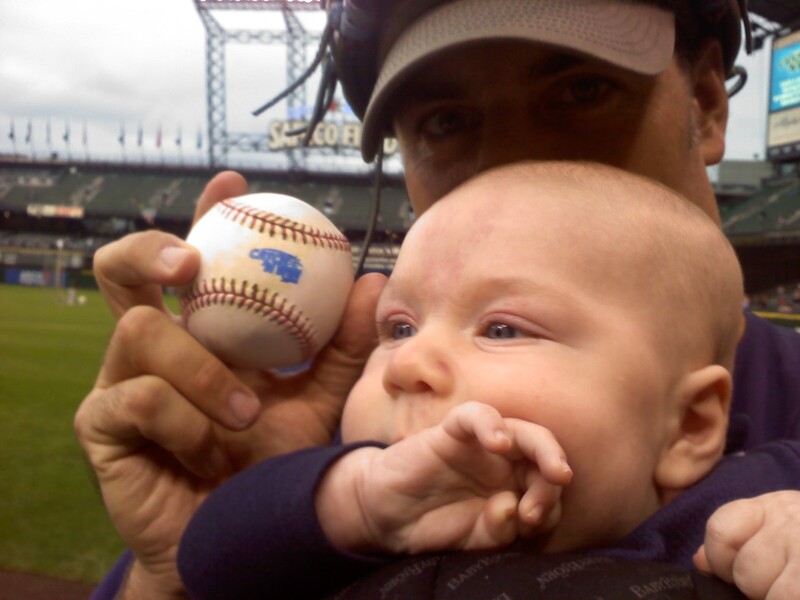 Well, Kellan’s first baseball had the stamp. 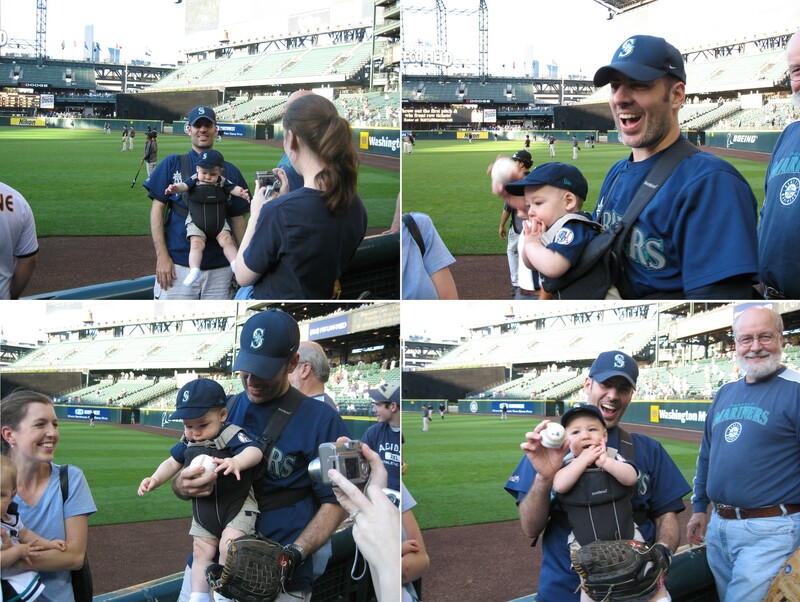 It is visible in the last couple pictures — it looks like a blue blob on the baseball. 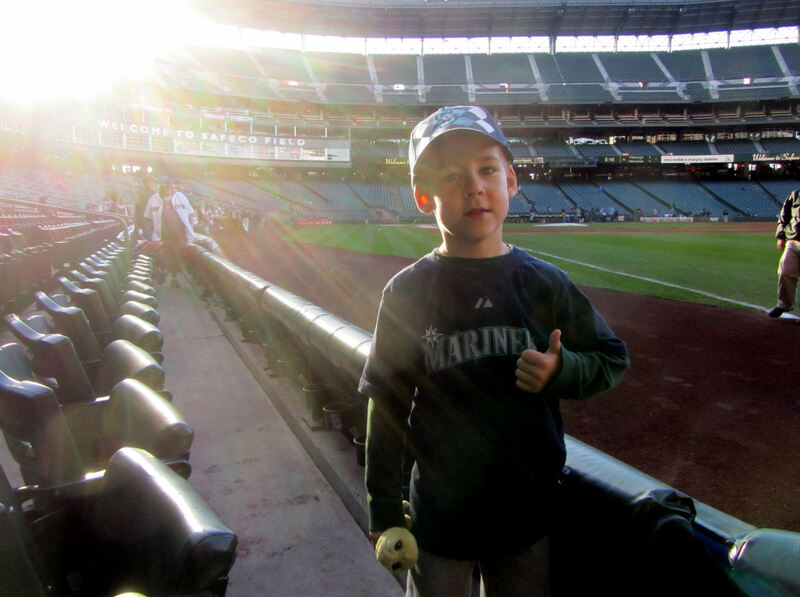 As much as I would like to get an autographed Mariners baseball, there was no way in the world that I was going to trade in Kellan’s first baseball. Julie is in the pink hat just behind Tim. 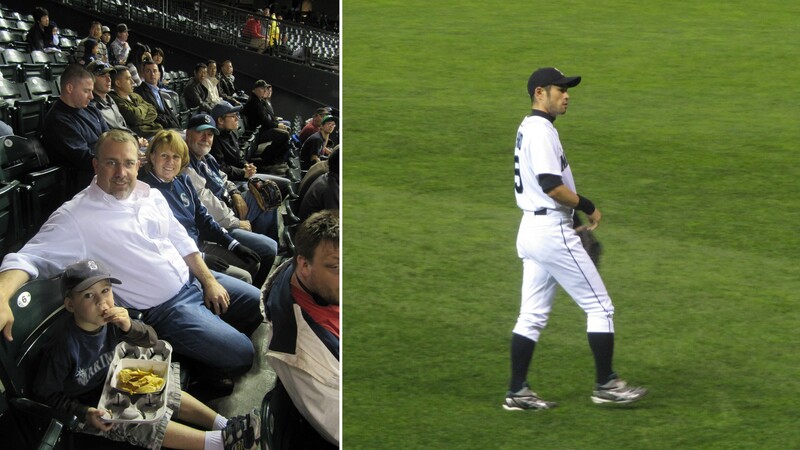 I got a kick out of the fact that Tim and Julie shared their first game together back in September 2006. 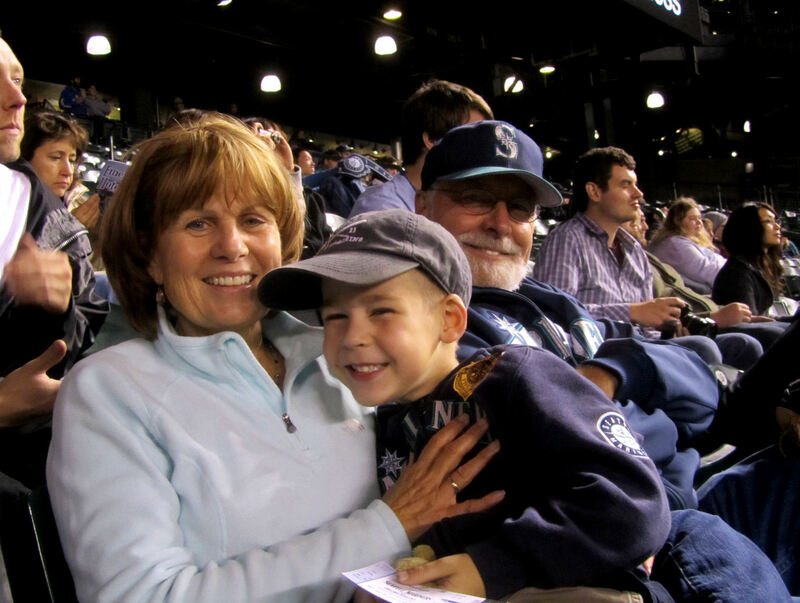 Now, just over four years later, Julie was enjoying her second baseball game while Tim was taking in his EIGHTY-SECOND game! 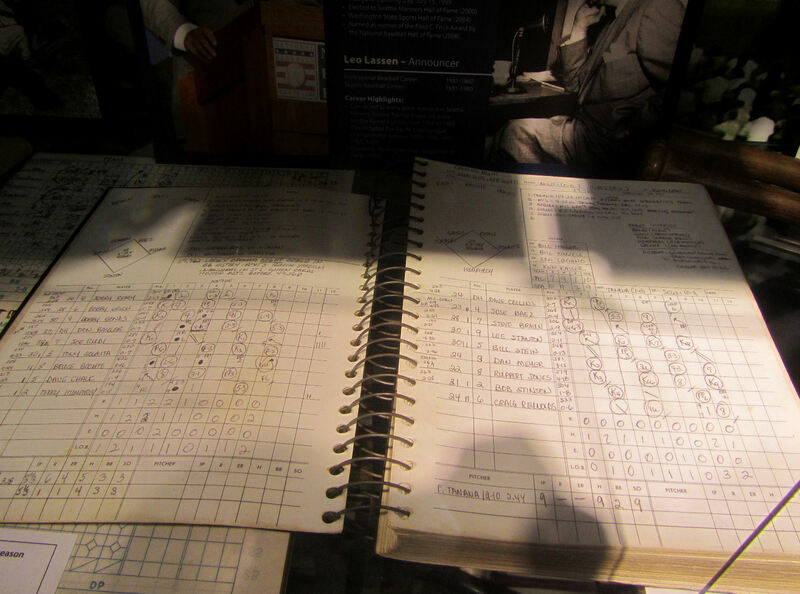 I believe that both of those baseballs also came courtesy of Bobby Cramer. 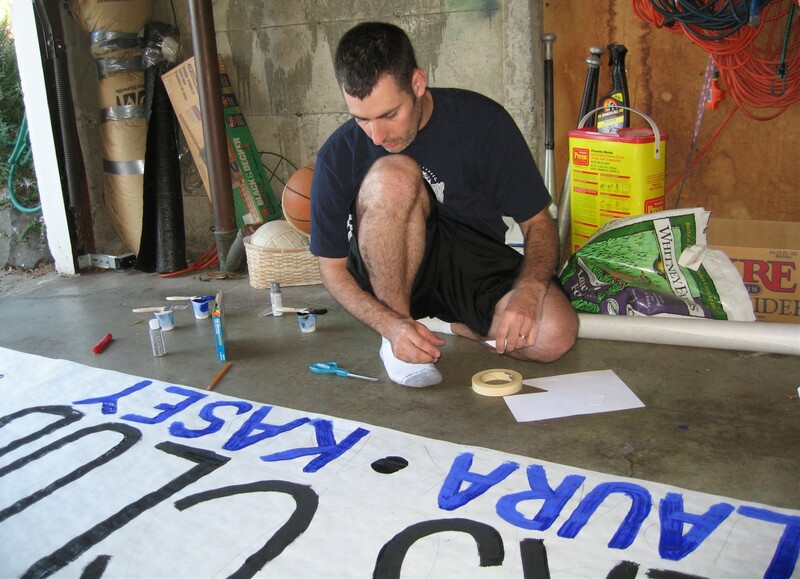 …that features the First Gamers Club sign in the background. 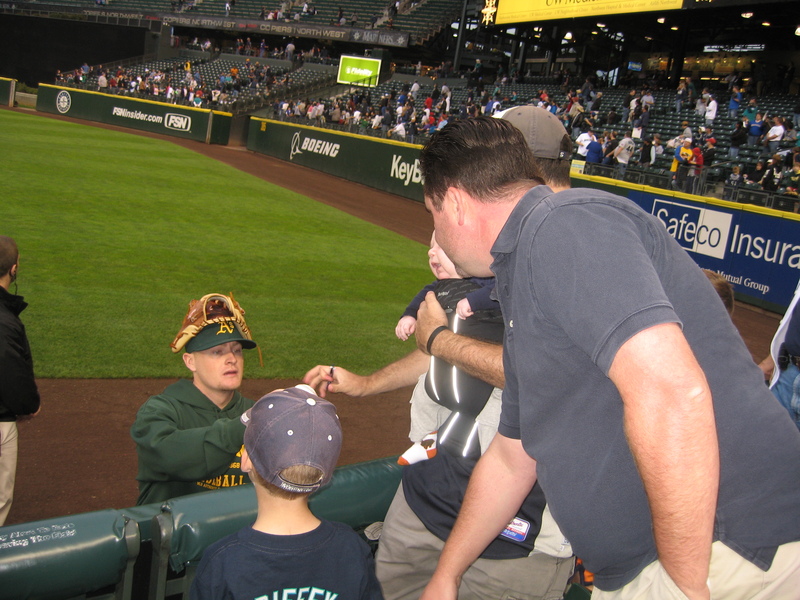 Note that Bobby is using the Cook & Son tried-and-true baseball glove hat method while signing Kellan’s baseball. 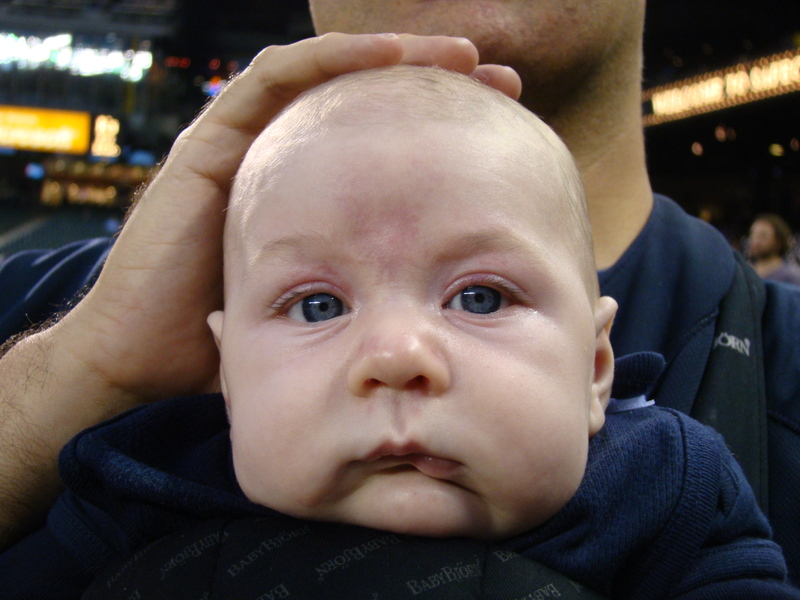 Kellan’s first baseball is pictured below. I am extremely happy with it. 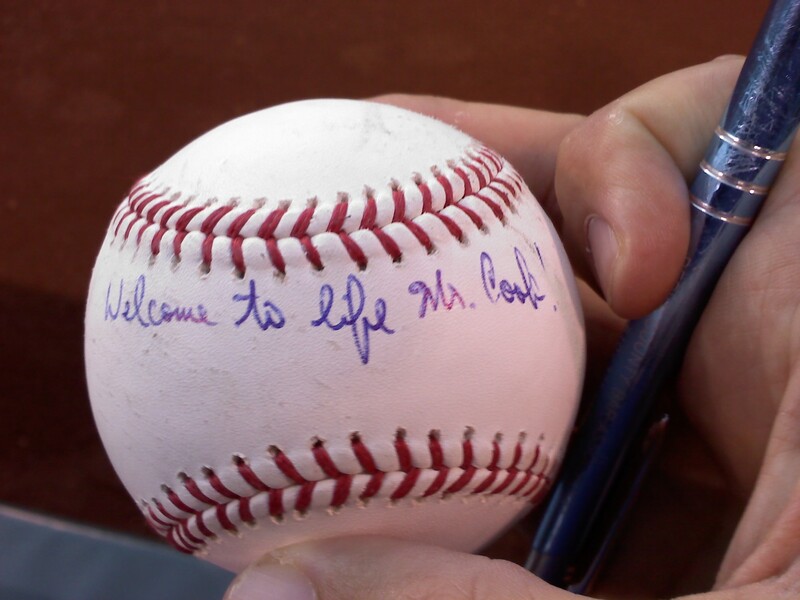 Bobby did an excellent job with his autograph. 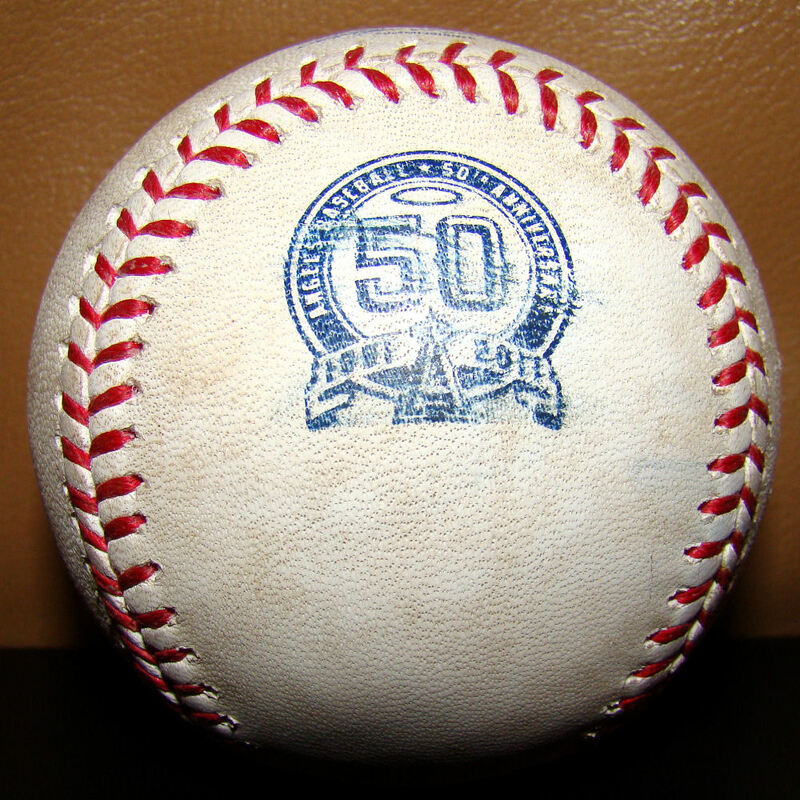 The placement of his autograph and his jersey number (“64”) off-set to the side of the “CATCH & WIN” stamp and a nice grass/dirt smudge easily make it one of the most visually unique and pleasing baseballs in our collection. 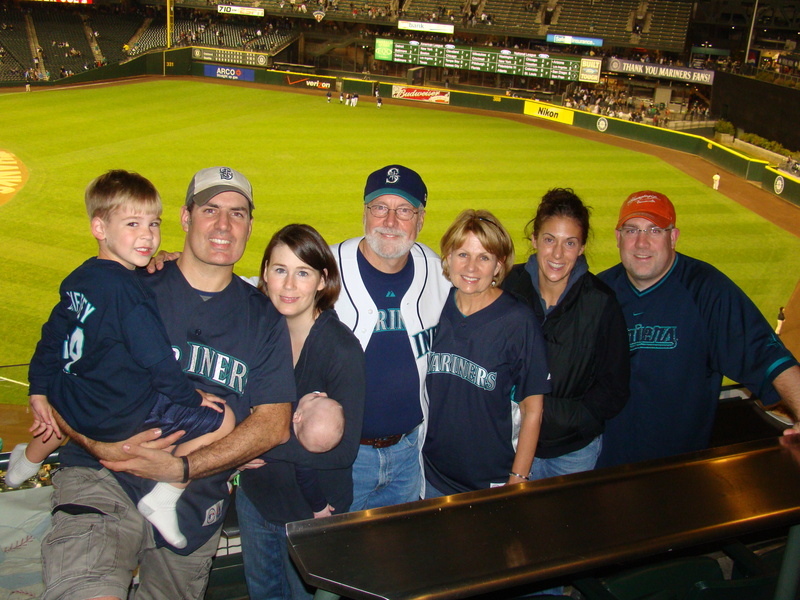 Even if Bobby doesn’t turn out to be an all-star player, he can rest assured that he will always be remembered by the Cook family. BP was great fun with all of the kids. 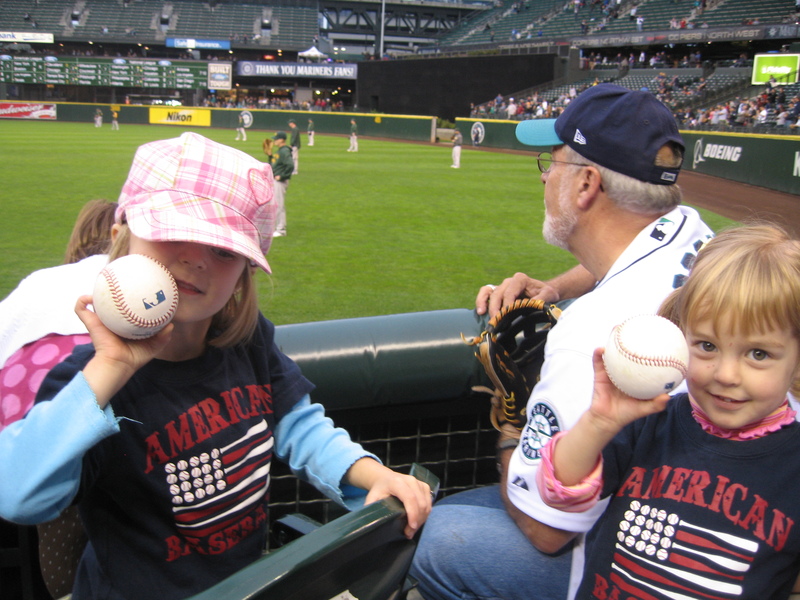 The only regret was that I had not been able to get a baseball for Gill and Kate. 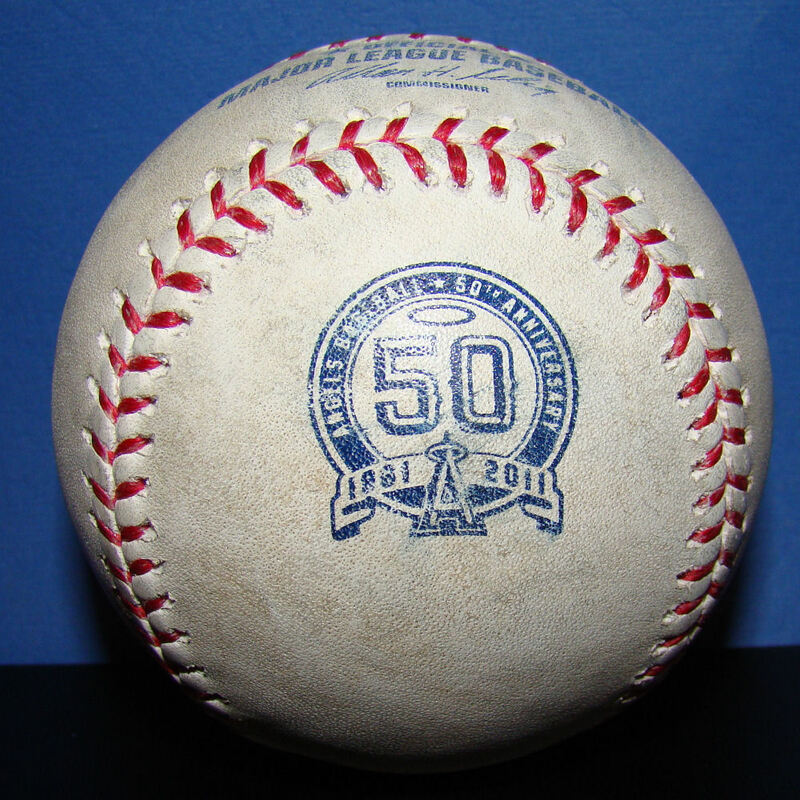 I’d once given Gill a baseball Gil Meche used to do some rehab work at old Yankee Stadium, so they had a real MLB baseball already. 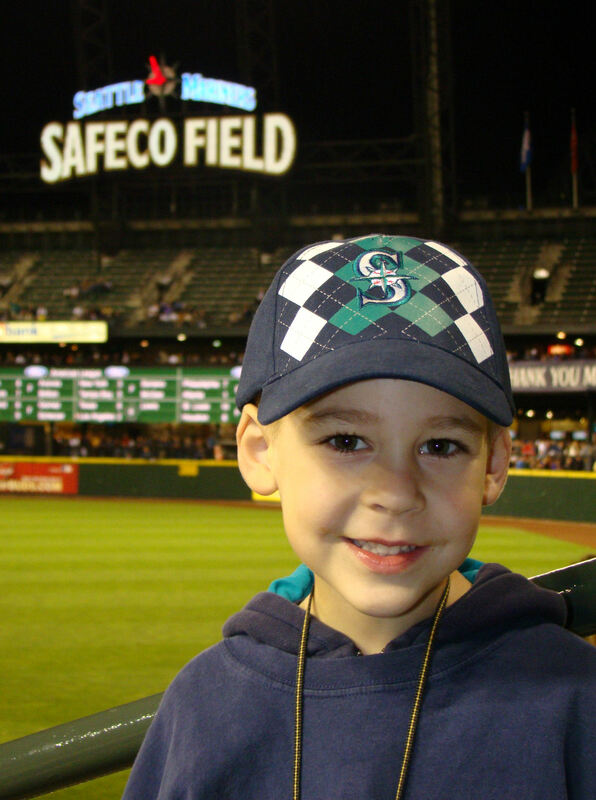 But I was determined that Gill should get one at his first game. At this point, I wasn’t sure how or if that was going to happen. 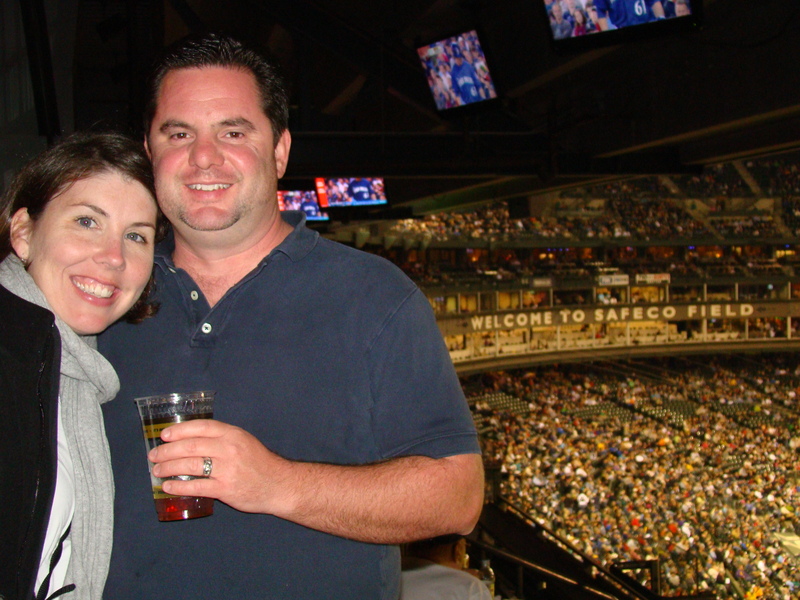 In that picture, you can see the “CATCH & WIN” logo on the big screen behind us. 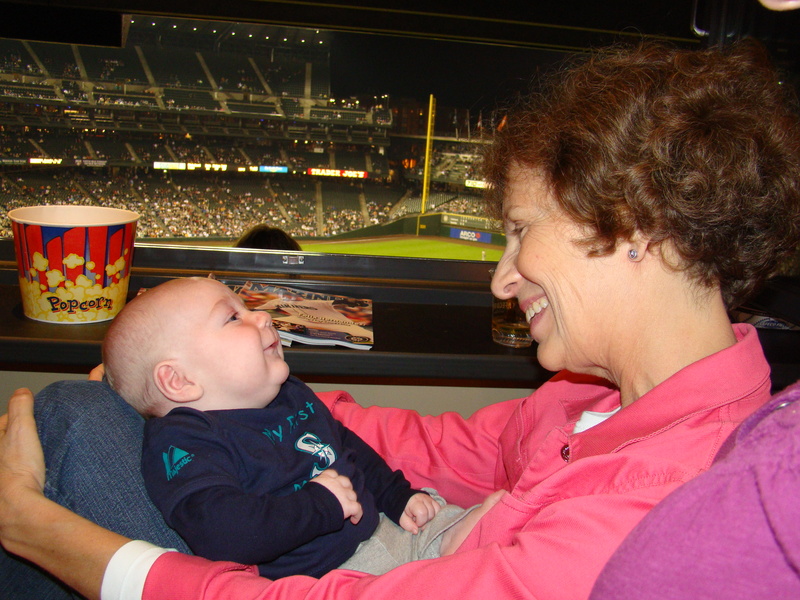 After BP ended, Tim headed up to the suite with his Grandma. 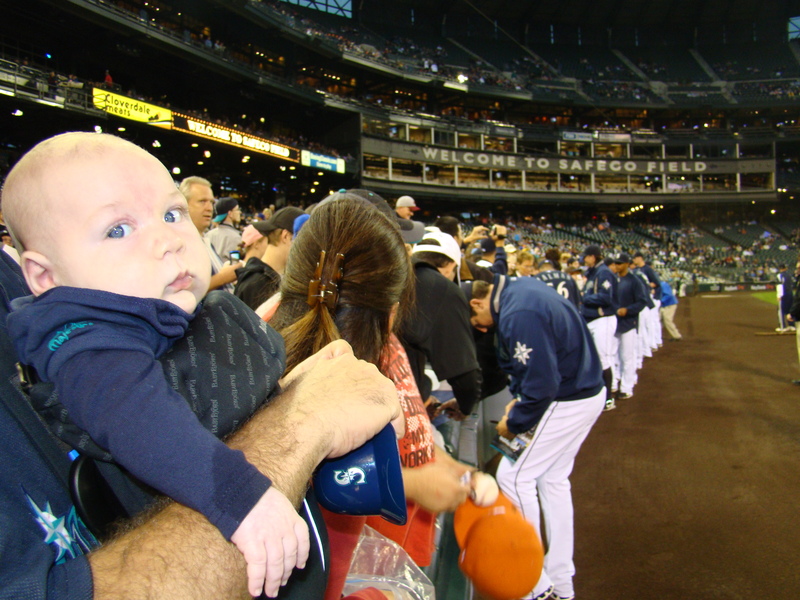 Meanwhile, Kellan, Colleen and I headed over to the Mariners dugout. 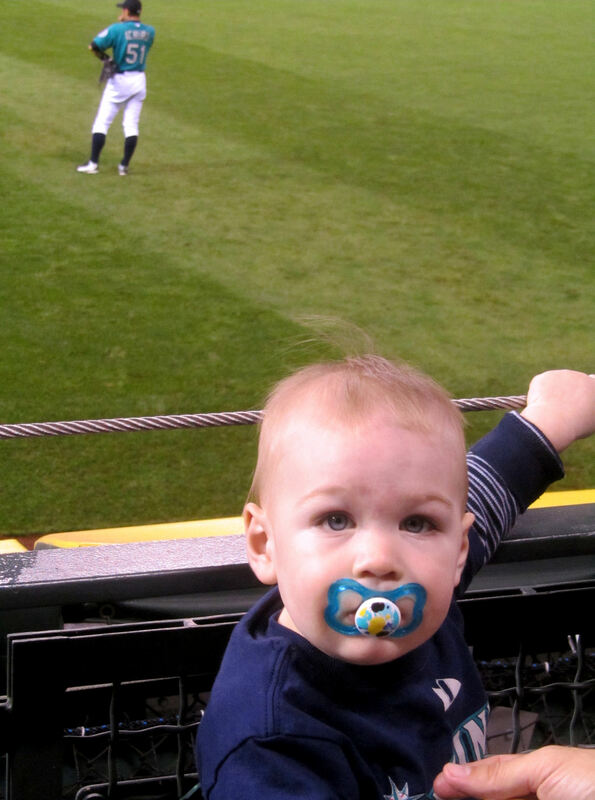 I really wanted to get a picture of Kellan with a Mariner at his first game. 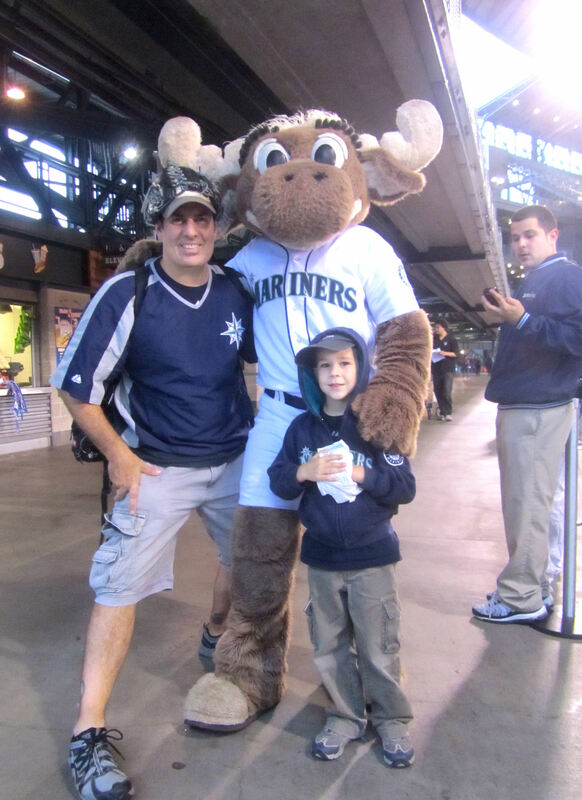 I had discussed it with Ryan Rowland-Smith at our last game and he said he’d gladly pose for a picture with us and that we should come over by the dugout. So that’s what we did. No Mariners were in sight for a long time. 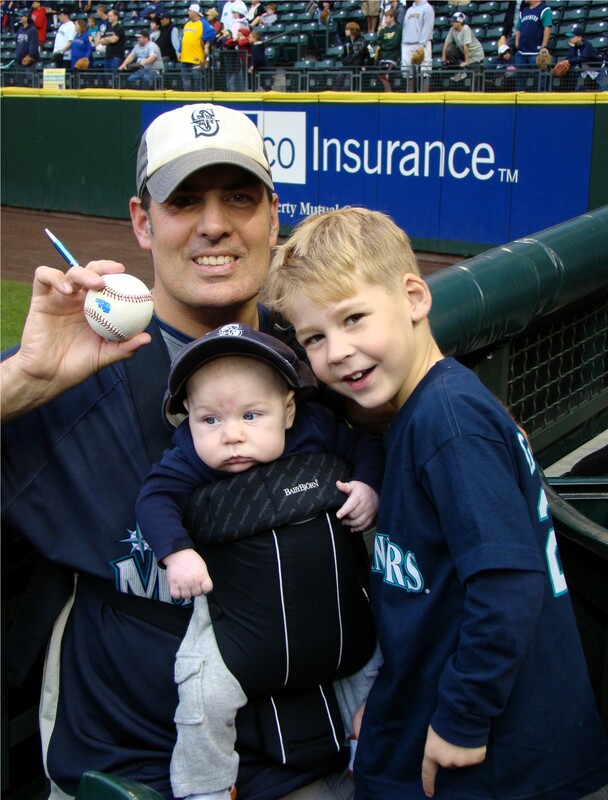 Then, John Wetteland came out and started signing autographs down the foul line. A couple rookie calls up soon joined him. We stuck by the dugout looking for RRS. Eventually, he came out and we locked eyes. 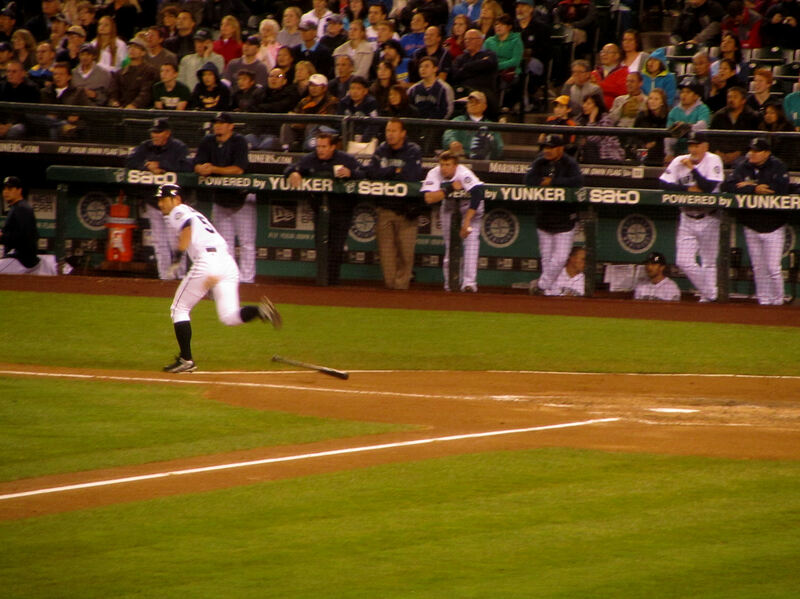 I pointed down the foul line and we both nodded our heads. But when he went down the line to meet up with us, a throng of fans rushed him for autographs. 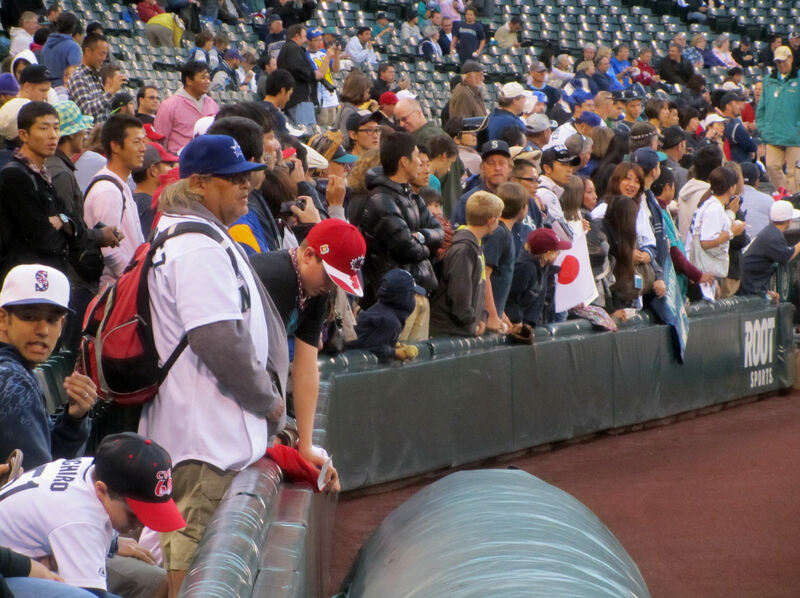 Then more players came out and joined the huge autograph session. 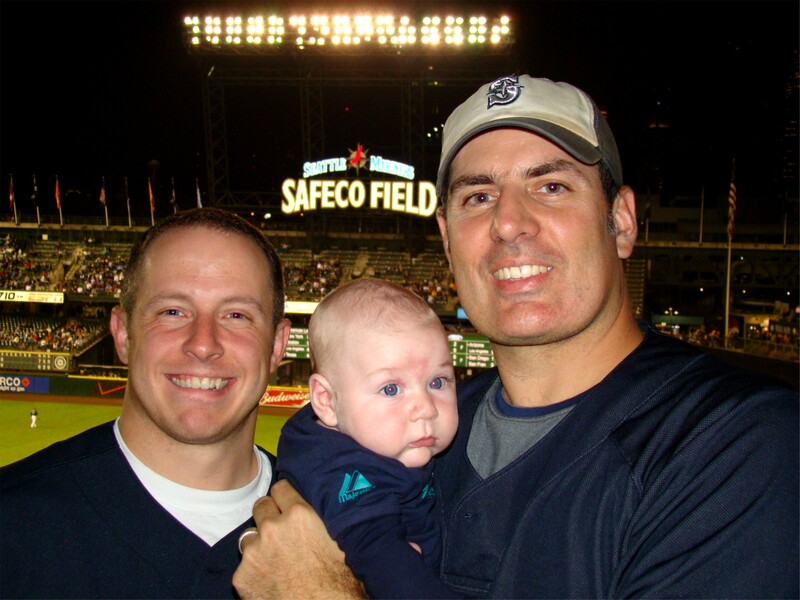 Clockwise from top left: David Pauley, RRS, Chris Seddon, and Garrett Olson. Olson posed for a picture with us and then saw the little helmet in my hand. 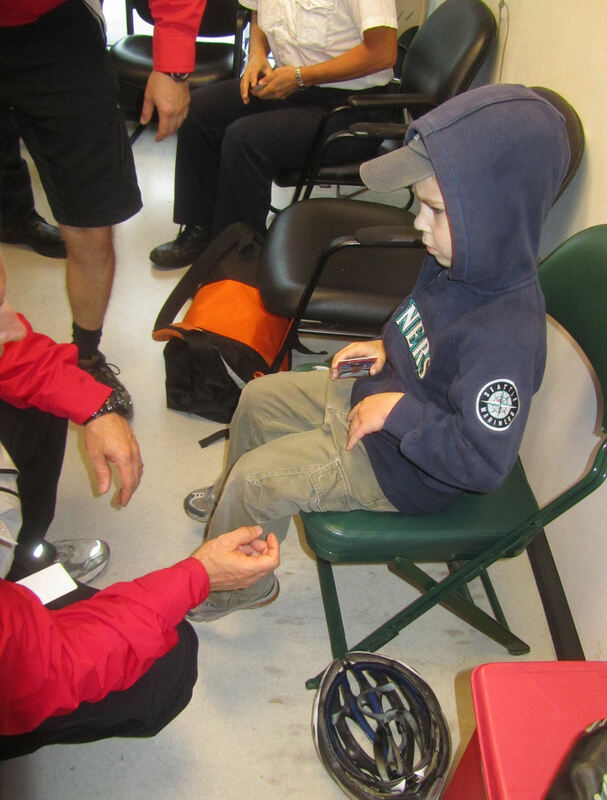 He grabbed the helmet, put it on Kellan’s head, and leaned in for a second picture. Excellent move, Garrett! 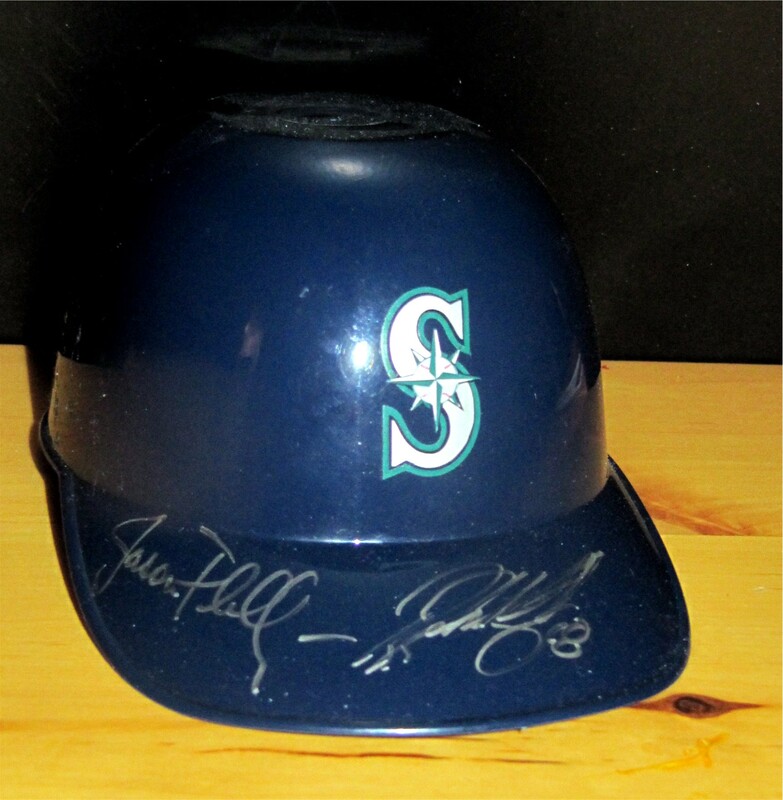 A couple of the autographs are on the far side near the back. 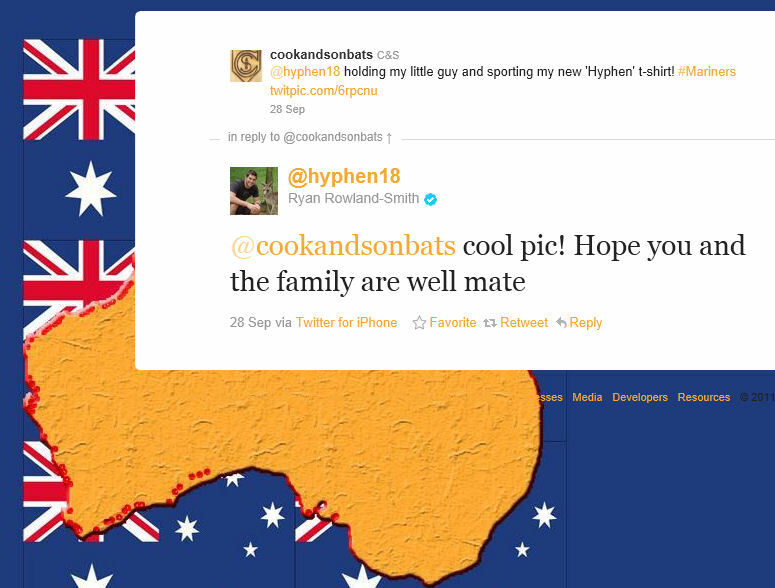 On the bill of the helmet, those autographs are Cook & Son Hall of Famers Jason Phillips and Ryan Rowland-Smith. Phillips wasn’t autographing down the line. While the autograph session was going on down the line, he was out in the bullpen and outfield working with starting pitcher Luke French and catcher Josh Bard. After we got those player pictures above, it was getting close to game time. We still had not visited the suite yet. 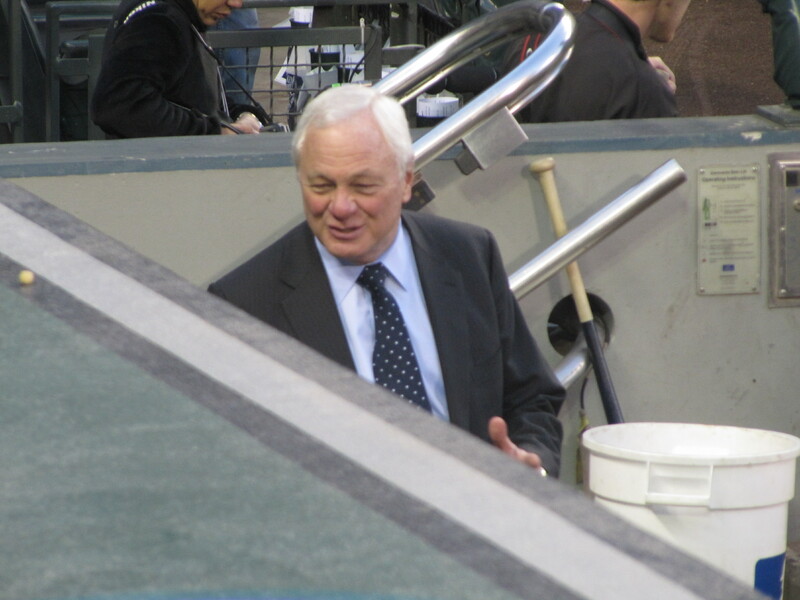 But before heading up, I told Colleen we needed to go out to the bullpen because I wanted to say hi to Jason. 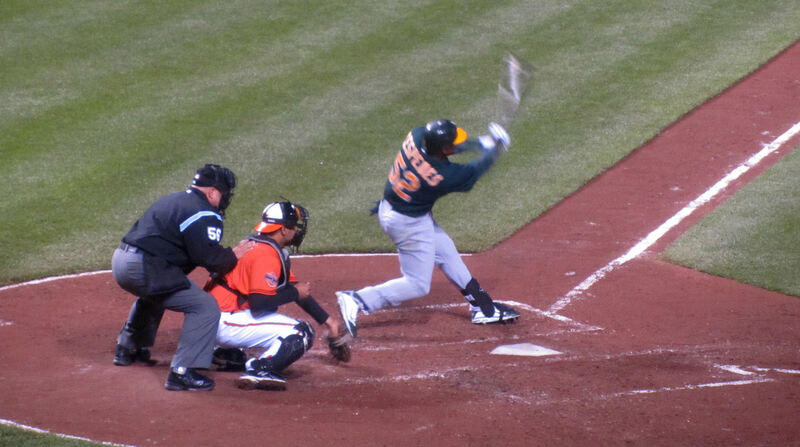 Jason Phillips has been so incredibly cool to Tim and I over the past two seasons. I definitely don’t want to try to take advantage of the relationship. 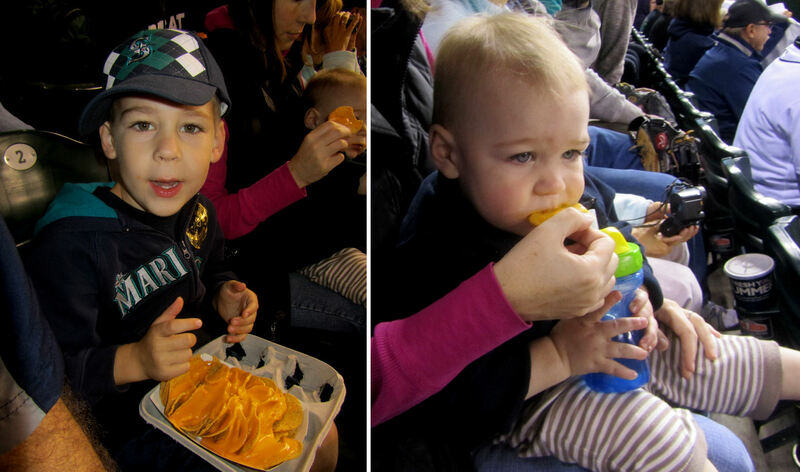 But this was Kellan’s first game! 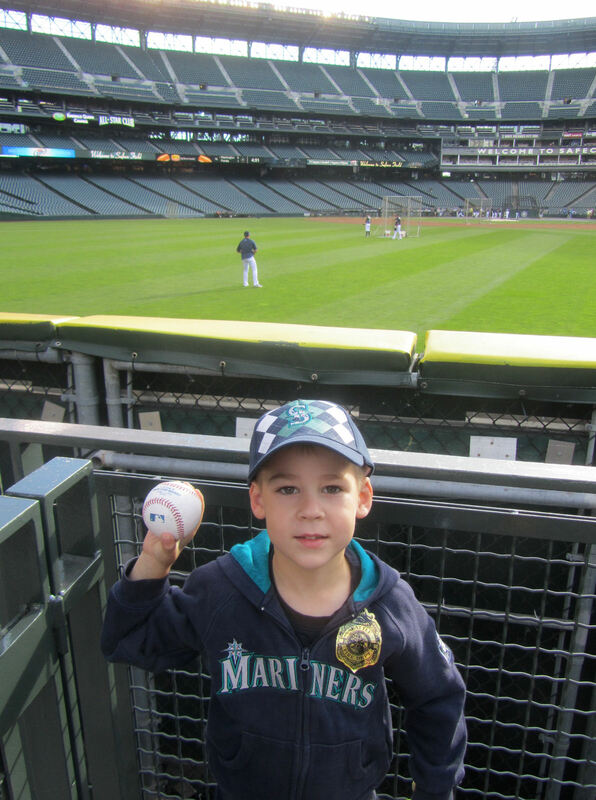 So I had to ask if he could hook Kellan up with his first Mariners baseball. “Of course,” was Jason’s response. 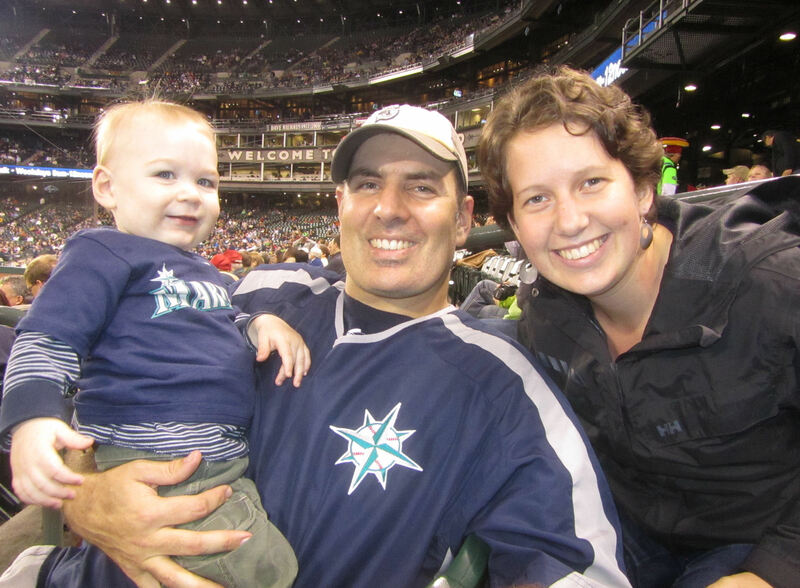 Faced with a fresh, new-to-the-world Mariners fan, Jason told us a story about when his kid was born and he was just days away from the start of a baseball season. 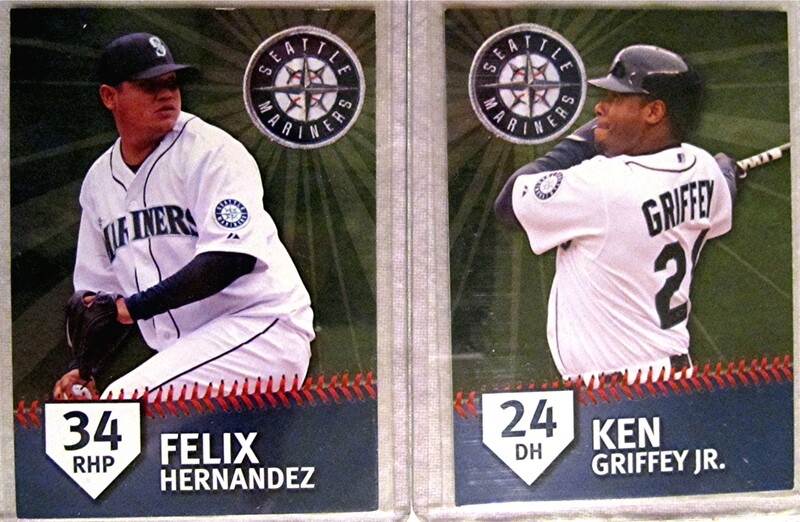 When we parted ways, we wished each other well for the offseason. 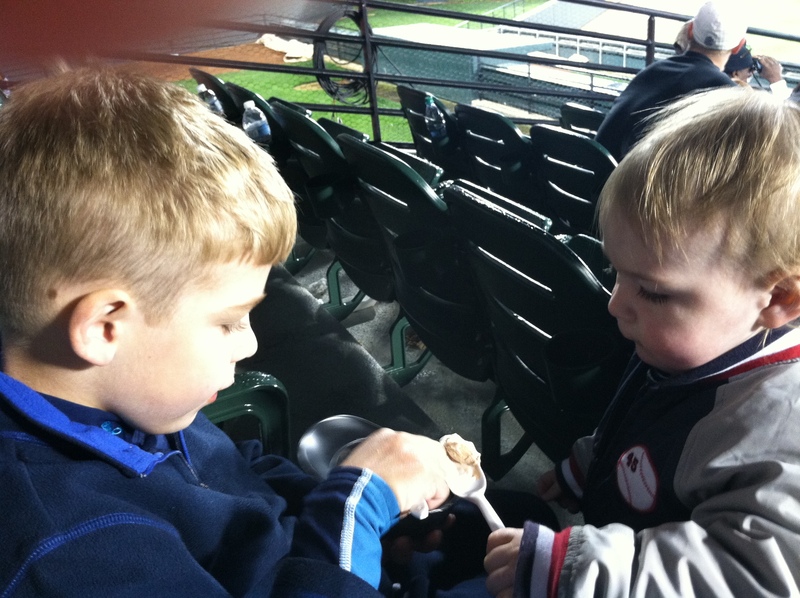 By the way, the baseball Jason gave to Kellan was fresh out of the box. 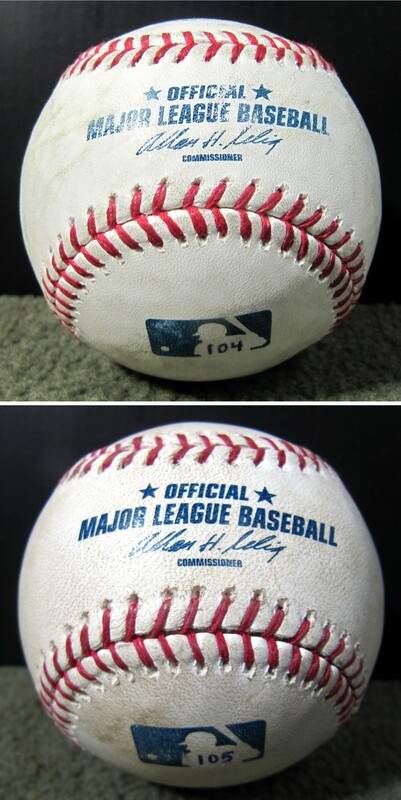 It is a beautiful clean pearl of a baseball. Anyway, what about that middle baseball? We wandered by the prize booth. 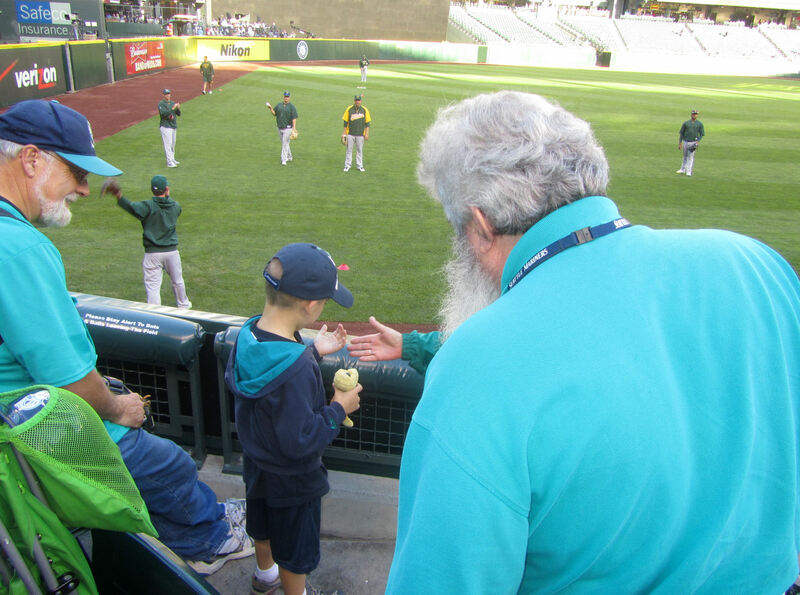 I showed them Kellan’s baseball (now autographed by Bobby Cramer) and told them there was no way I was going to give it to them, but that we still would like to get an autographed Mariners baseball. They put a little red dot inside the “C” in of the “CATCH & WIN” stamp and let me pick a bag from the autographed baseball grab bag. Truth be told, I like that red dot a lot. 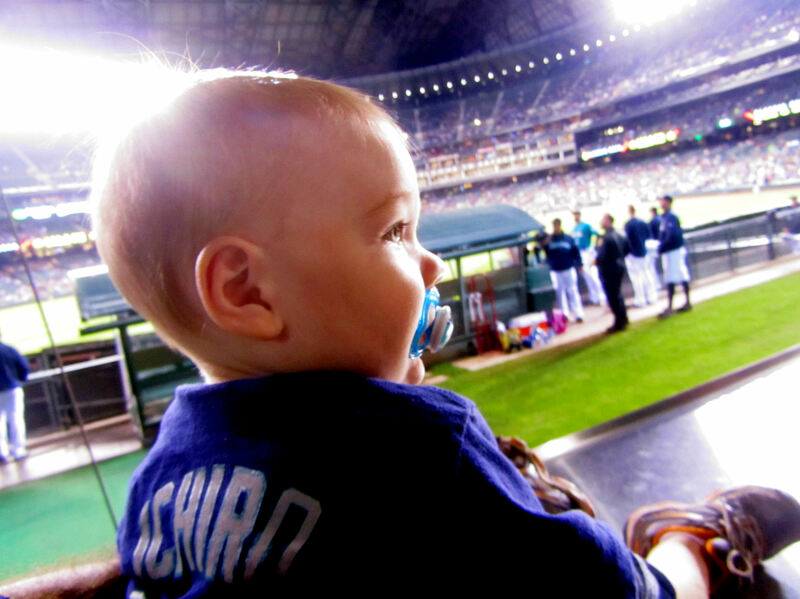 It adds to the story of Kellan’s first baseball and it looks cool. 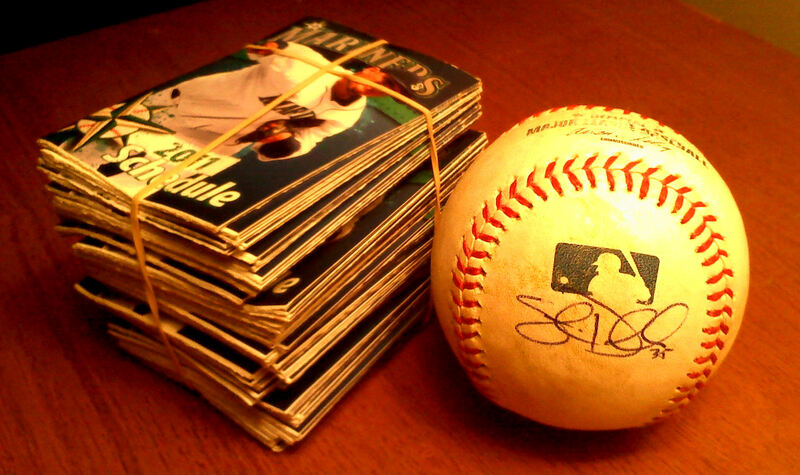 Anyway, Colleen and I both pointed to the same grab bag, and we ended up pulling the above-pictured Jose Lopez autographed baseball. We like Jose. The Jose baseball is definitely a welcome addition to our home. Okay — it was game time. 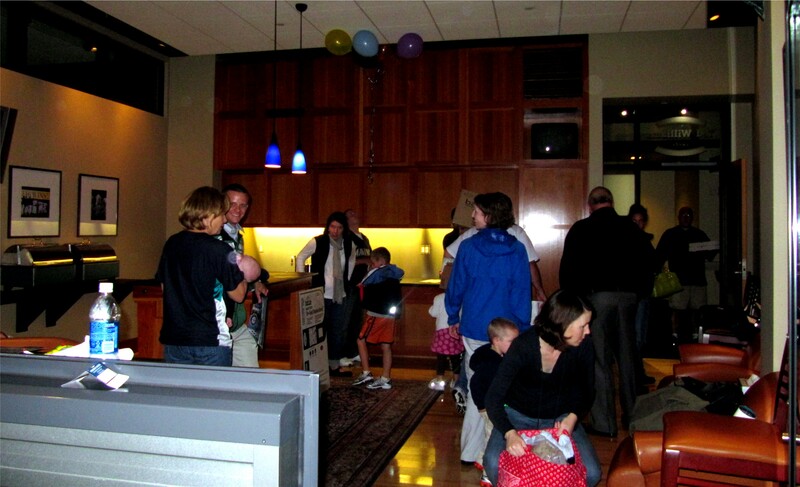 We reported to the suite and said our hellos to the gathered crowd of family and friends. 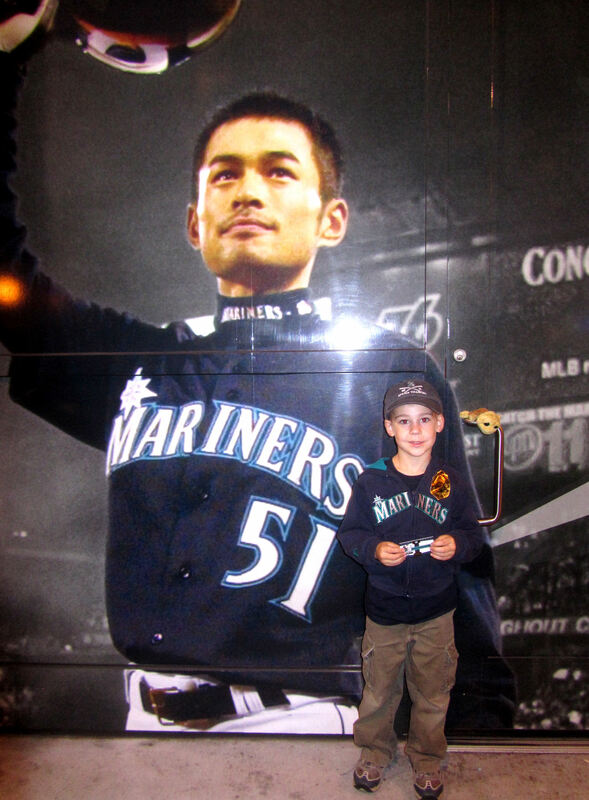 …Ichiro in right field for the first “out” of Kellan’s career as a Mariners fan. 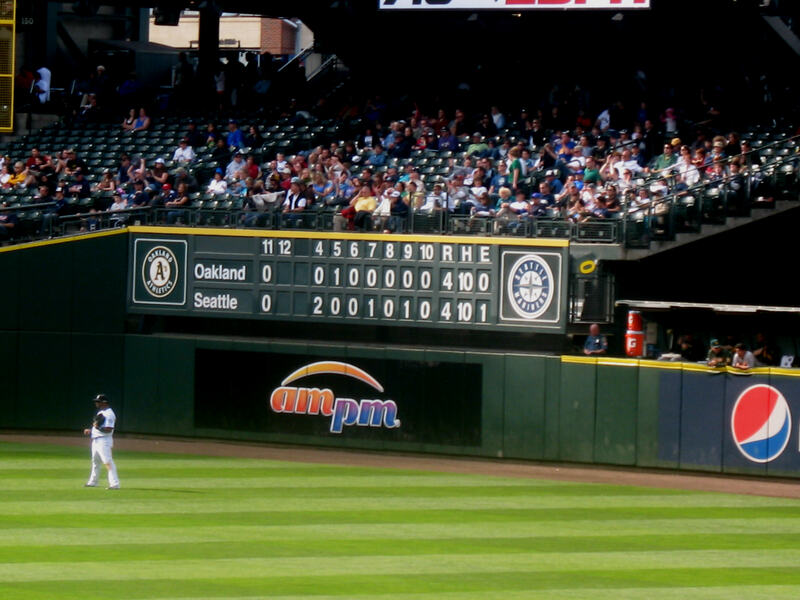 After that second pitch, sadly, it was all downhill for the Mariners. 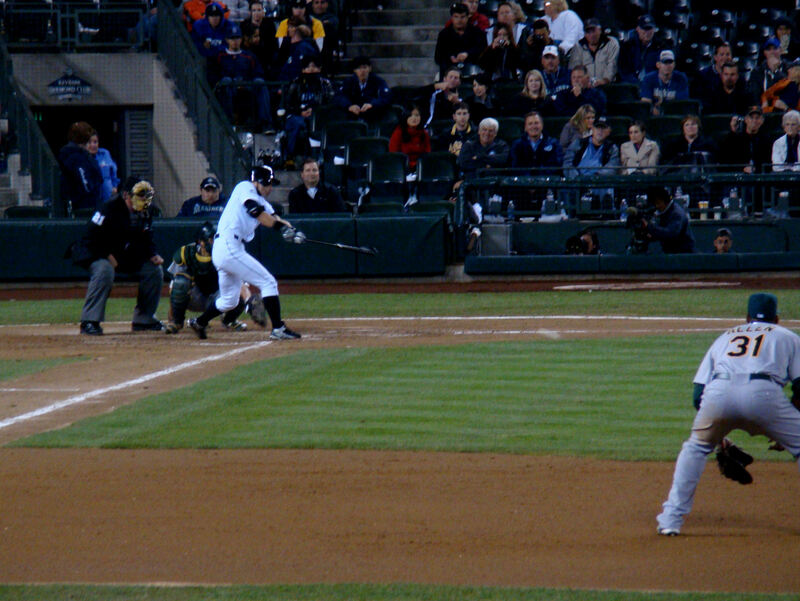 The next batter hit a homerun and the A’s never looked back. 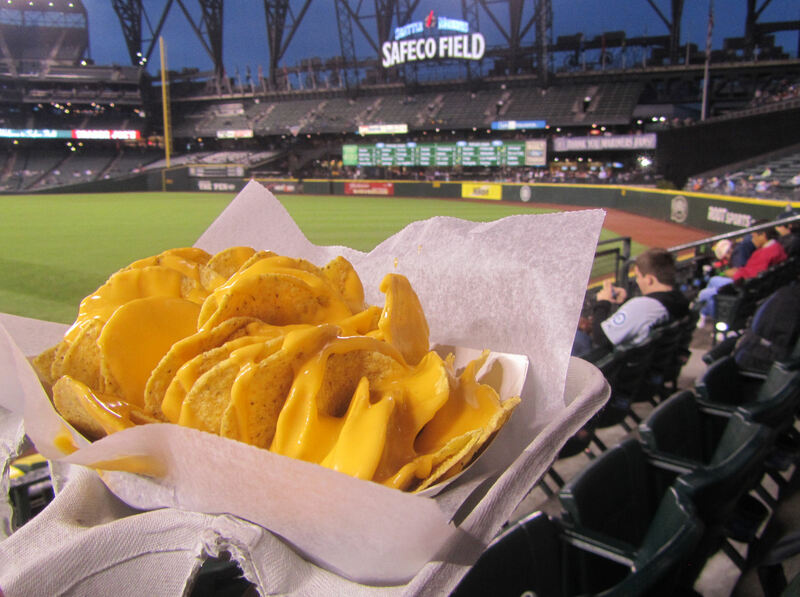 When you attend a game in a luxury suite, its easy to end up not hanging on every pitch of the game. There is a lot that goes on in a suite. And my mom and Colleen did an excellent job snapping pictures of all of the fun. 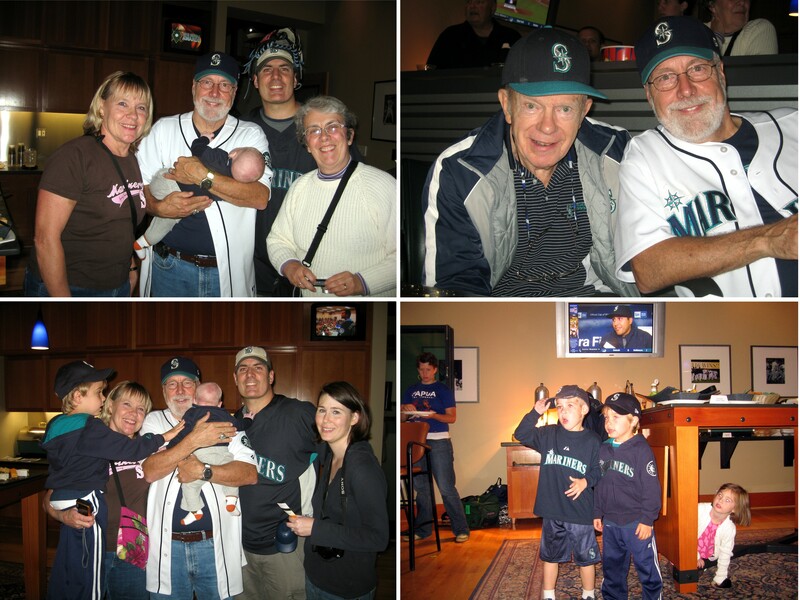 Top left: my dad with my folks’ closest friends and co-Mariners season ticket holders Lynn and Steve. 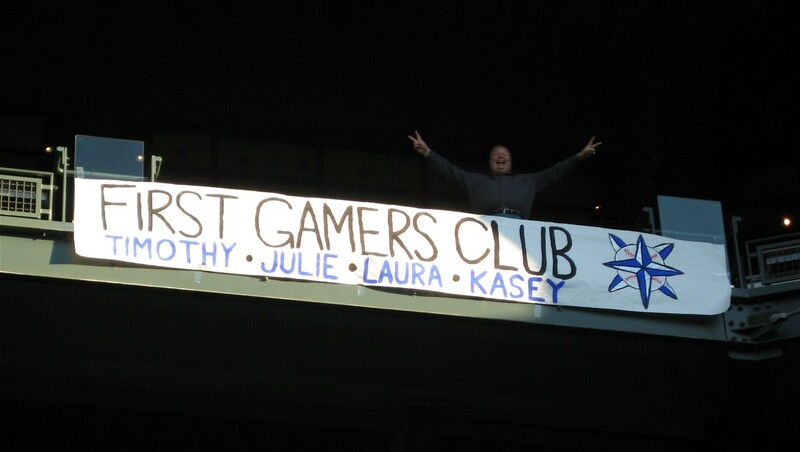 And half-hidden behind Lynn in Kasey from the First Gamers Club class of 2006. 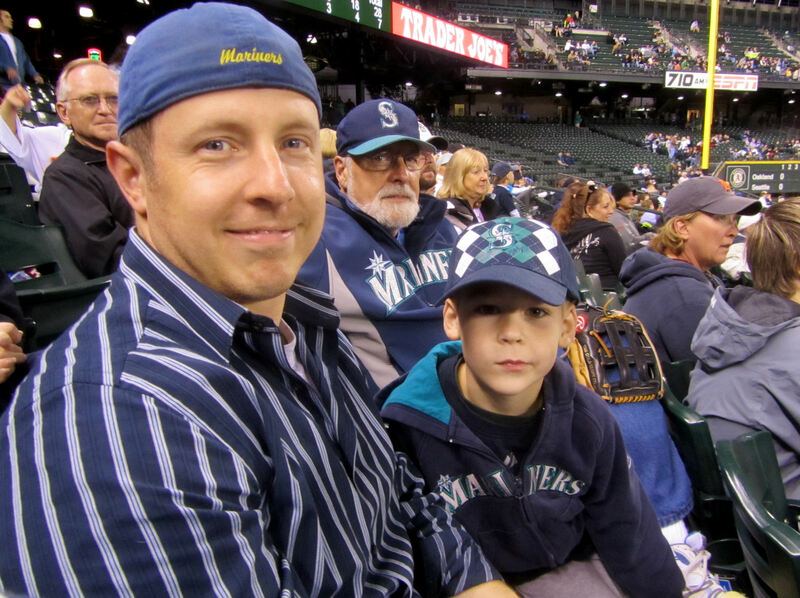 Kasey and Tim had a blast together at this game. 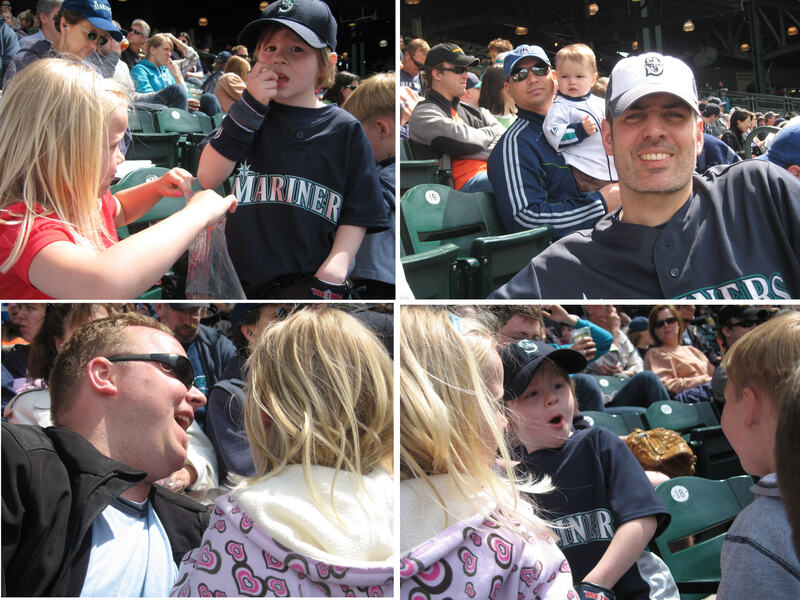 Top right: my cousin Annie smiles for a picture with her (and my) uncle Raaaaaaaaaaaayyyyyy! 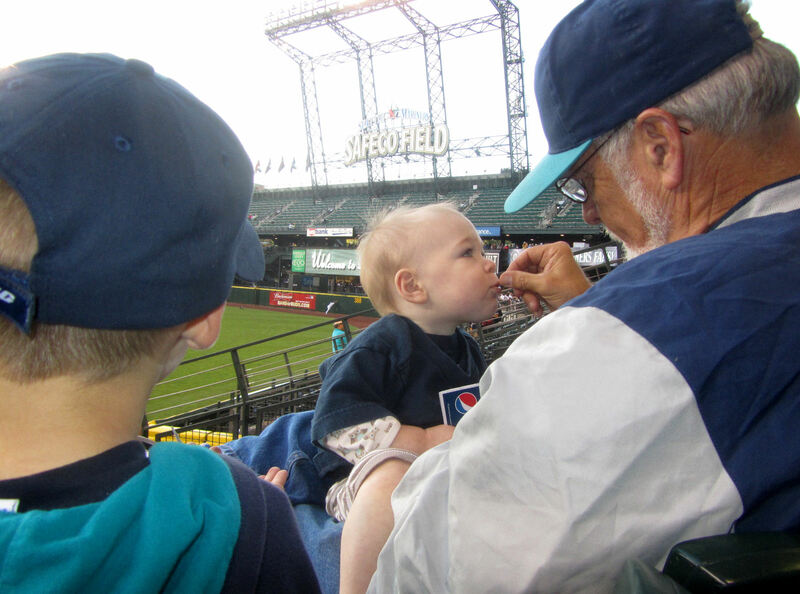 Ray is Julie, Erika and Tyler’s grandpa. 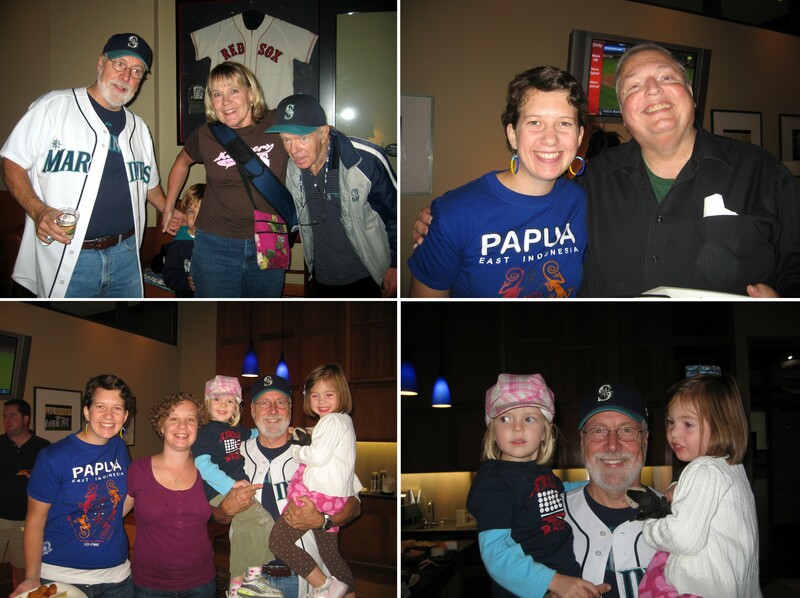 Bottom left: Annie with her sister (and my cousin) Katie, my Dad, Julie and Kate (my neice). Bottom right: My dad, Julie and Kate sans Annie and Katie. 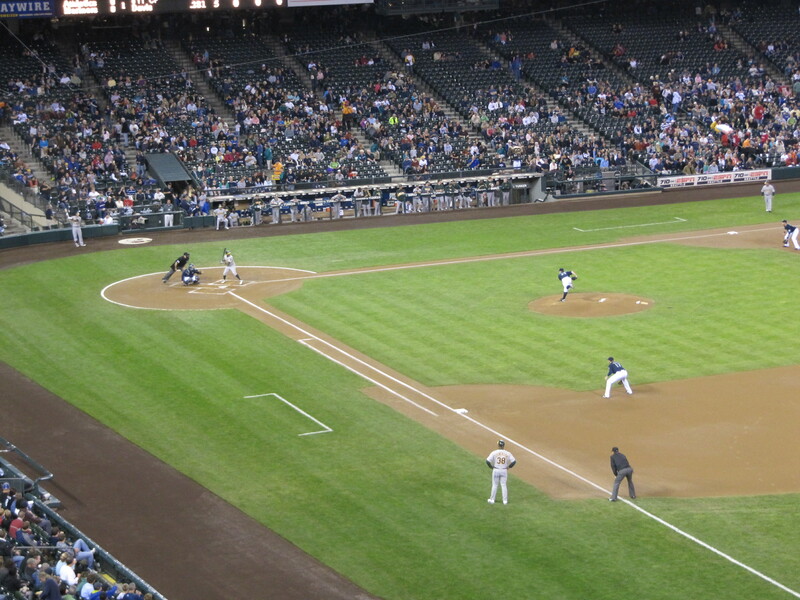 …grounded into a fielder’s choice in the third. Janet, of course, is Raaaaaaaaaaayyy’s daughter, and Julie, Erika and Tyler’s mother. 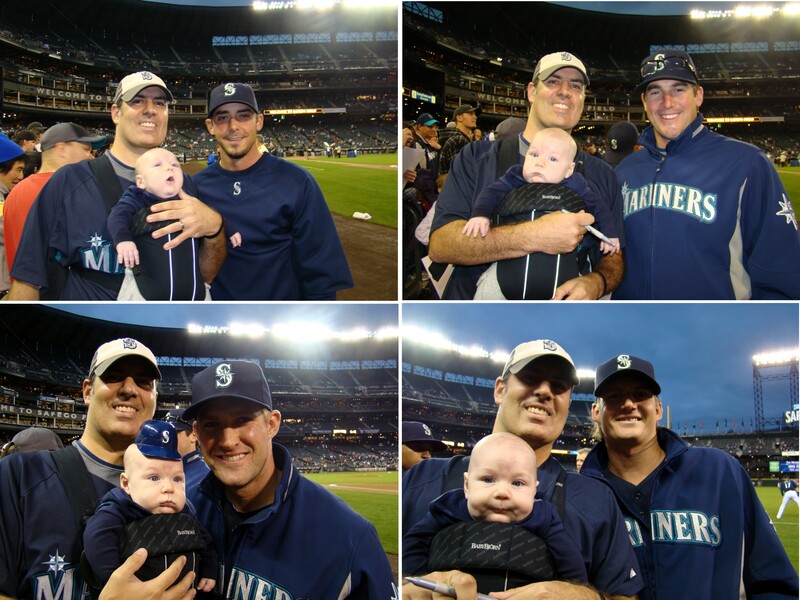 Top right: My dad holds Kellan as uncle Raaaaaaaaaayyy watches on. 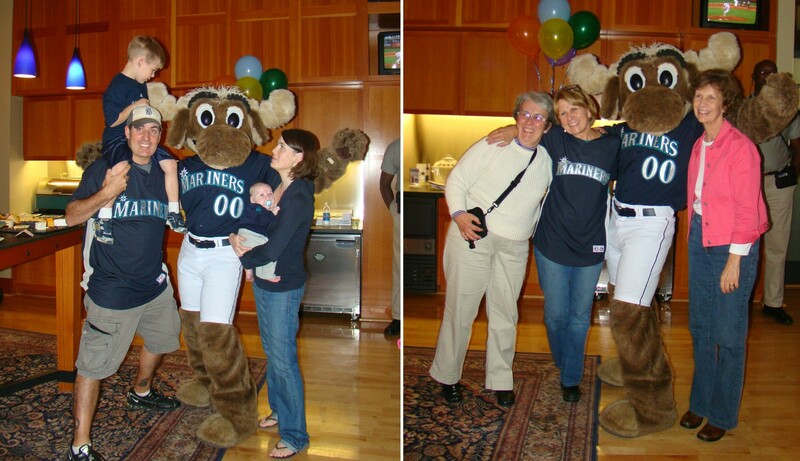 Bottom left: My mom goofs around with Julie. 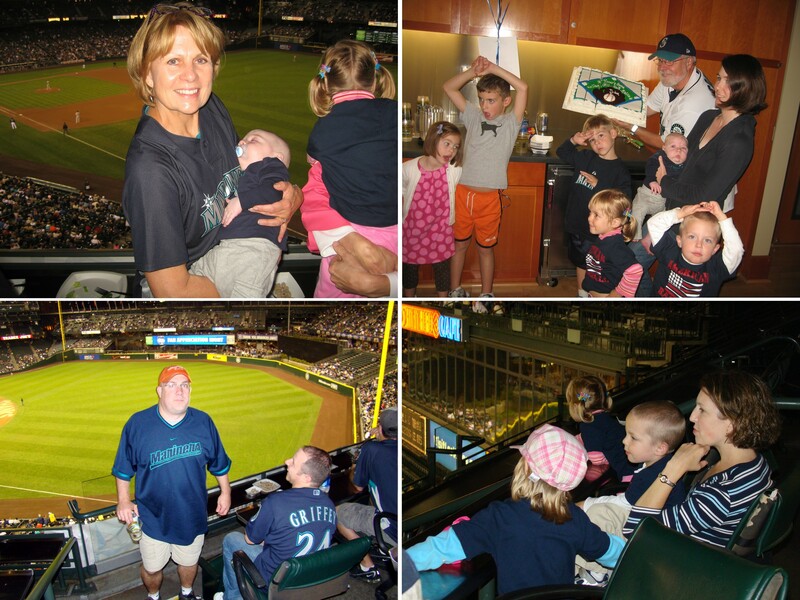 Bottom right: Katie holds Kellan as they watch the game from the suite’s top row of seats. By the way, each of my cousins at this game are children of my mom’s sisters, each of my aunts at this game are those very same sisters of my mom (she has four sisters and two of them were at this game), and each of my uncles at this game are the husbands of the aforementioned aunts and fathers of the aforementioned cousins. 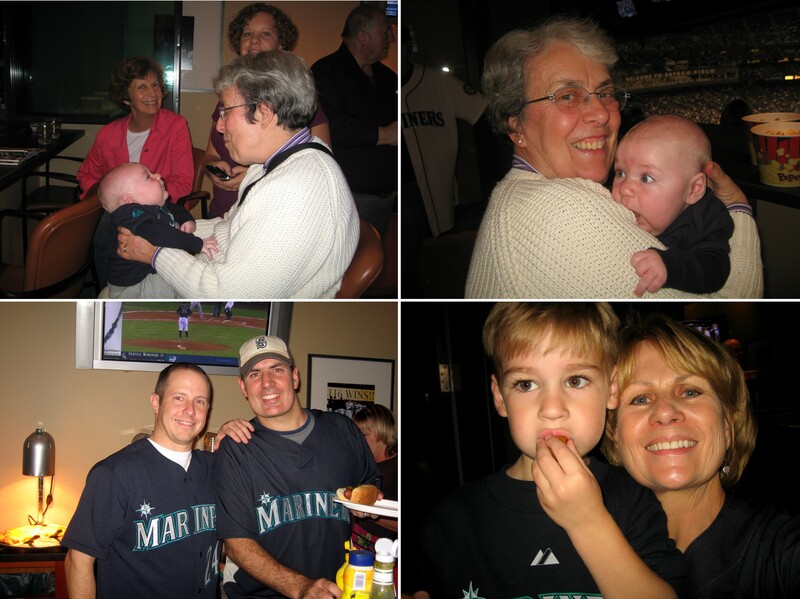 Top left: Lynn, my dad, Kellan, me, and my aunt Carol (wife of Raaaaaaaayyy, mother of Janet, and grandma of Julie, Erika and Tyler). Top right: My dad and Steve. 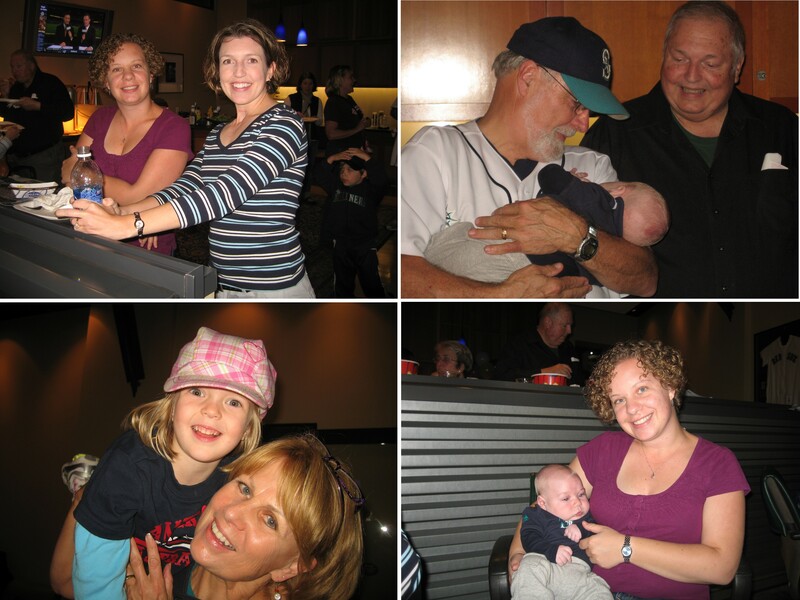 Bottom left: Kasey (in his grandma’s arms) pats Kellan (in my dad’s arms) on the arm, while Colleen and I smile for the camera. Bottom right: Trouble with a capital “T” and “K”. Left to their own devices, I am certain that Tim and Kasey could get into unruly amounts of mischief. (And, for good measure, Kate is hiding under the table). 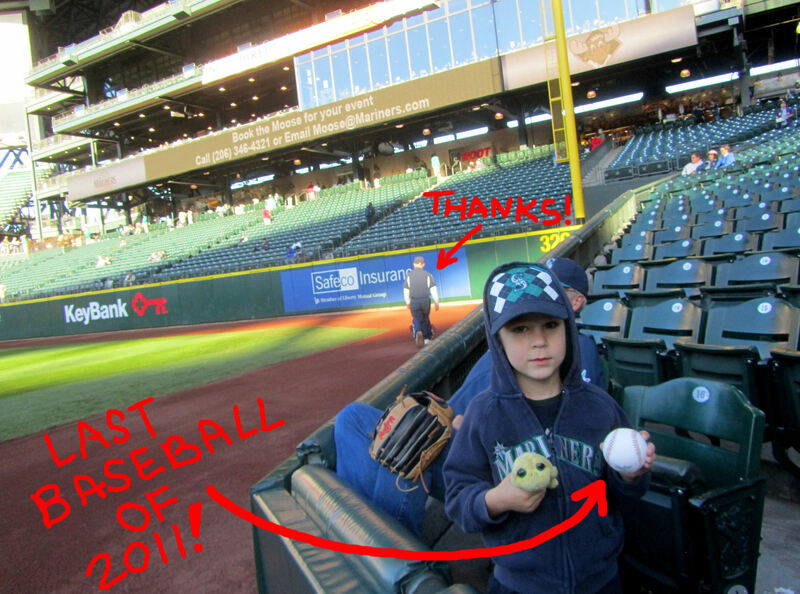 Of course, this wasn’t Tim’s first game, so I digitally edited his certificate. Along the wall off-camera to the right, we also had pizzas, hot dogs, and delicious little mini corndogs. Top left and right: Carol plays with Kellan. In the photo on the left, my aunt Margaret watches on in the pink jacket. 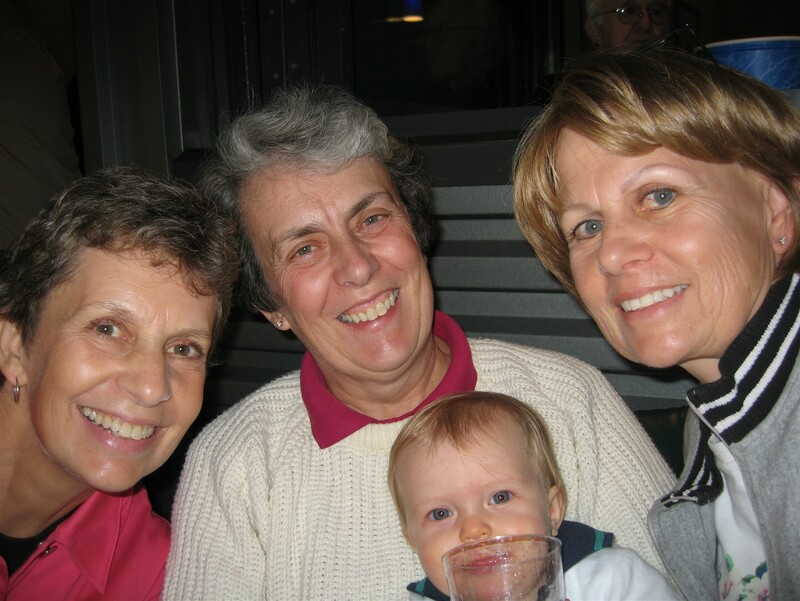 In a crazy and by all accounts unplanned twist of fate, Carol wore the exact same white sweater and Margaret wore the exact same pink jacket to Tim’s first game. Here is the photographic evidence. Bottom left: Me and Paulie (taken about two seconds before (or possibly after) our “pointing at the food” picture above). 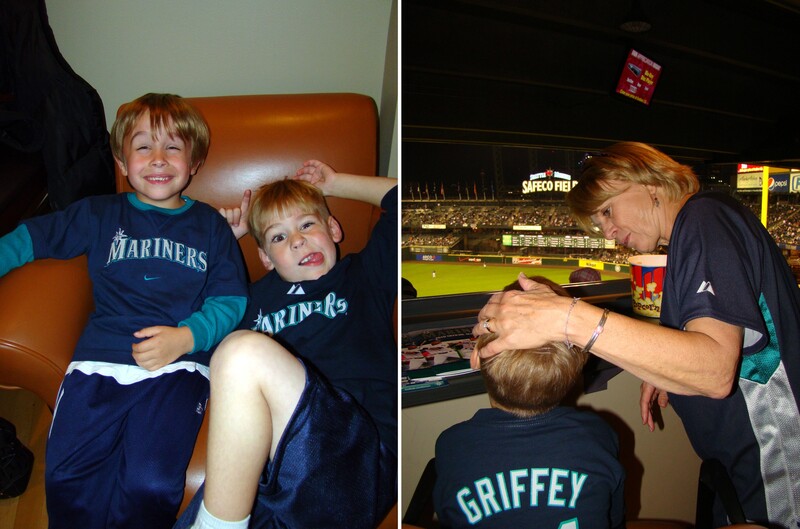 Bottom right: Tim and one of his favorite people in the whole world, his grandma. Top left: my mom and Kellan. Top right: the kids gather for some First Gamers Club cake! Bottom left: I paparazzi-style ambushed my brother Jason as he got up to get more food and/or drink. Paulie laughs at Jason in the process. Back in 1998-99, Jason, Paul and I were roommates during the year after I graduated from college and before I moved to Pennsylvania for law school. Between the three of us, there was a lot of making fun of each other going on in that house. Good times. Bottom right: Janet watches the game with all three of her kids. 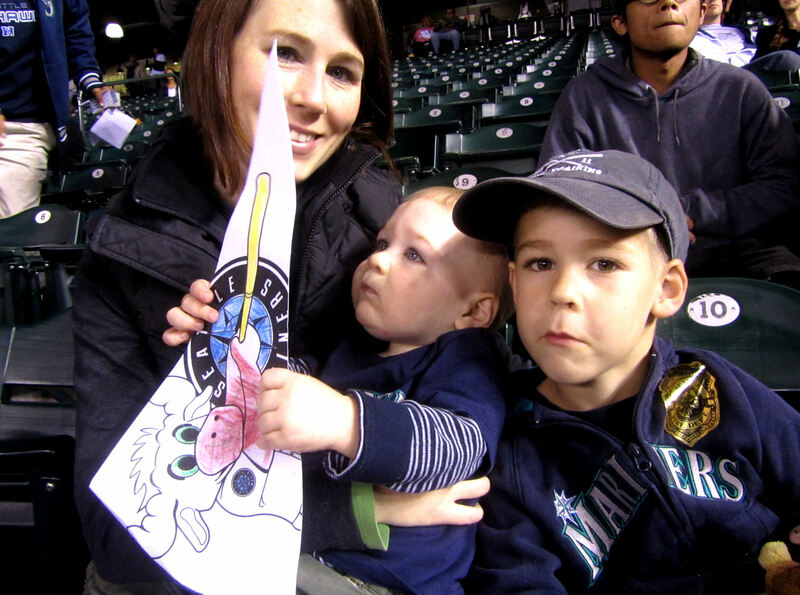 …and Kellan and aunt Kimberly on the right. By this point, all of these people should look familiar except two of ’em. 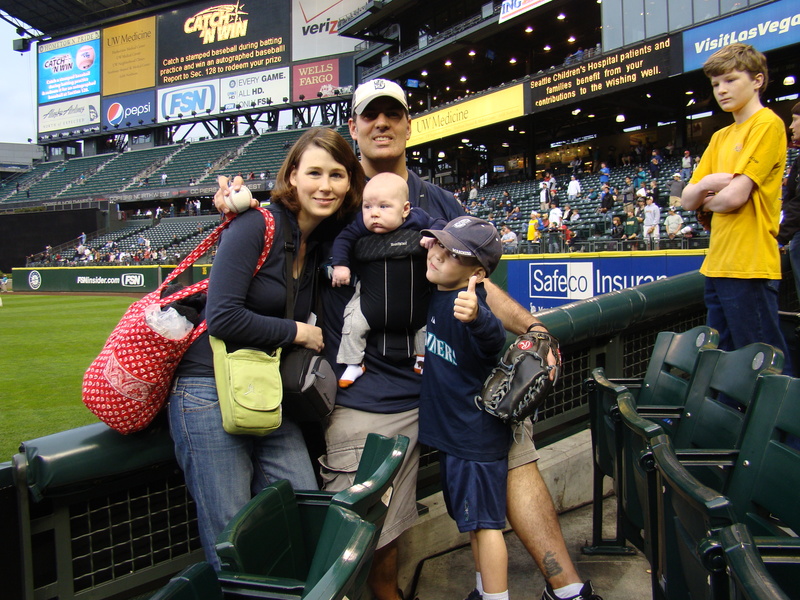 In the top left, Janet’s husband Destry is holding Erika and Tyler. 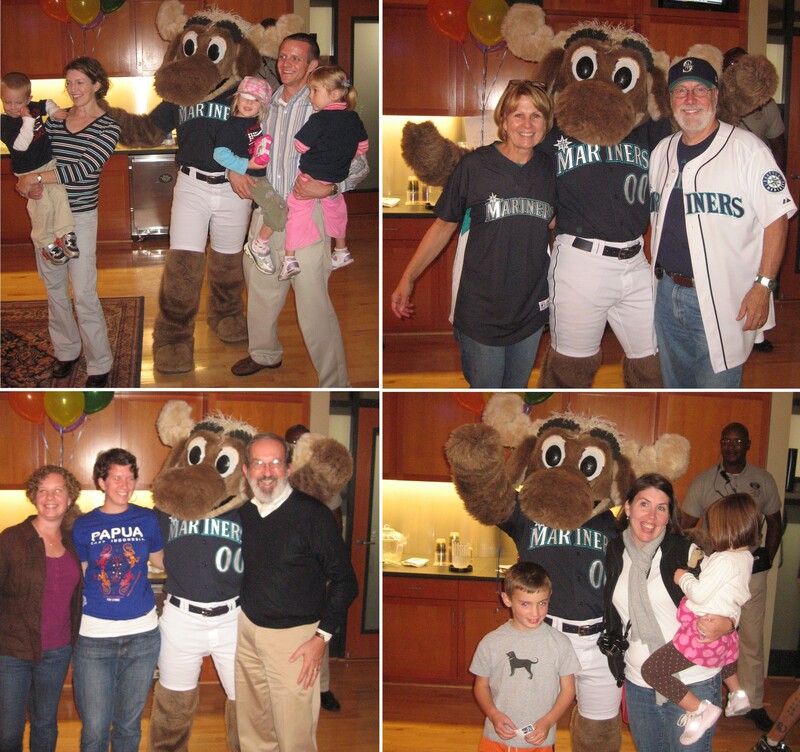 At the bottom left, Katie and Annie are joined by their dad (and my uncle) Tom in their Moose picture. 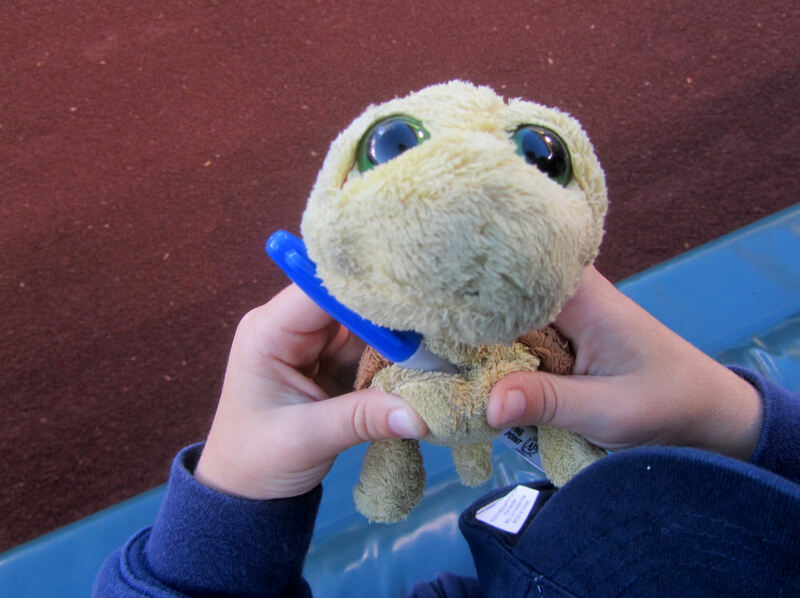 By the way, to connect the dots, maybe I should mention that Margaret and Tom are the parents and Katie and Annie are the sisters of my cousin Nathan with whom Tim and I went to a Nationals vs. Mets game on September 6, 2010. 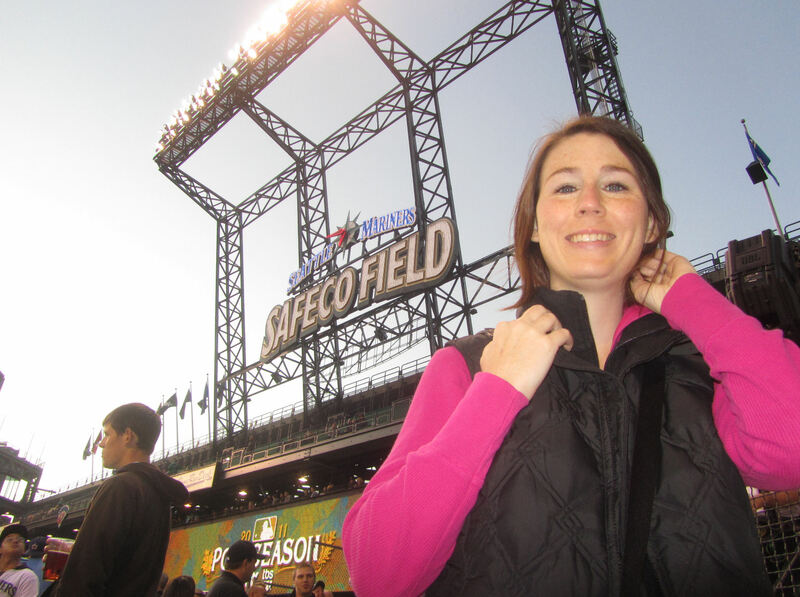 …while Kate smiles at someone else’s camera. 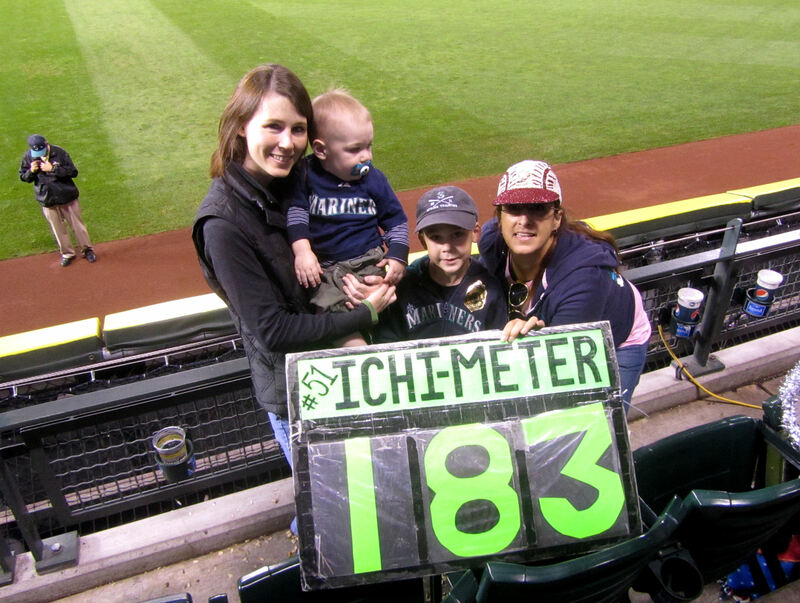 Gill’s baseball fan loyalty is somewhat up in the air. 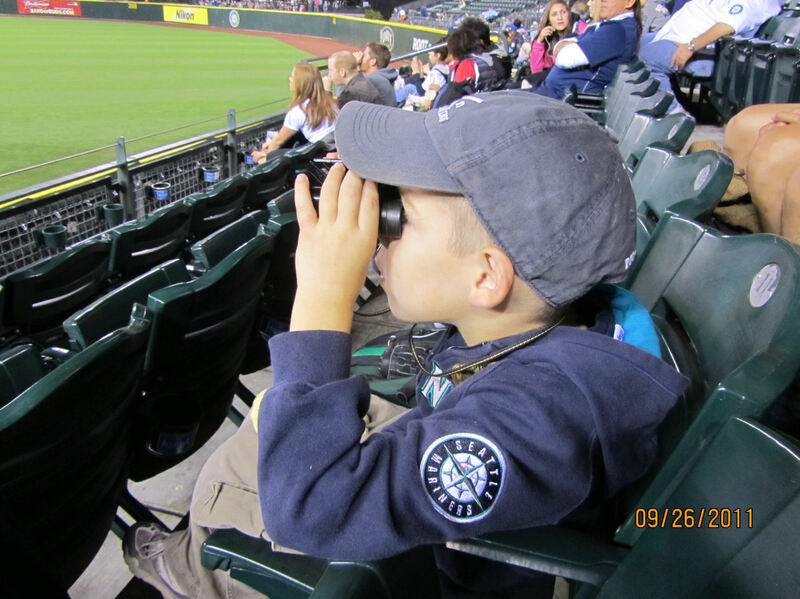 While his dad is a moderate Phillies fan (more of an Eagles and Flyers fan) and his (and Tim’s) grandpa is a Yankees fan, I have designs on drafting Gill into a life of indentured Mariners fanitude. …where everyone was “so very nice” to them. 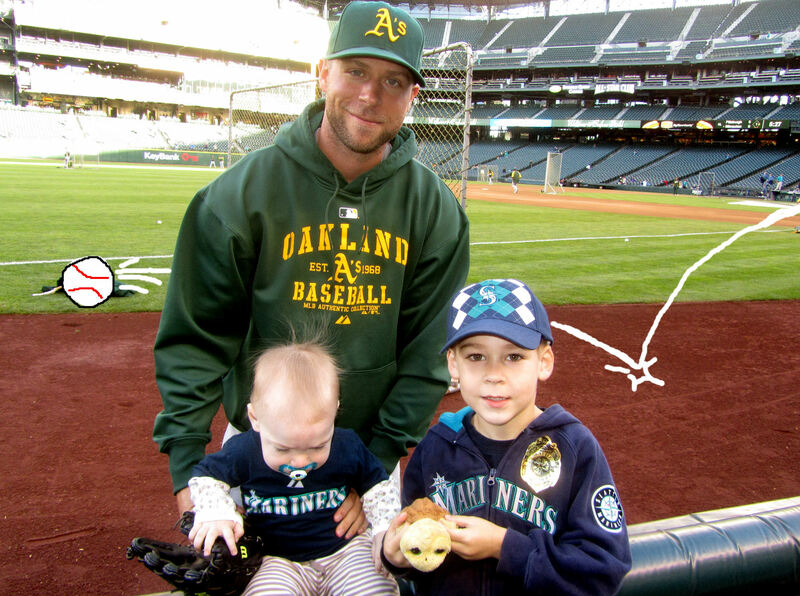 ….with Tim wearing a pair of rabbit ears courtesy of his uncle Jason. 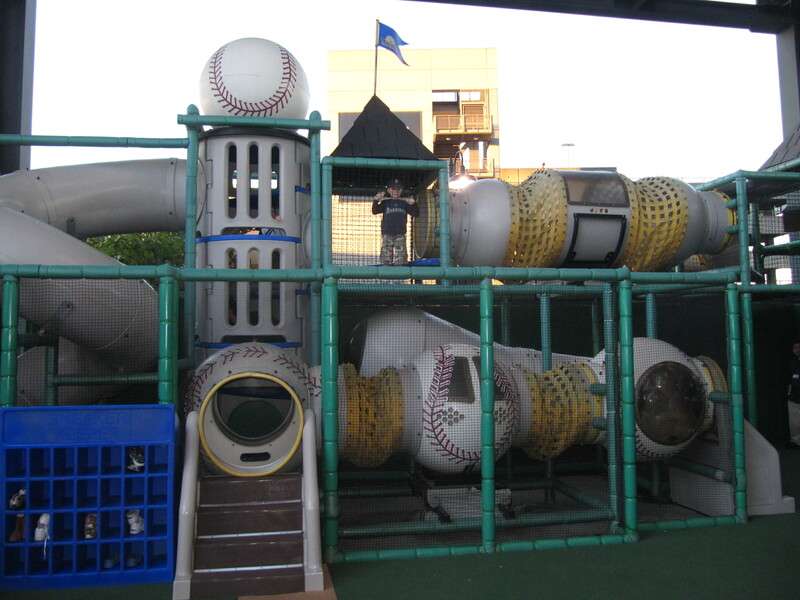 The play area was pretty crowded and it was easy to lose sight of the kids in there. So we didn’t stay too long. 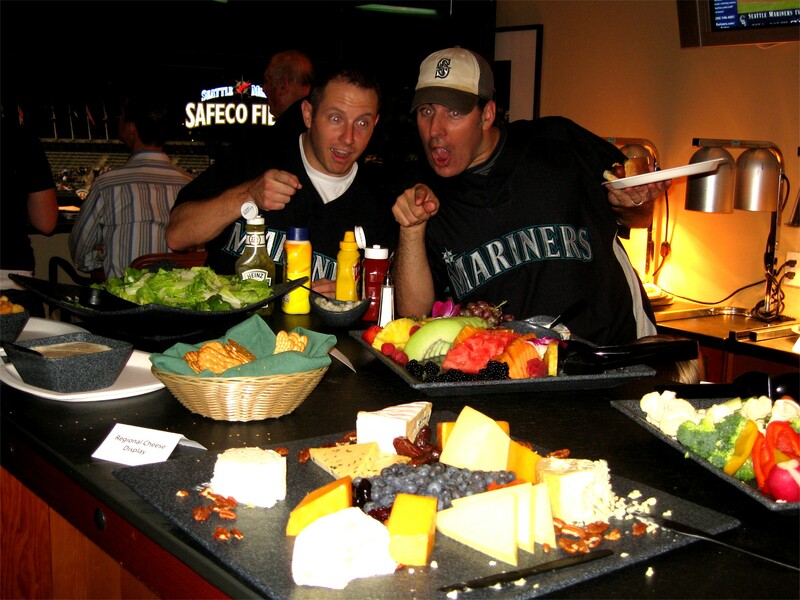 Before we left, I made a suggestion to Kimberly: if they would like, we could stop by the Mariners bullpen and I could try to get a baseball for Gill and Kate before heading back to the suite. Things worked out ideally. 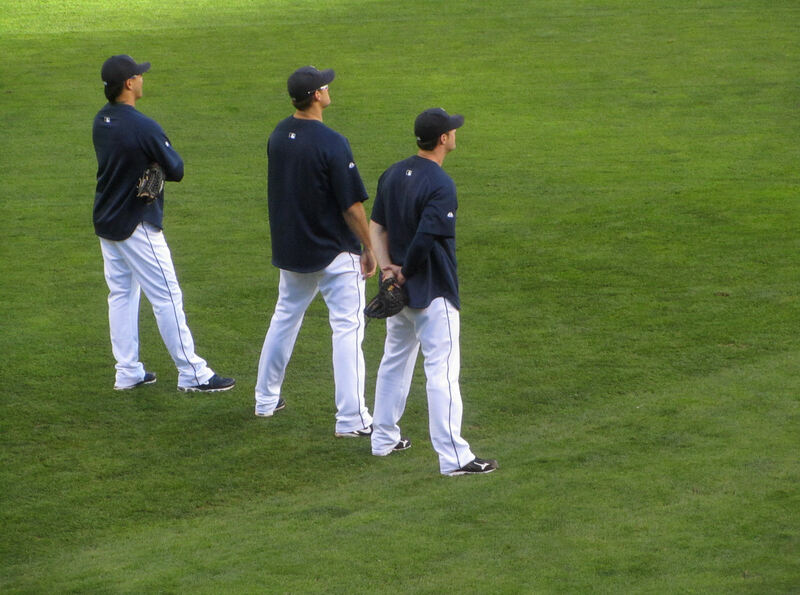 As we approached the bullpen, Garrett Olson was warming up, but for some unknown reason, Jason Phillips wasn’t doing the catching. 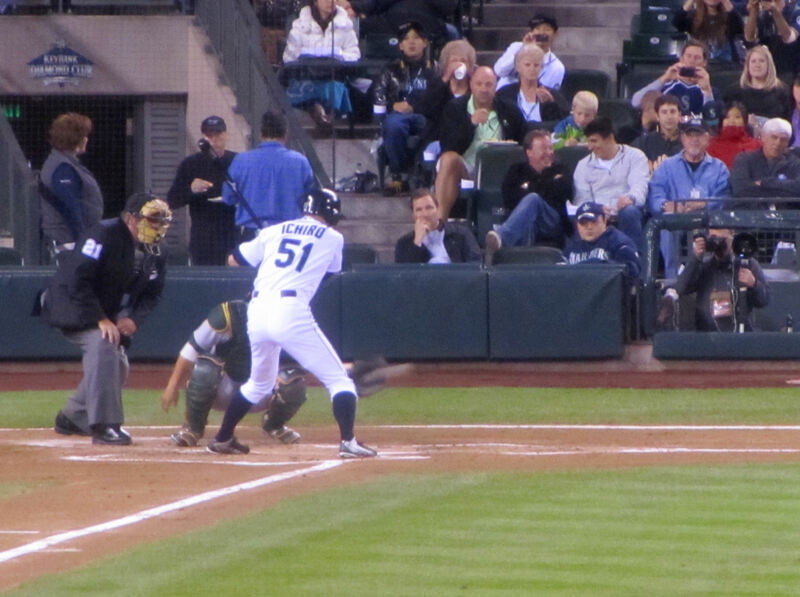 Instead, Jason was standing behind the catcher just off to the lefthanded batters box side of the plate. 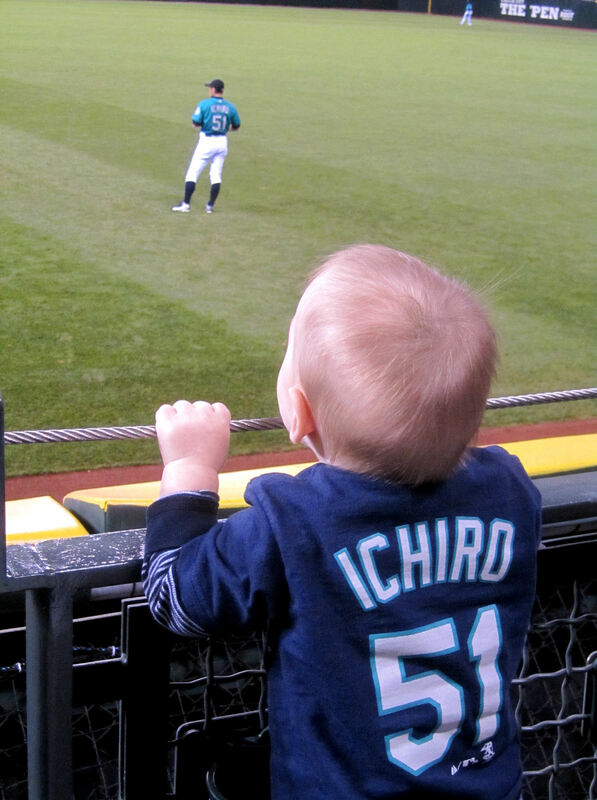 He was standing against the fence to the bullpen. 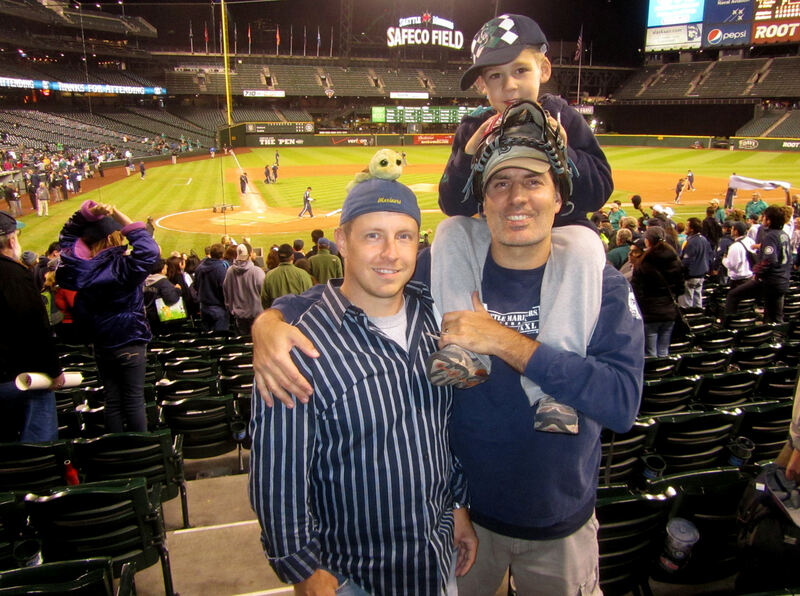 …you can just barely see a little piece of Jason’s blue baseball cap above the green padding right over Gill’s right hand. As we walked up to the fence, I noticed that Jason was standing right there. I said hello and he turned around to chat. Again, I don’t like asking Jason for too much, but these were drastic times. 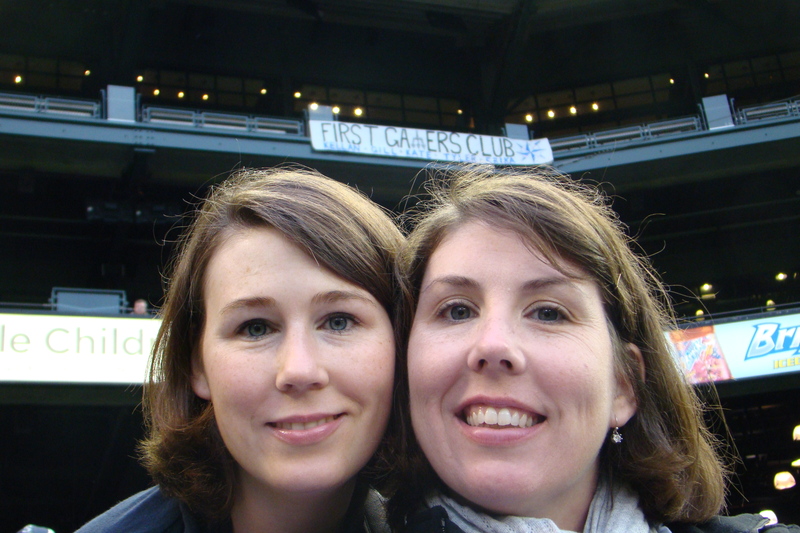 Gill and Kate were never going to have another first game. 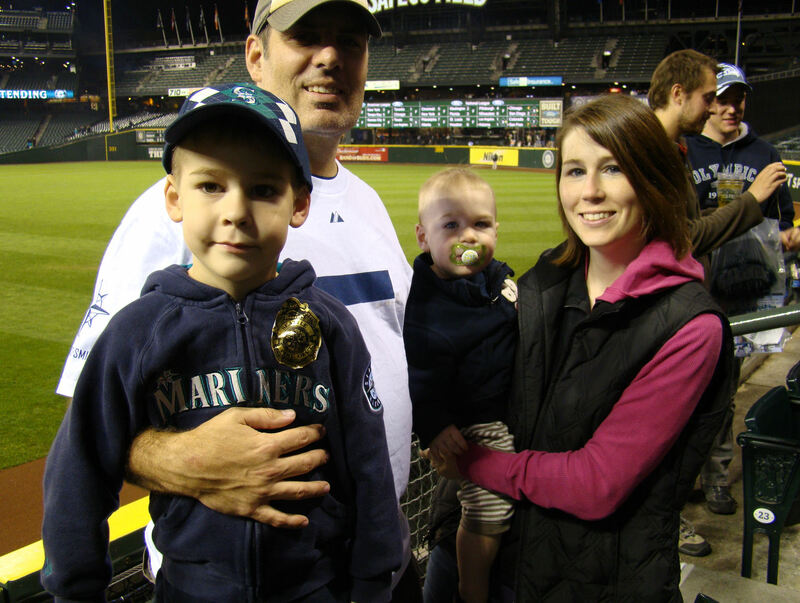 I introduced Jason to everyone, mentioned that they’d flown out to Seattle from the east coast to share their first baseball game with Kellan, and I asked if it was possible for them to get a baseball to mark the occassion. “No problem,” Jason said, “just let him finish warming up so I can get over to my bag.” Above to the right, Gill watched through the fence with wide eyes. 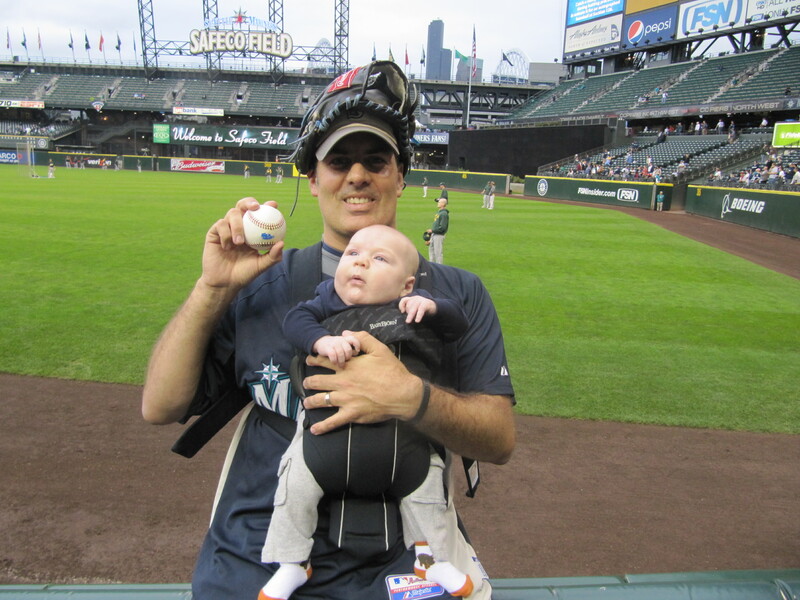 Once Garrett finished warming up, Jason headed over to his equipment bag, pulled out a baseball and tossed it over the fence to uncle Kevin who handed it over to Gill who then gladly handed it over to his sister, Kate. 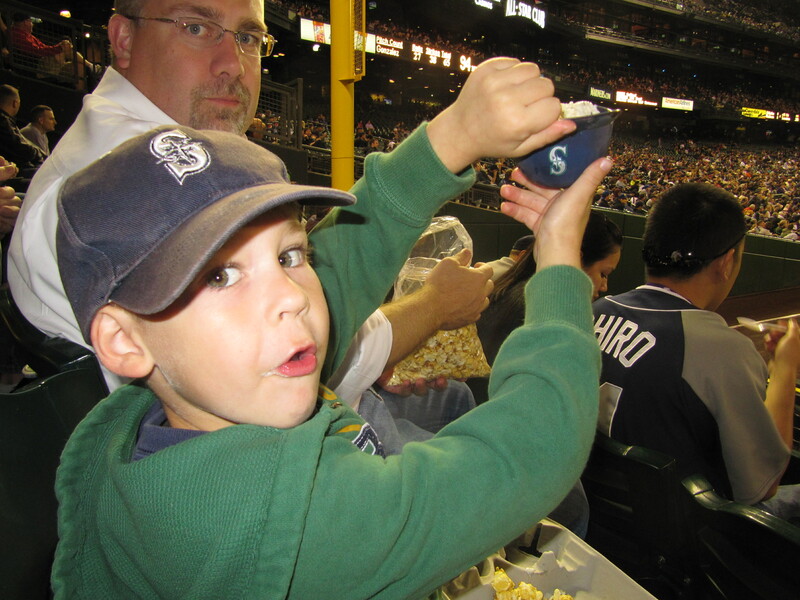 …he extended his hit streak in games attended by Kellan to one (1) game (and counting). The brutal loss, however, couldn’t dampen our spirits. 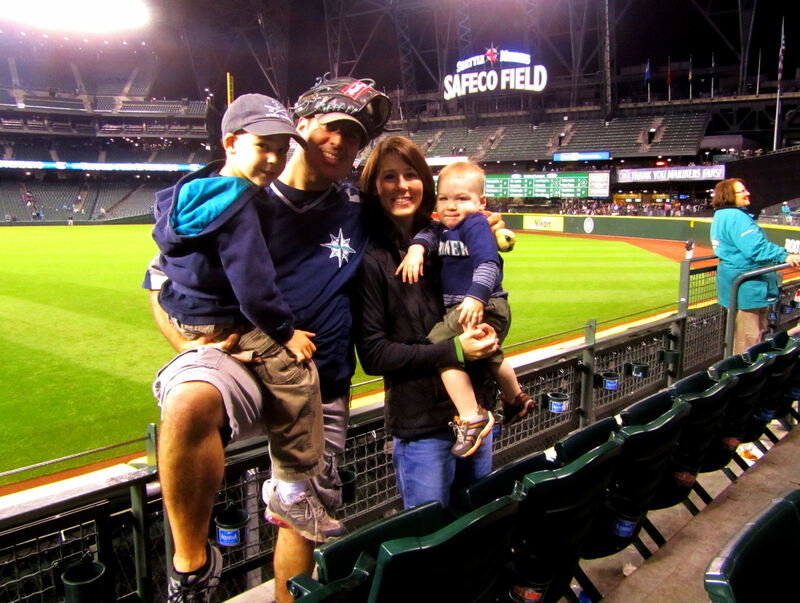 The season was long lost months ago and, while a win would have been great, this night was about family, friends and sharing our five kids’ “first game” experience with one another. And on that front, the night was a smashing success. 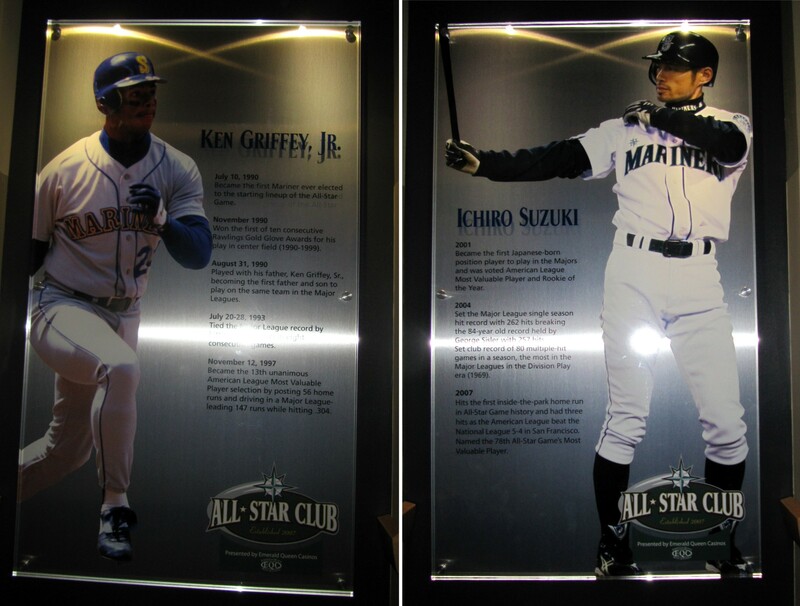 Months earlier, I had hoped and expected that Ken Griffey, Jr. would be playing in this game. 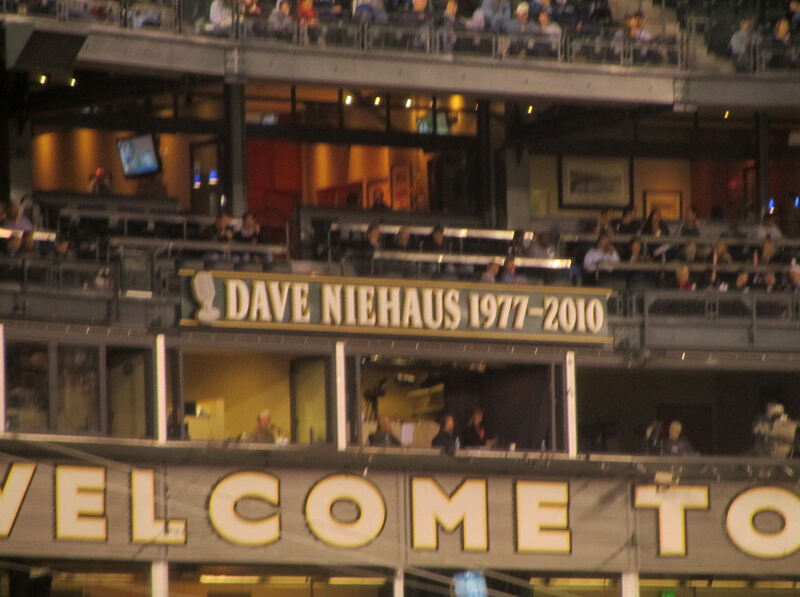 Given his retirement, I was at least happy to have him “in” the suite with us. We try to get a full family shot at least once a year. 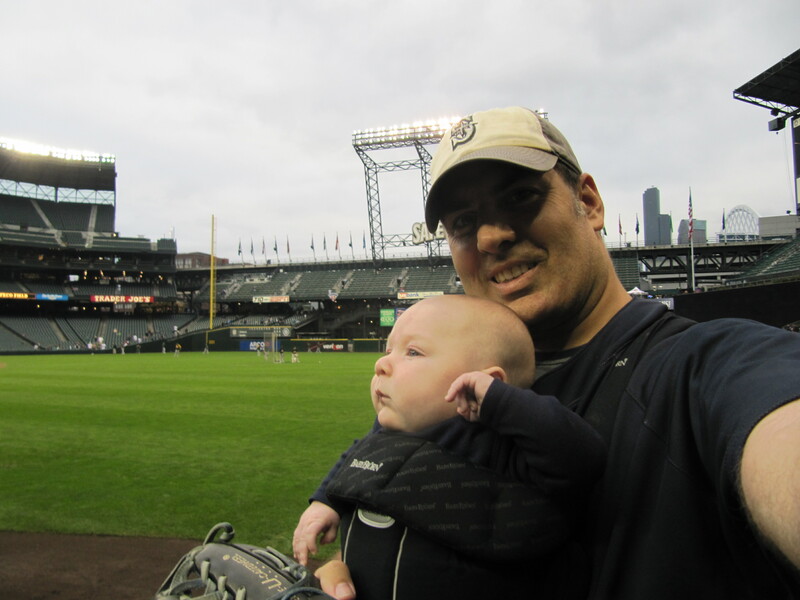 It was great to get this one at Safeco Field (although poor little Kellan was lights out at this point). 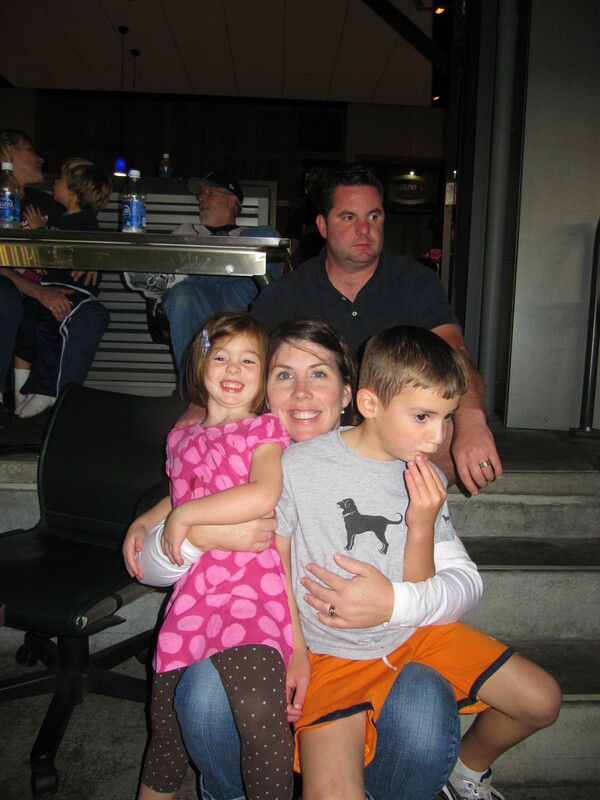 Oh, by the way, there is my camera-shy sister-in-law, Alison, between my mom and brother! (With this picture, I am pretty sure I’ve now included at least one picture of each person who attended the game with us in the suite). 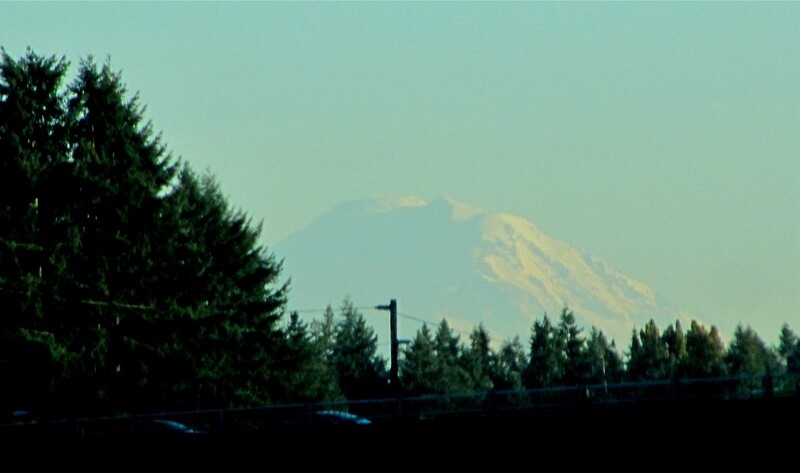 Aside from the final score, it was an almost unbeatable day at the ballpark. 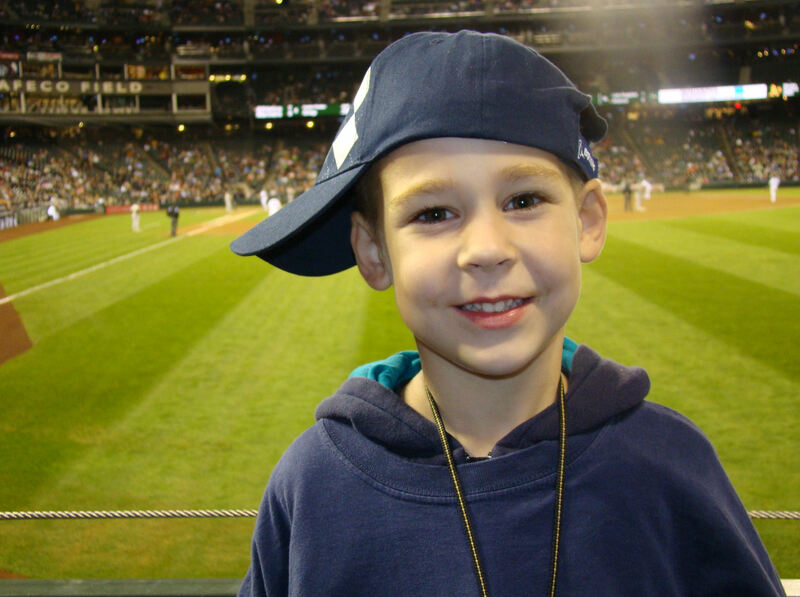 Welcome to the Majors, Kellan! …as we made our way from the suite to the car. Why did the night have to end? 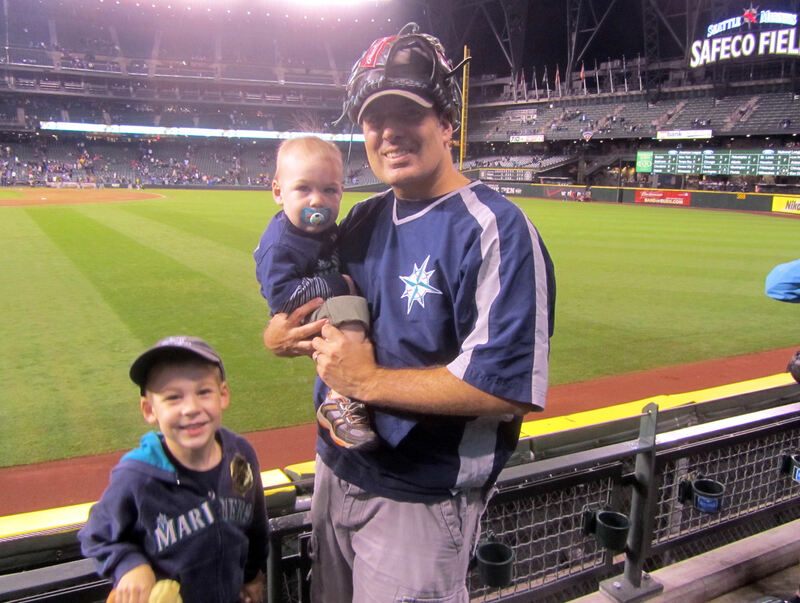 Tim’s little brother, Kellan, was born in July and there was no way that I was going to allow him to miss out on meeting the Mariners during the first baseball season of his life. 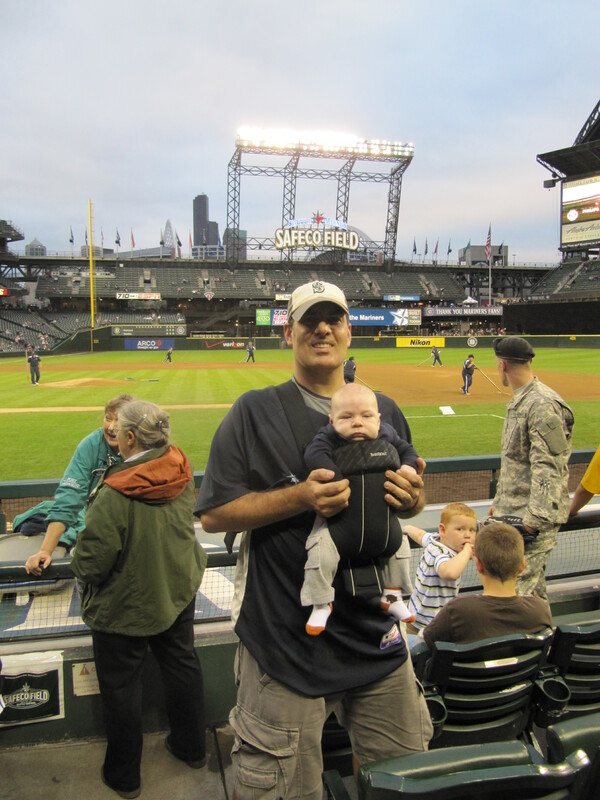 And there was no way Kellan was going to experience his first game anywhere but Safeco Field. 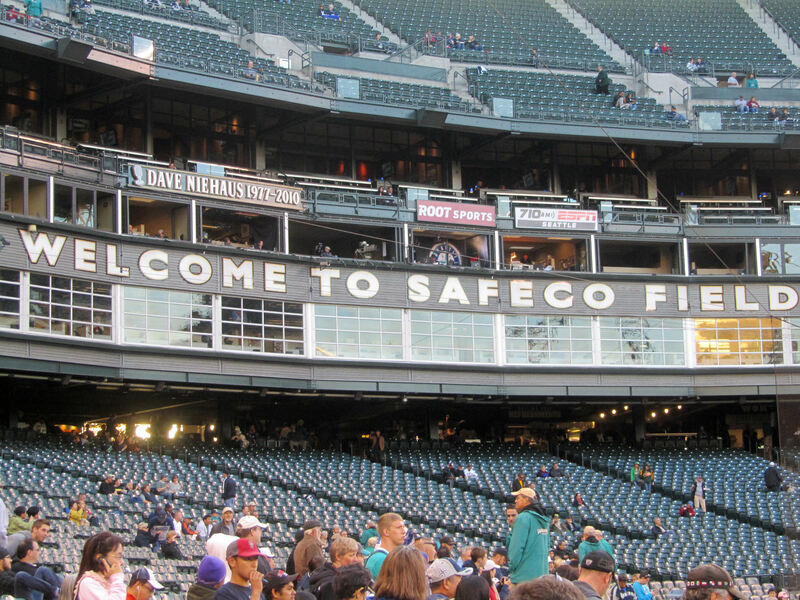 So, as the season drew to a close, we found ourselves in Seattle. 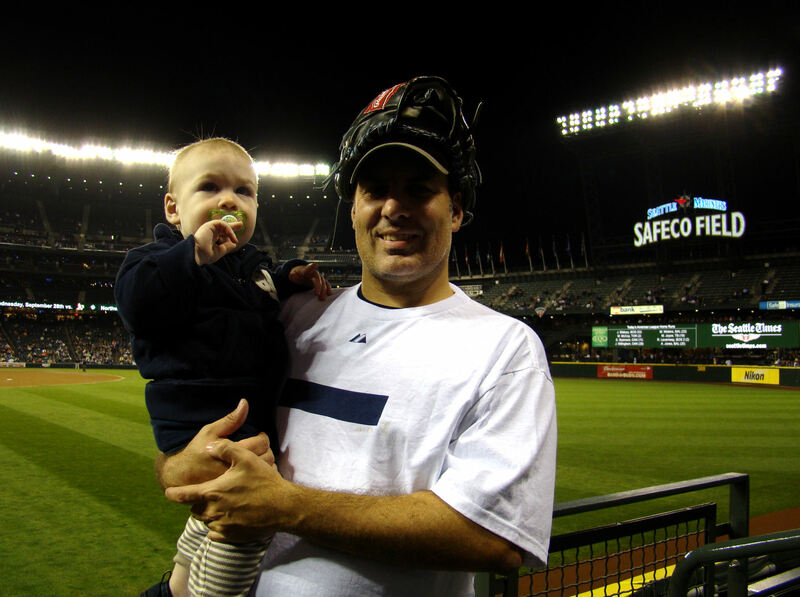 Kellan’s first game was slated for Friday, October 1, 2010. 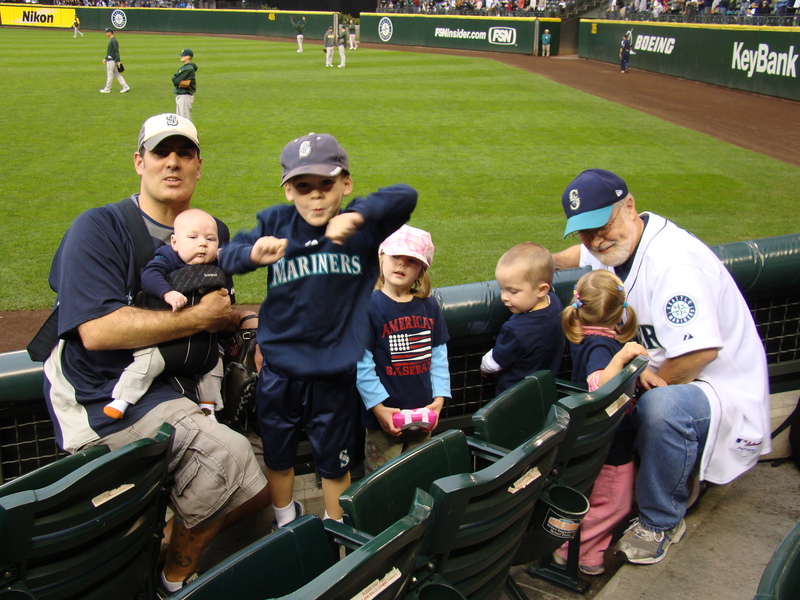 But we were in town a couple days early to visit my family and the Mariners were playing. There was no way that Tim and I were gonna miss out. 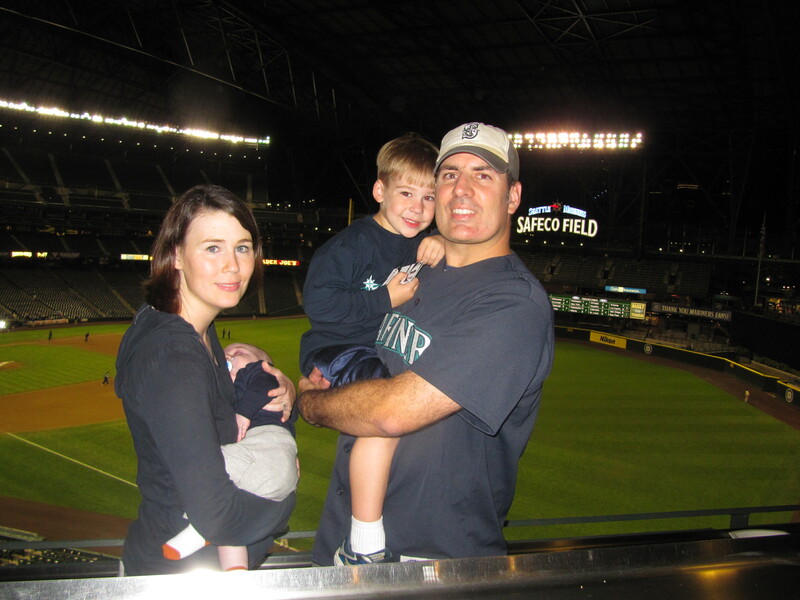 On Thursday, September 30, 2010, we gathered up my mom, dad, and brother Jason, and headed down to Safeco Field. 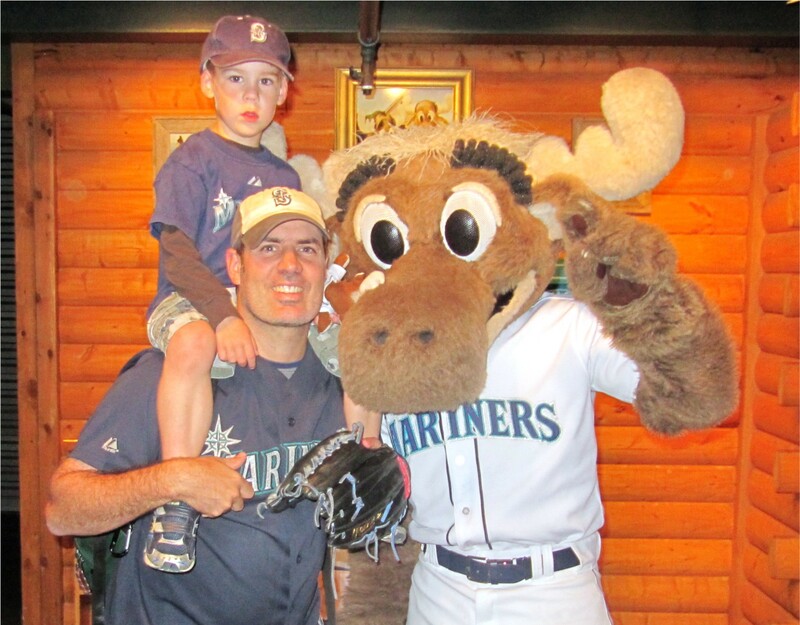 …and posed for a picture with him in his little Moose den. 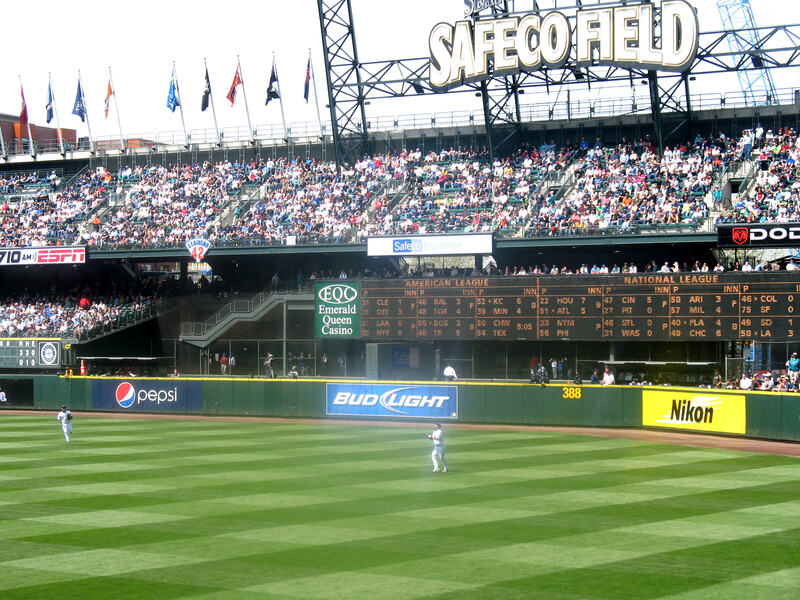 Ah, beautiful Safeco Field. We love this place. 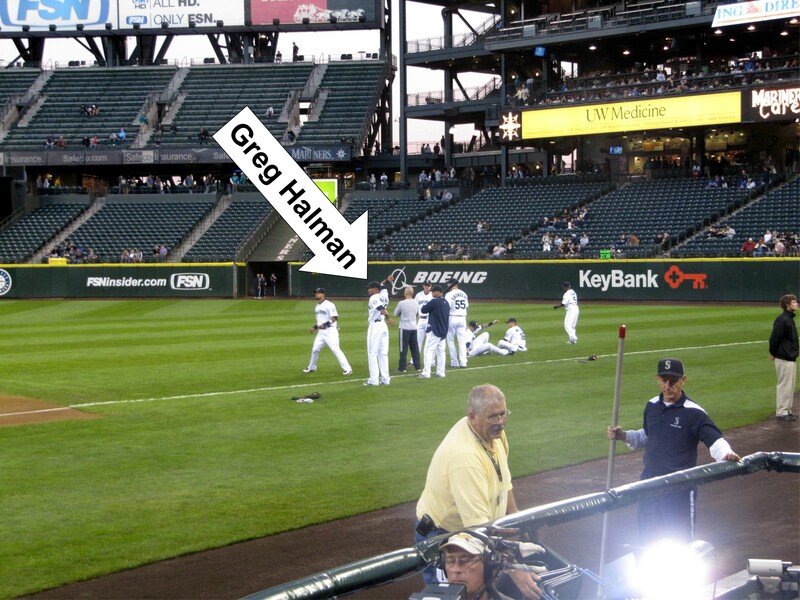 …and we were essentially the only people around when Greg Halman finished playing catch. 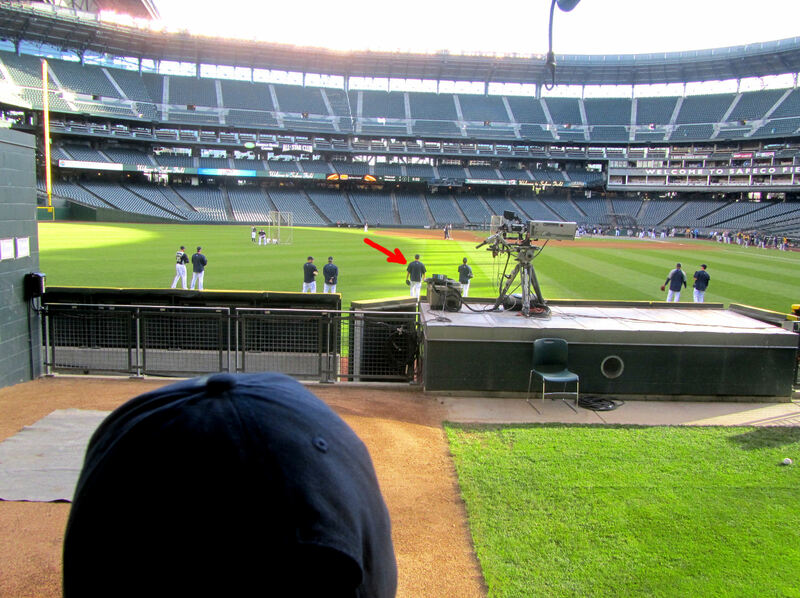 I called out, “Hey, Greg!” He turned around and fired the ball to us. 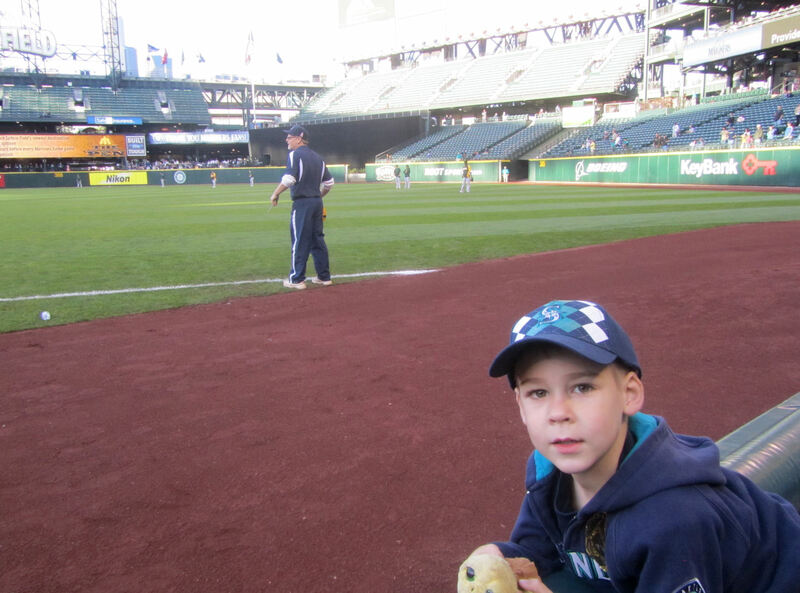 It was just minutes until game time, so we reported to our seats in RF. 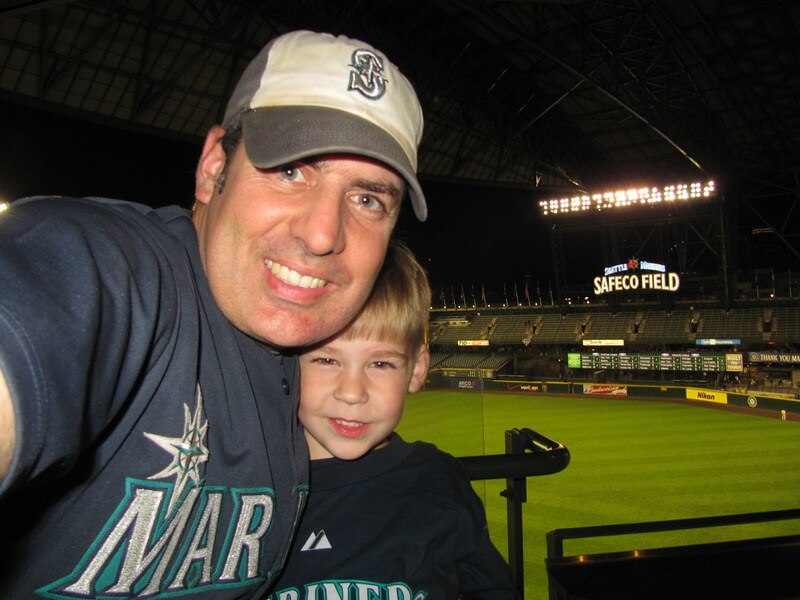 We picked RF because the week day crowds had been tiny lately at Safeco Field and we figured our chances of getting near a homerun ball would be decent. 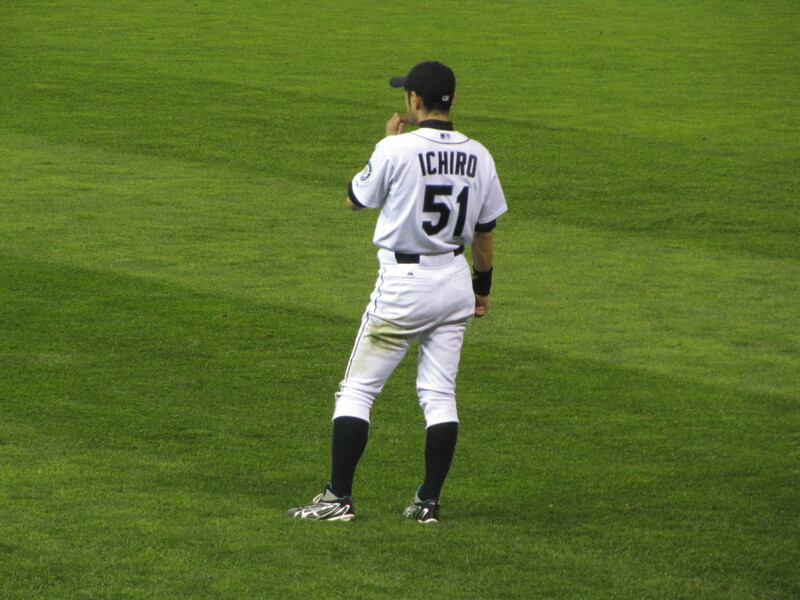 Also, as an added bonus, we’d been near Ichiro. 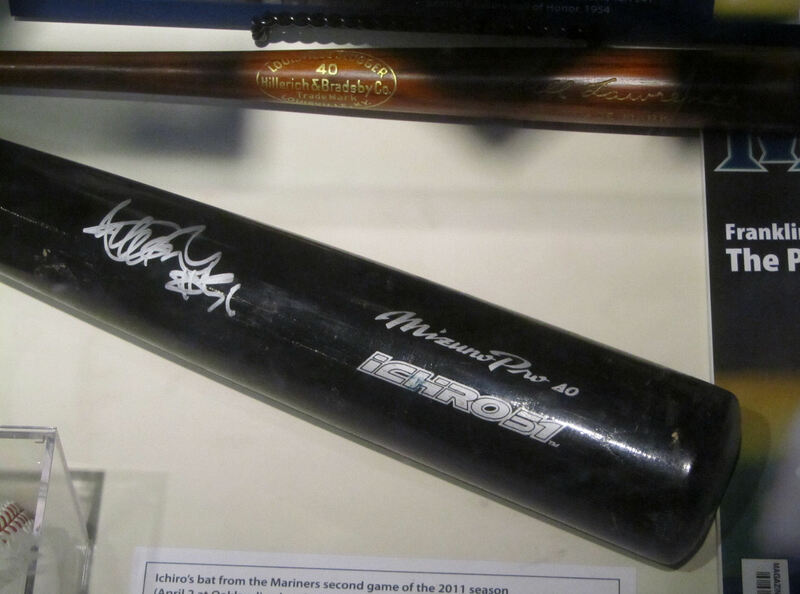 ….for being the first Major Leaguer to collect 200 hits for ten straight seasons. We were pretty busy chatting and generally having a good time during the game, so I did a pretty shabby job at getting action shots. But we’ll do our best to take you through the night. 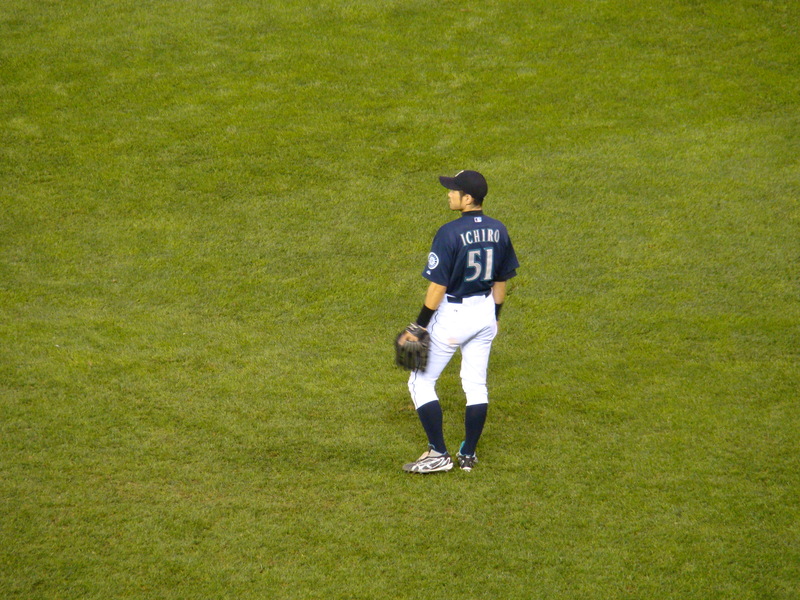 …and here was our view of Ichiro as he played catch with Franklin Gutierrez between innings. 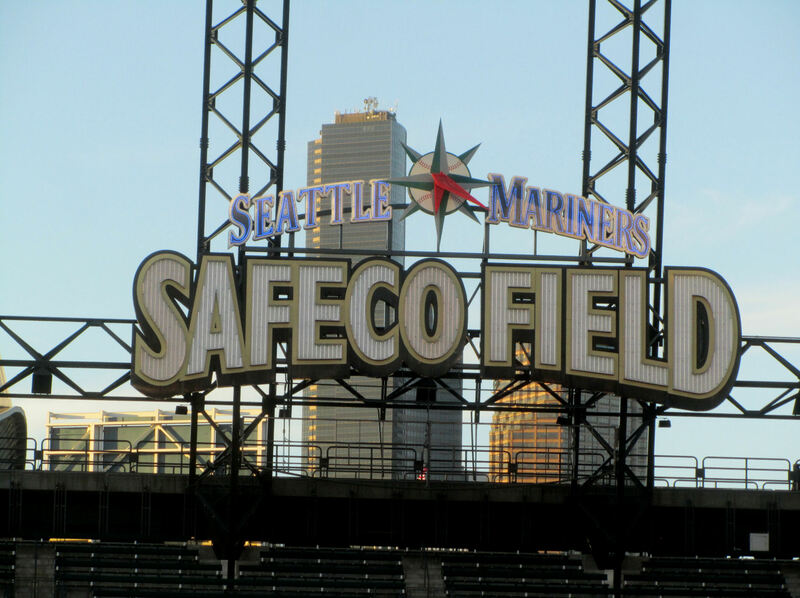 Now is that a great looking ballpark or what? 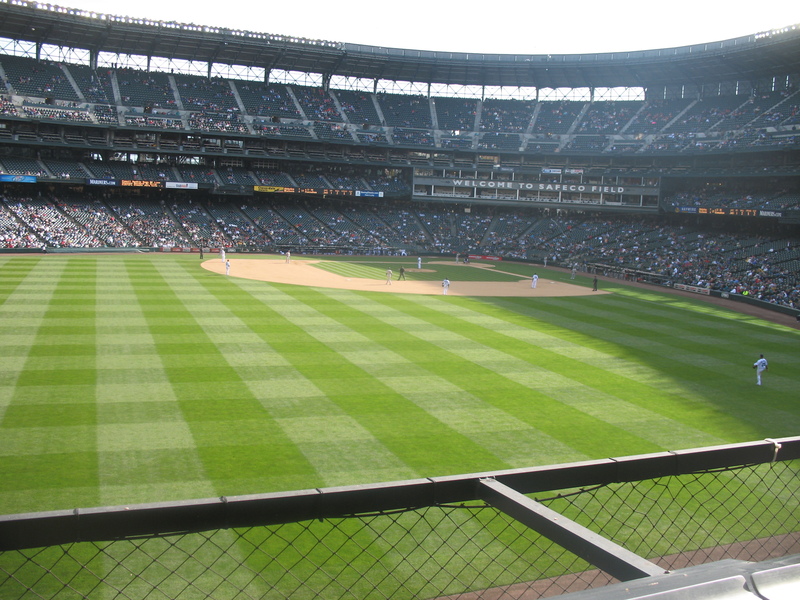 By the way, Row 25 is the third row back from the field in RF at Safeco. As for the game, it started off nicely. 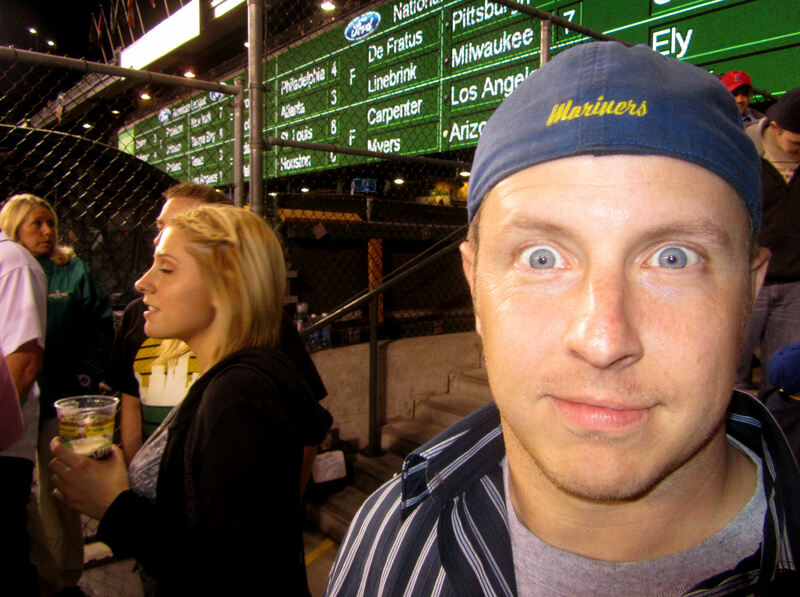 It was the A’s and the Mariners. Doug Fister took on Gio Gonzalez. Both pitchers were “on” at the beginning. 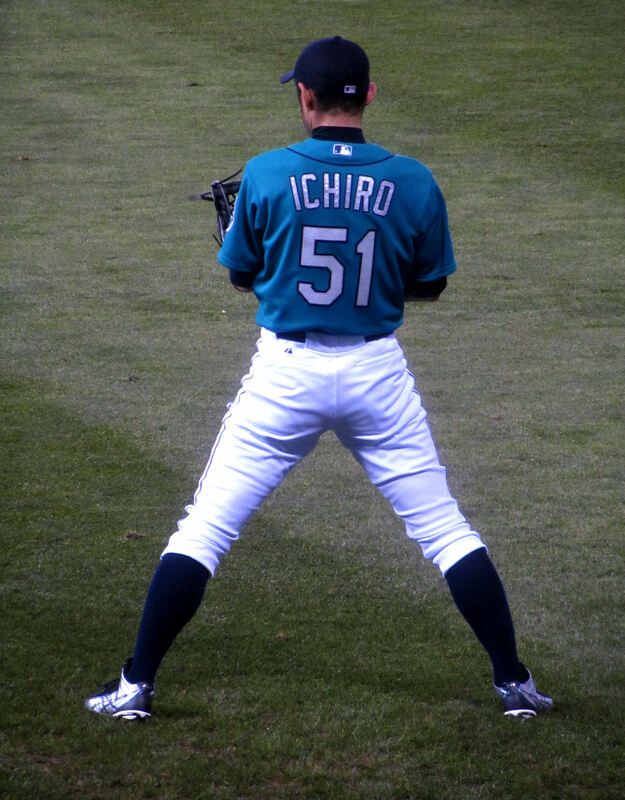 Despite some hits by both teams through the early innings (including a first inning single for Ichiro (his 209th hit of the season)), the game was scoreless through four innings. 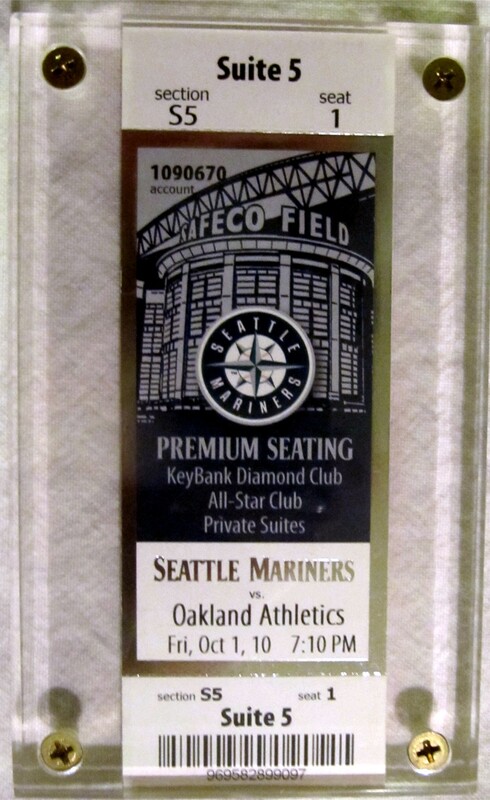 It was a lot cooler at this game than we were used to while attending games in the northeast. 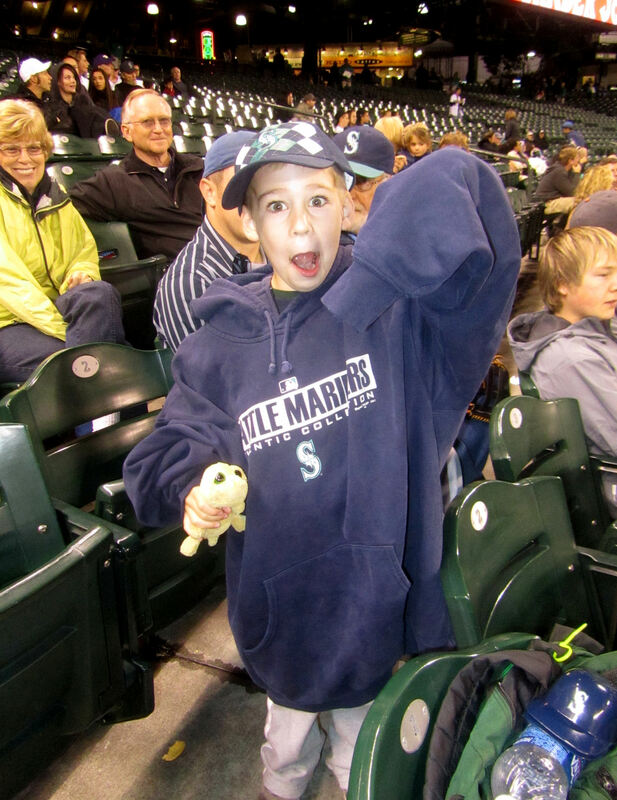 So, a couple innings into the game, my mom, Tim and I visited the M’s team store and I got a great deal on a new Mariners sweatshirt for Tim. 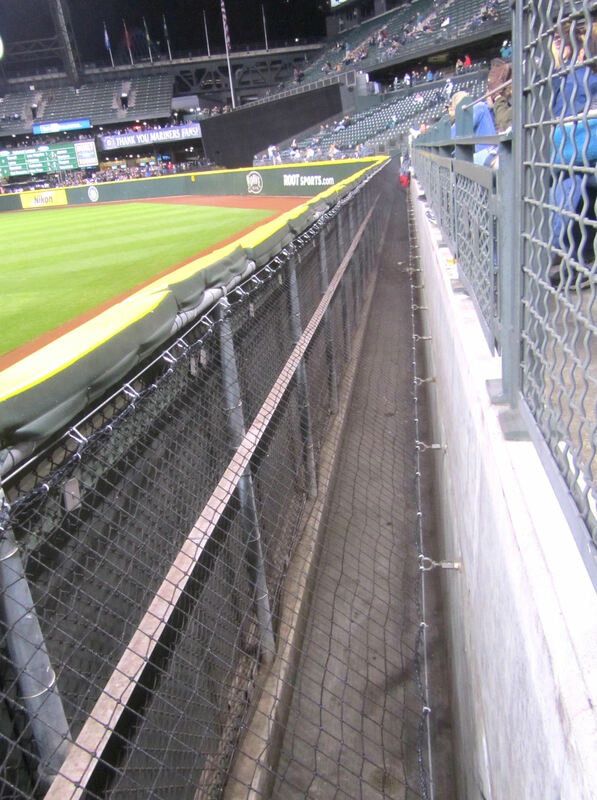 On the way back to our seats, we decided to walk by the Mariners bullpen. 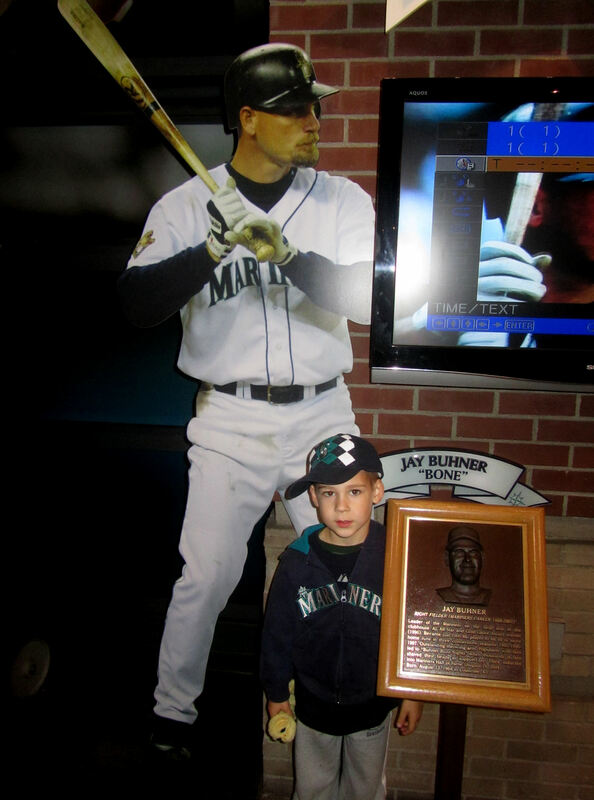 …a little cut out at the front of the M’s bullpen mound with a flat ground pitching rubber. That was a new one on me. I looked away from my camera, and there was Mr. RRS. It was great to catch up with RRS. 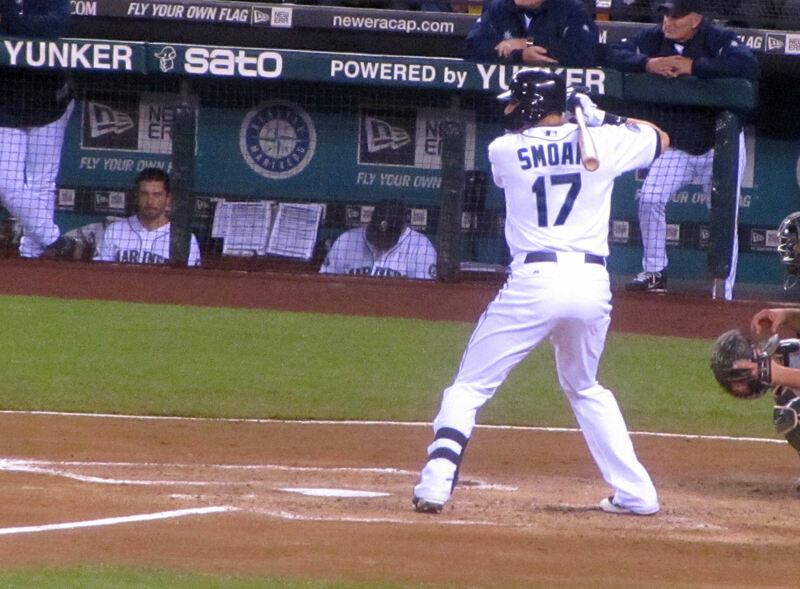 It was interesting to chat about what it was like in the clubhouse as the Mariners were 97 losses into the season and four days away from the off-season. It was also cool to get a sneak preview into his very interesting training plans for the off-season. 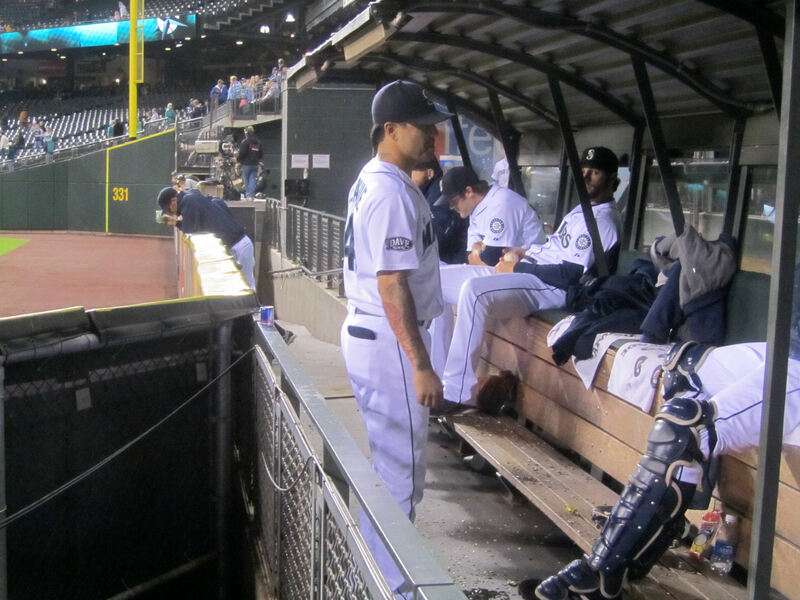 I felt a bit bad seeing RRS watching the game from the bullpen after a tough season. 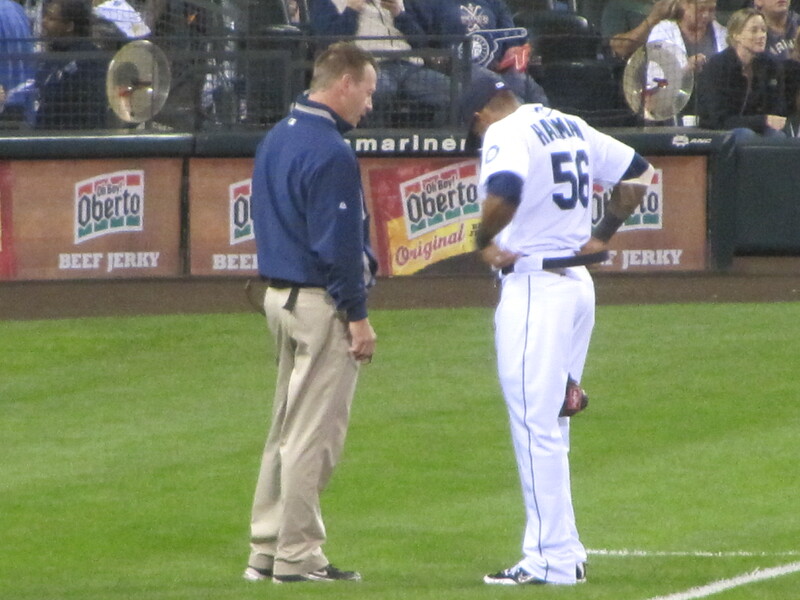 And I was hoping I’d get a chance to see him pitch once more and close out the season on a positive note. While it wouldn’t happen at this game, I would get my chance. 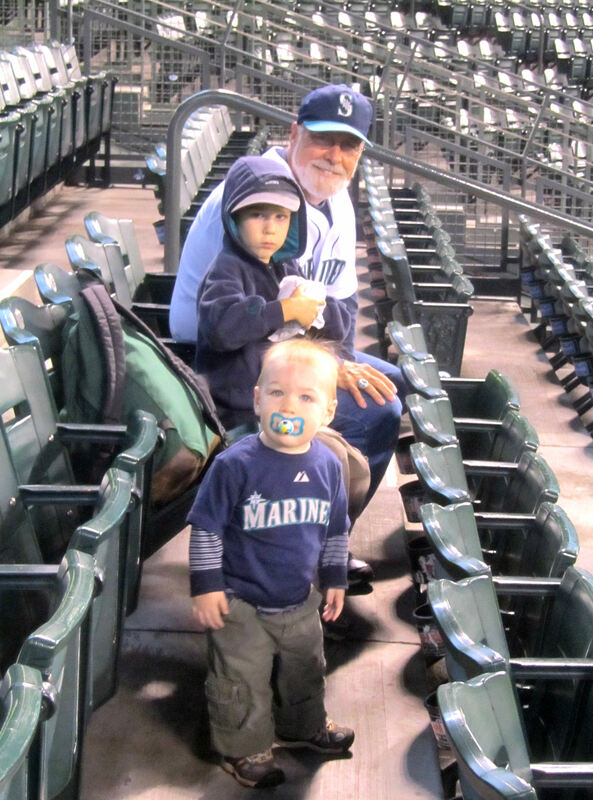 …but as things got sweet for Tim, they got sour for the Mariners. 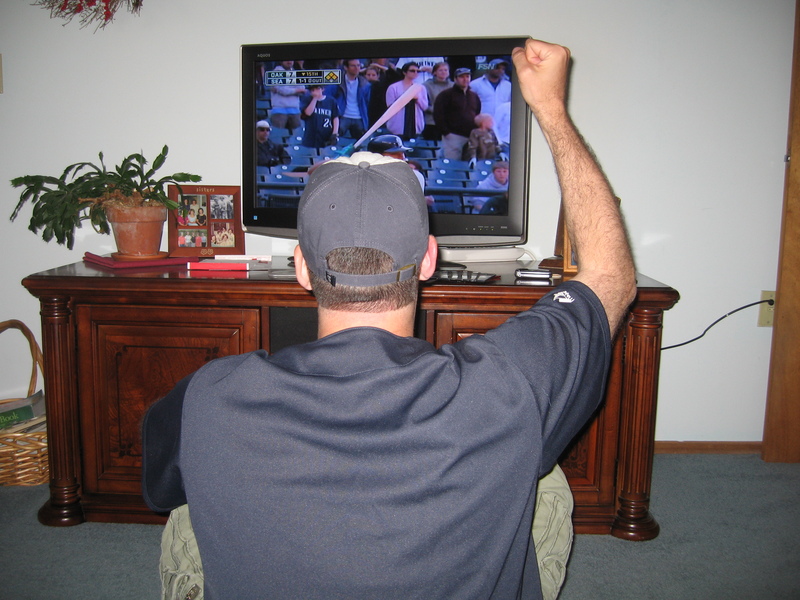 Between the fifth and sixth innings, Doug Fister gave up 6 runs and Brian Sweeney gave up the seventh run of the game. 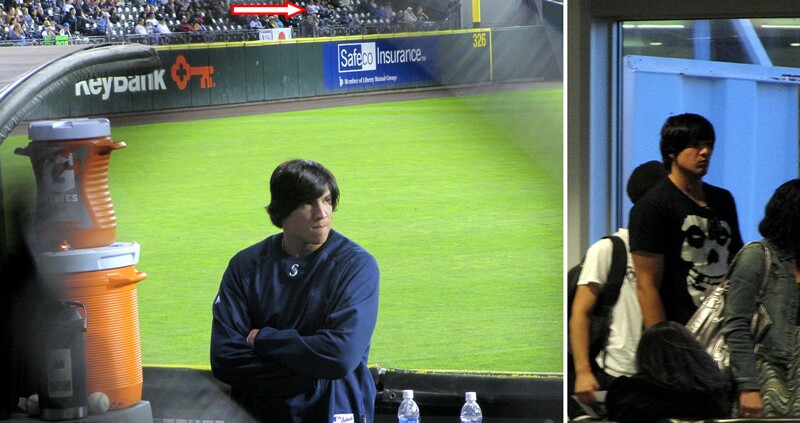 Quickly, our pitchers’ dual turned ugly. 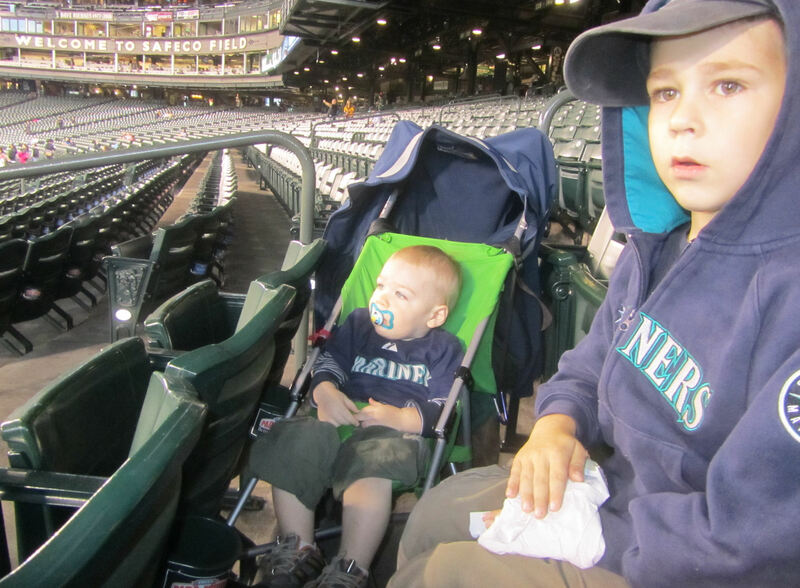 …as we watched the Mariners on the way to their 98th loss of the season. Hey, check out that great new sweatshirt on Tim. 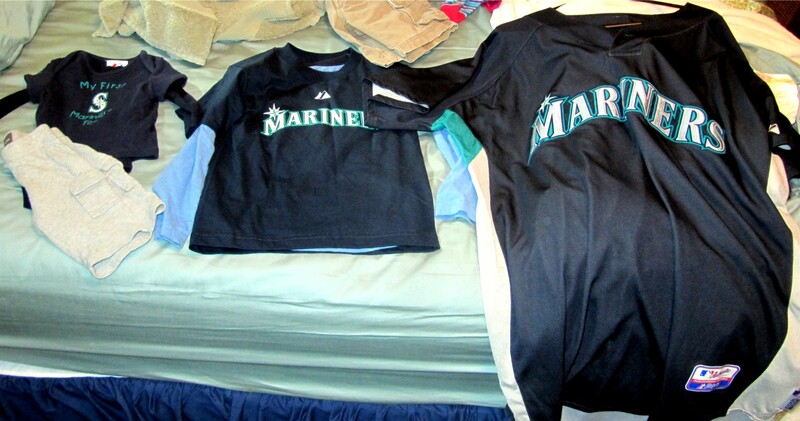 Its a zip-up with a teal inner hood. Very nice. And, of course, it was nice to get a chance to snap a picture of the Greg Halman ball:. …that he broke his belt in the process. …interestingly, five days later with the season concluded, we were getting ready to board our airplane back to Pennsylvania while Mr. Cortes was getting ready to board his flight back home to the Los Angeles area. 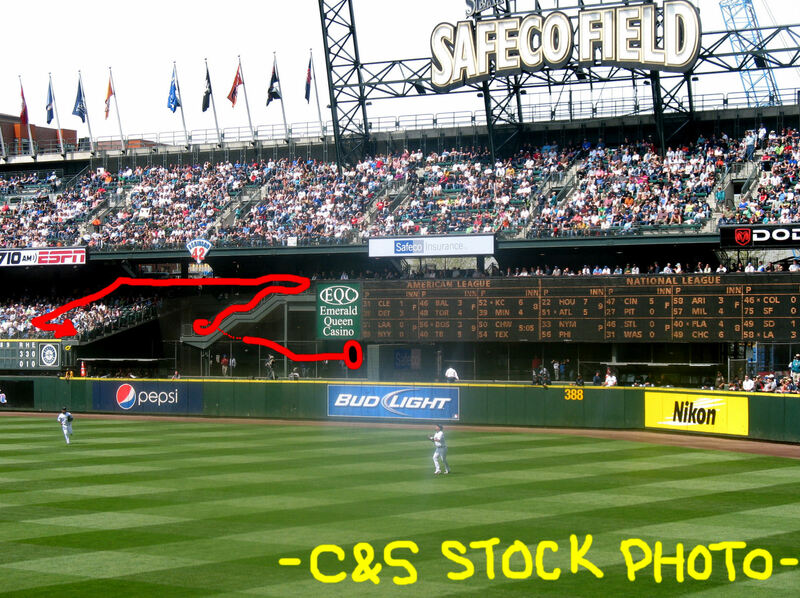 (FYI, the white and red arrow is pointing to my brother and parents). Well, we made it to the 8th inning. 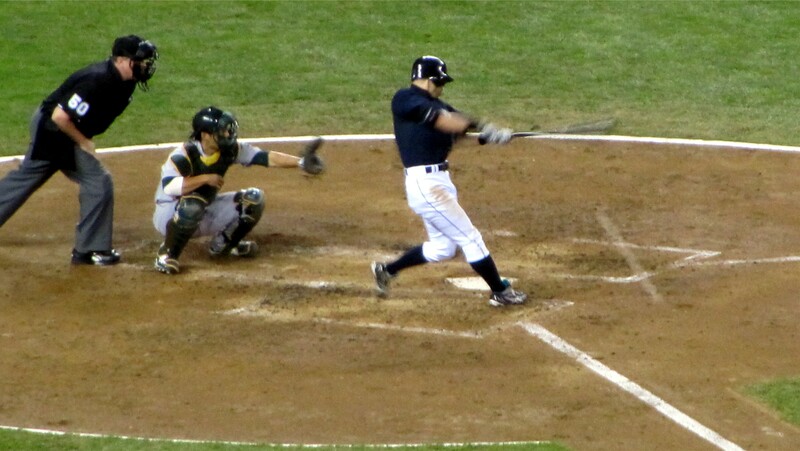 It was still 7-0 A’s, and despite fairly empty seats, we’d managed to go the whole game without catching a homerun. And then, the perfect opportunity arose…and I totally botched it. ….in THE ROW IN WHICH I WAS JUST SITTING. It was right there, on my side of the green railing. RIGHT THERE! Had I stayed put, I could have caught it easily. I still had a chance. Someone bobbled the ball. 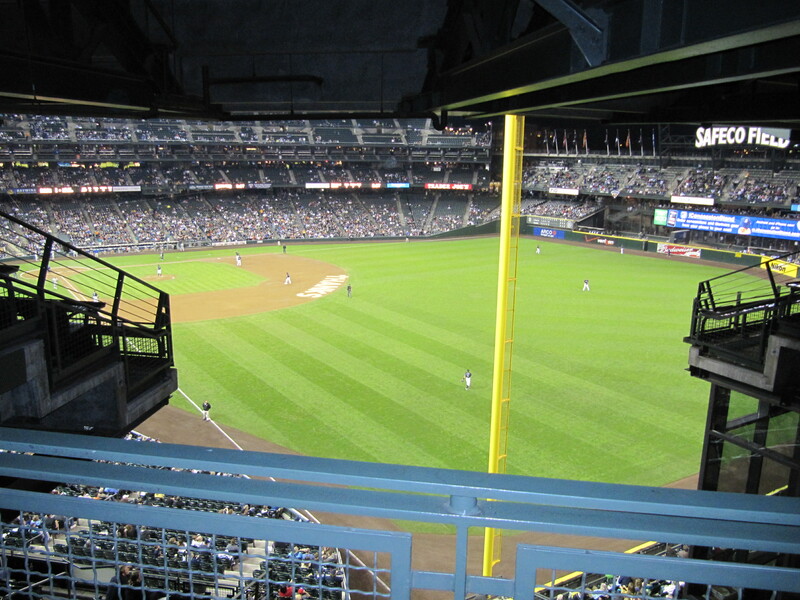 I made a dive for it down the stairs while passing under that railing, which ultimately resulted in several flesh wounds and two large buises but no baseball. Oh, well. 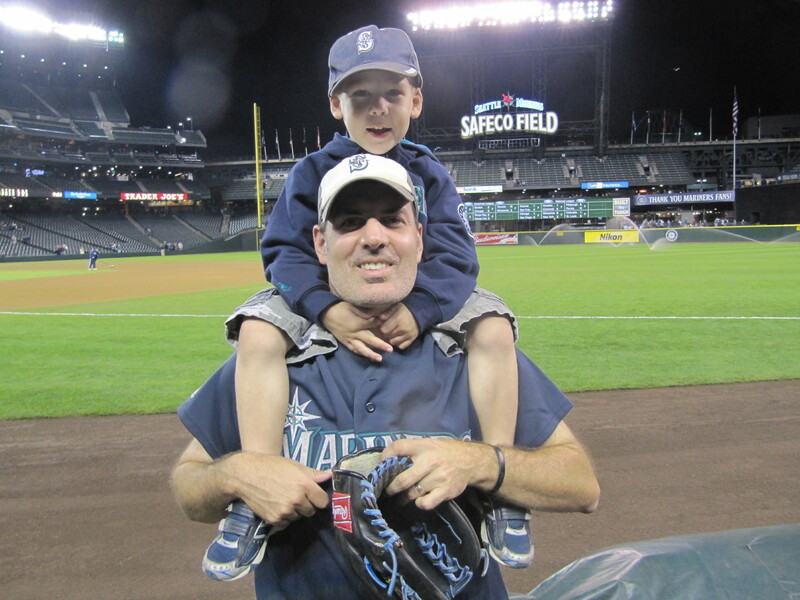 while I really would like to catch a game homerun some day, I would much, much, MUCH prefer that it not be a homerun off of the Mariners. 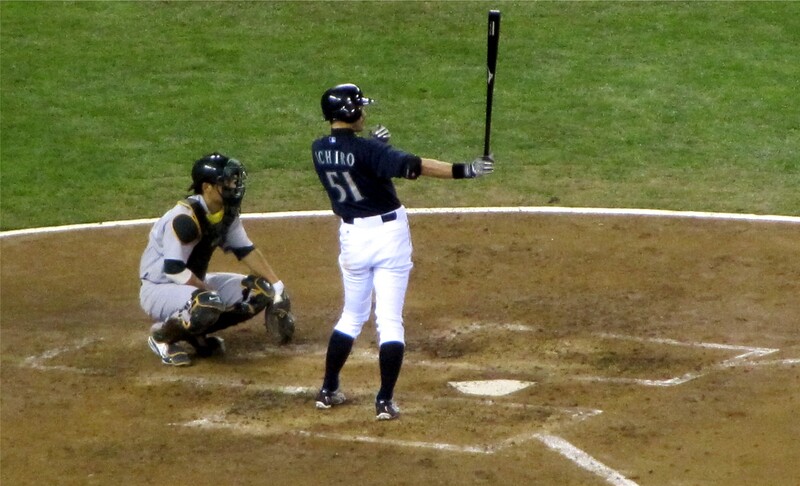 Anyway, it was moving into the 9th inning. 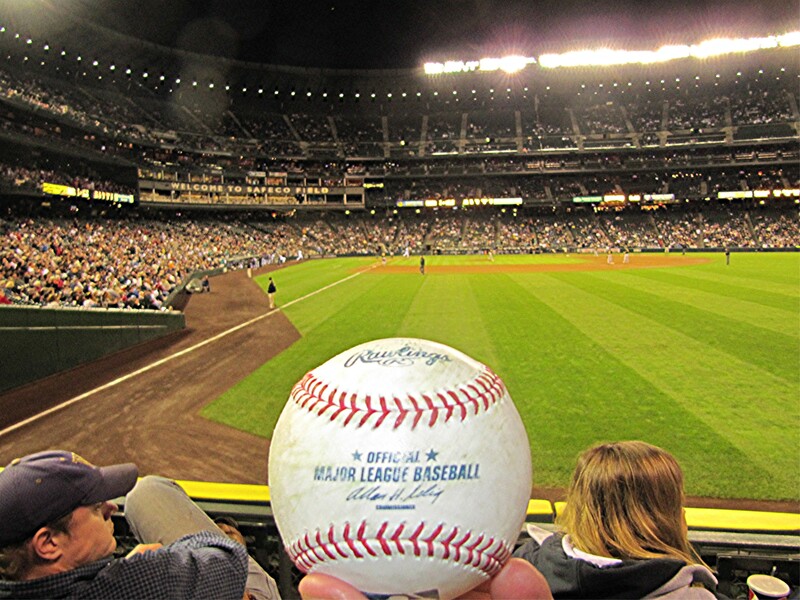 Tim and I decided to head over to the 3B dugout in hopes of getting our hands on our first ever Safeco Field umpire ball. 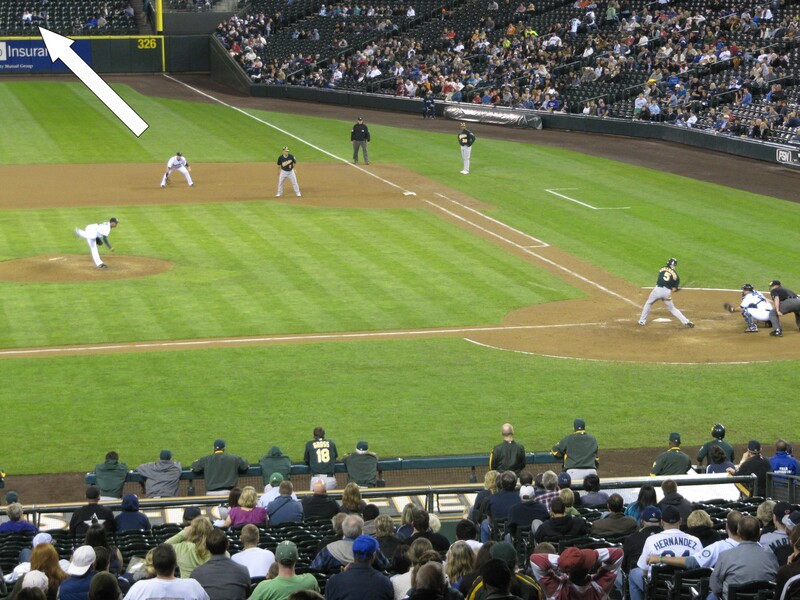 …the white arrow is pointing to my brother and parents. We were in the concourse standing room area for that picture. 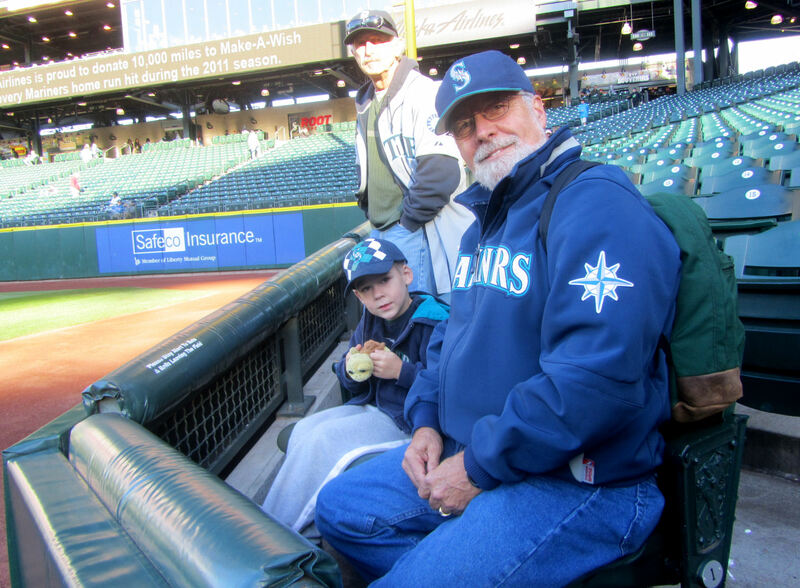 A few minutes later, we mae it to the first row right on the umpire tunnel, but an usher told us we couldn’t sit in the “charter” seats. I asked her how far back we had to go. Row 11 was acceptable. 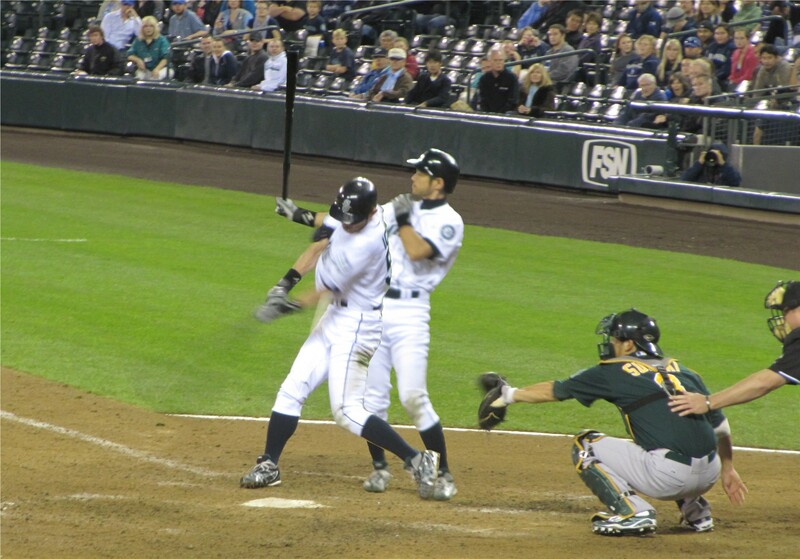 …after a hard foul liner right over our heads, he smacked a single for his 210th hit of the season. 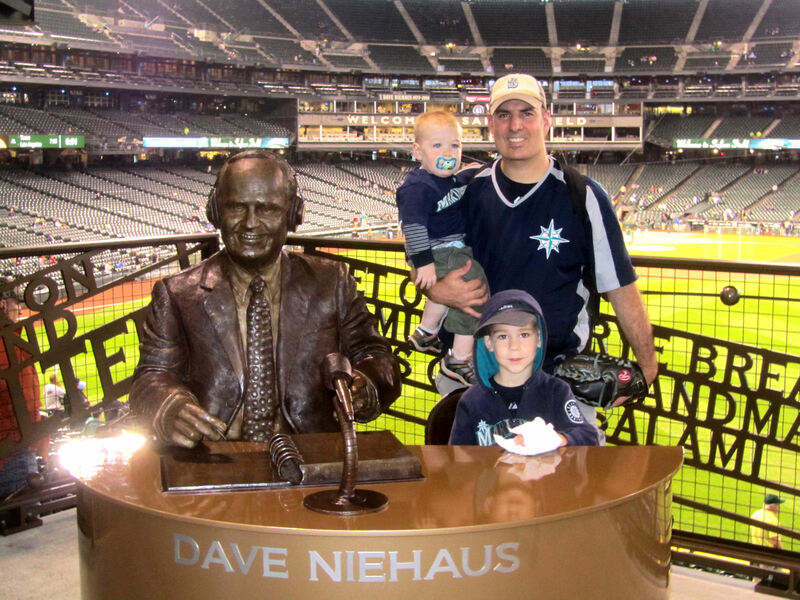 It was a miserable loss, but it was great being back at Safeco Field and it was great spending the evening with my family. 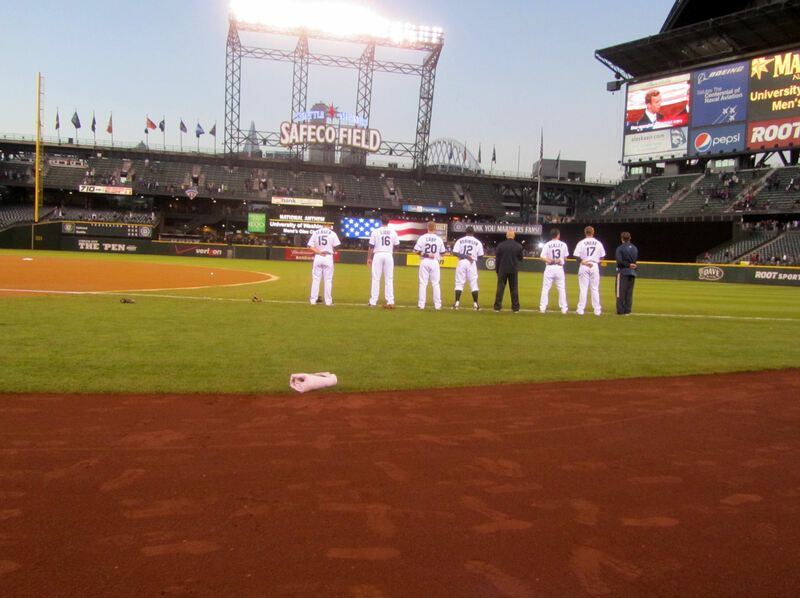 …another usher took this excellent shot of all of us. As we left the park, I was excited to know that we’d be walking back into the park less than 24 hours later for the first game of Kellan’s life! Upper left: Paul and Tim. 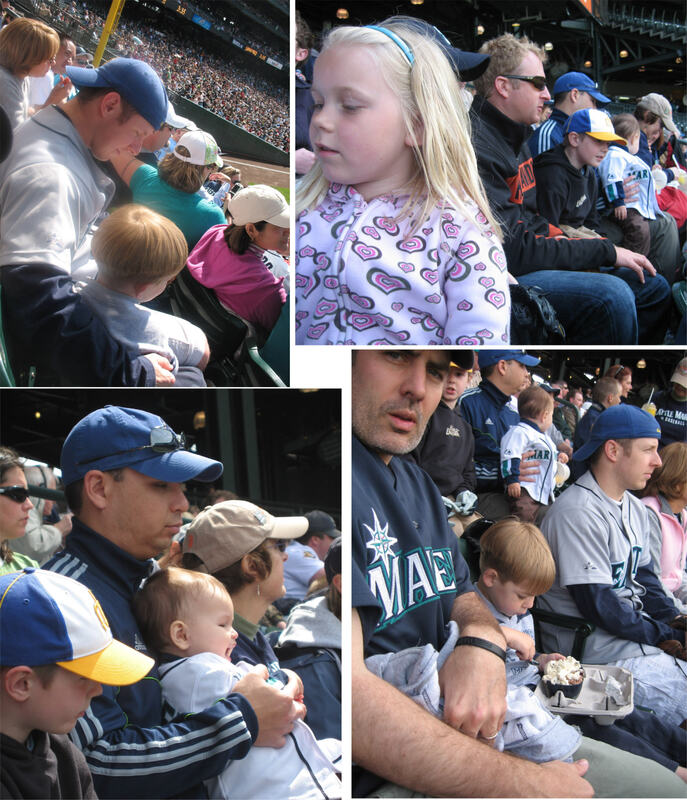 Upper right: Maggie, Weston’s hat, Sean, Lake, Jason and Ainsley. Lower right: me, Tim, Paul with Lake, Jason and Ainsley behind us. 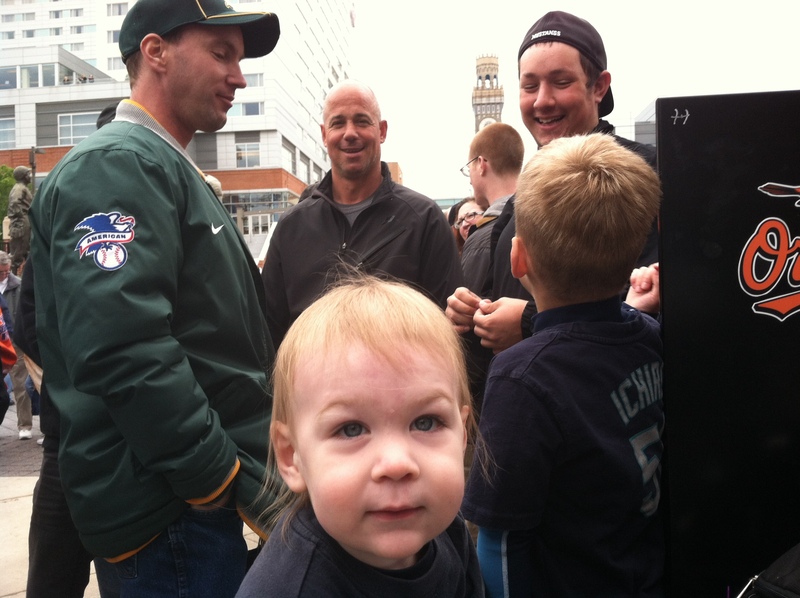 Lower left: Lake, Jason and Ainsley. 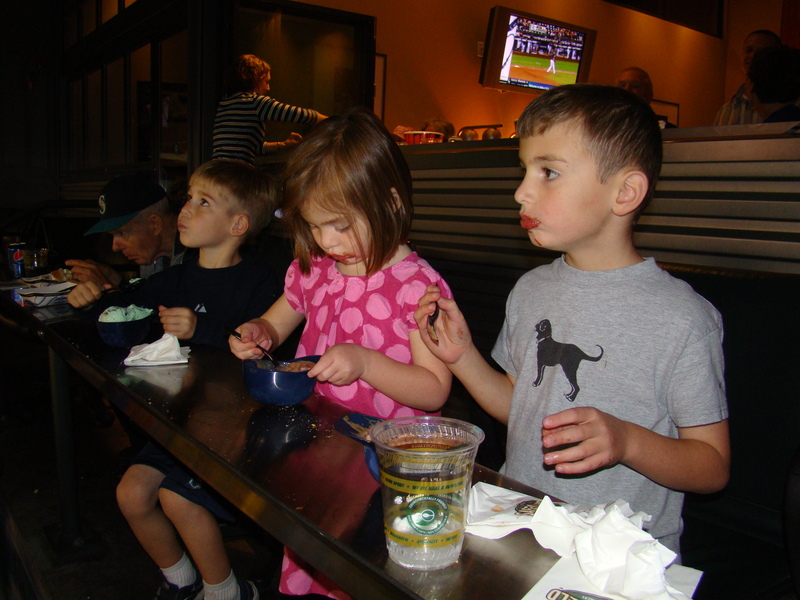 Upper left: Maggie and Weston eating popcorn. 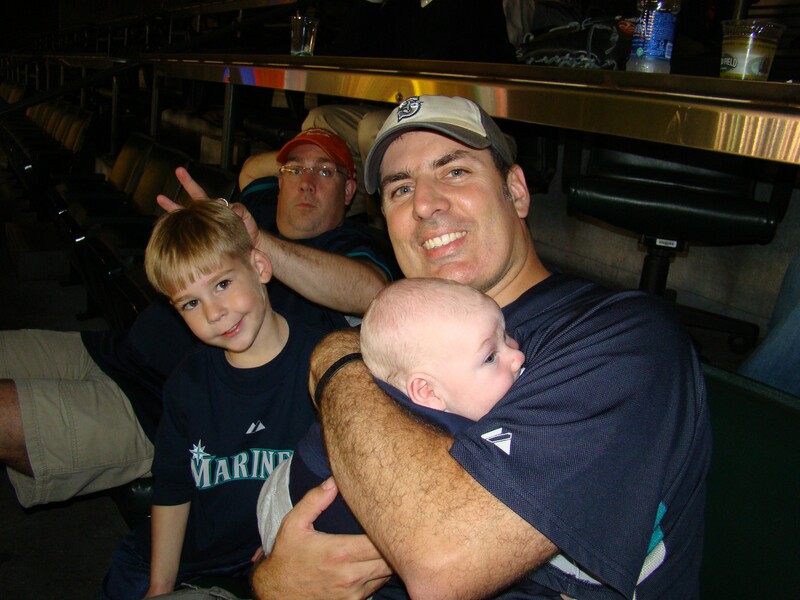 Upper right: Jason, Ainsley and me. Lower right: Maggie, Weston and Tim blowing in each others’ faces. Lower left: Chris and Maggie. Raise your hand if you want to do some nursing with three other people and a nice view of the street outside of a baseball stadium! 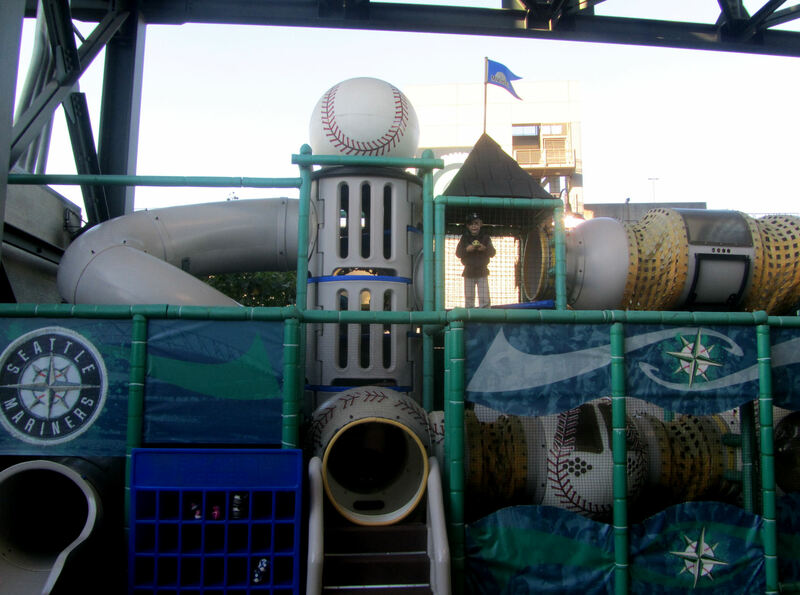 See the “Seattle Childrens'” sign on the second deck? And the guy standing in the middle of it? And the next deck directly above him? 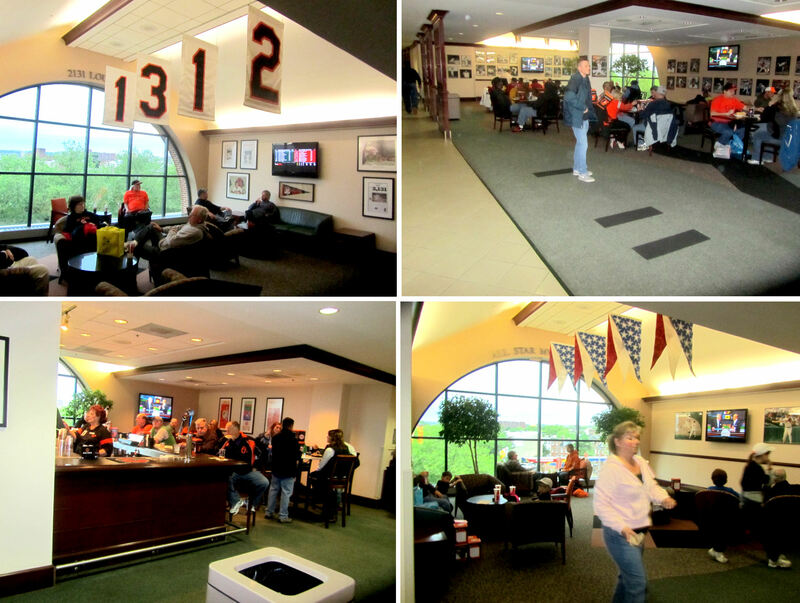 That is Suite #5 – the Ted Williams suite. 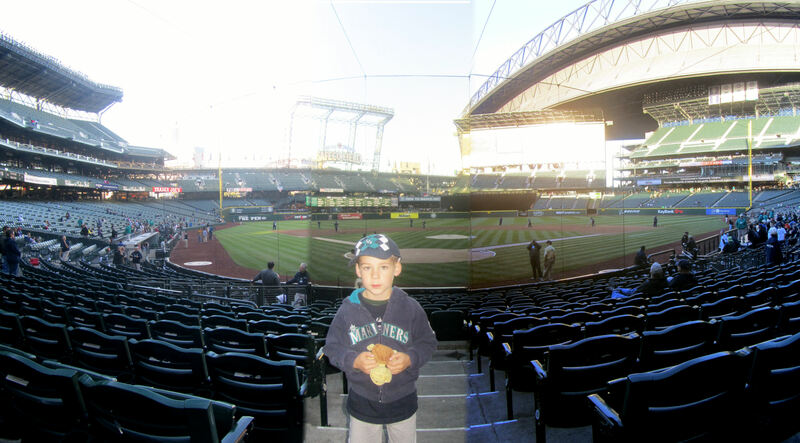 That is where we were for Tim’s first Mariners/MLB ever. 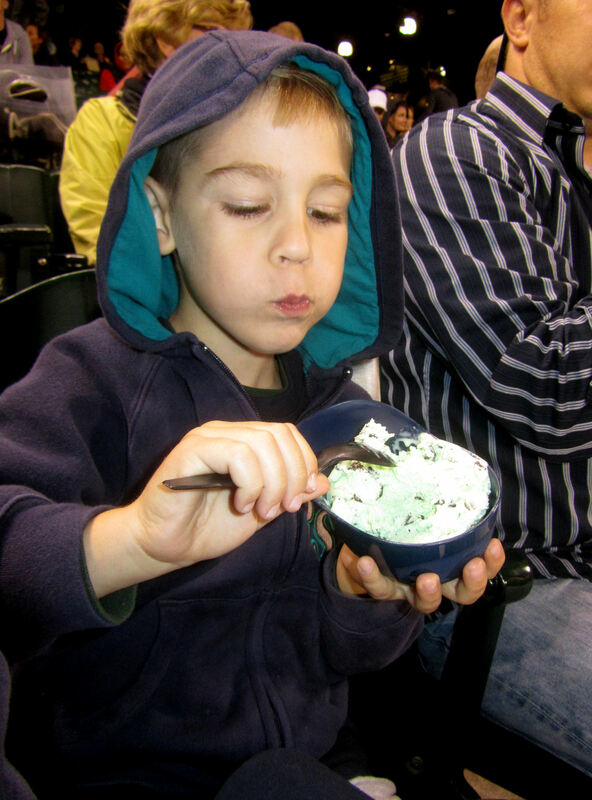 It was Tim’s and three other little kids’ first games so we celebrated it in style in the suite. It was awesome! 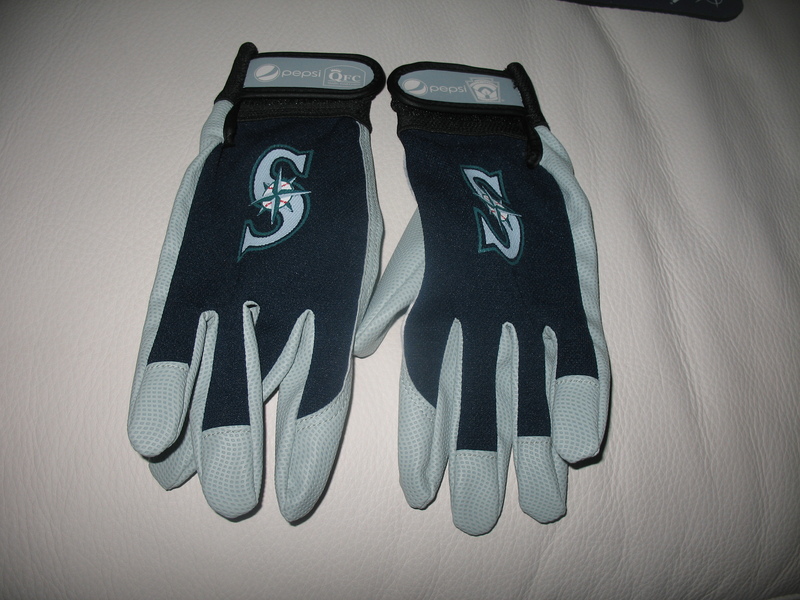 They are actually really nice batting gloves. 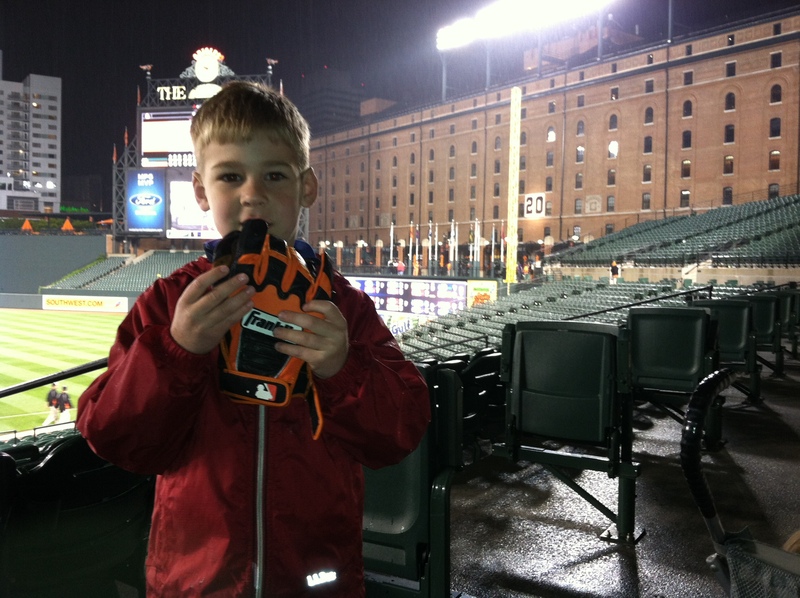 However, they are not “kids” gloves…well, maybe little leaguer Danny Almonte…but not for a normal kid. In fact, they fit me perfectly. Here is a picture of some kids wearing them. Notice Weston’s “thumb” sticking up a mile in front of Tim’s nose. 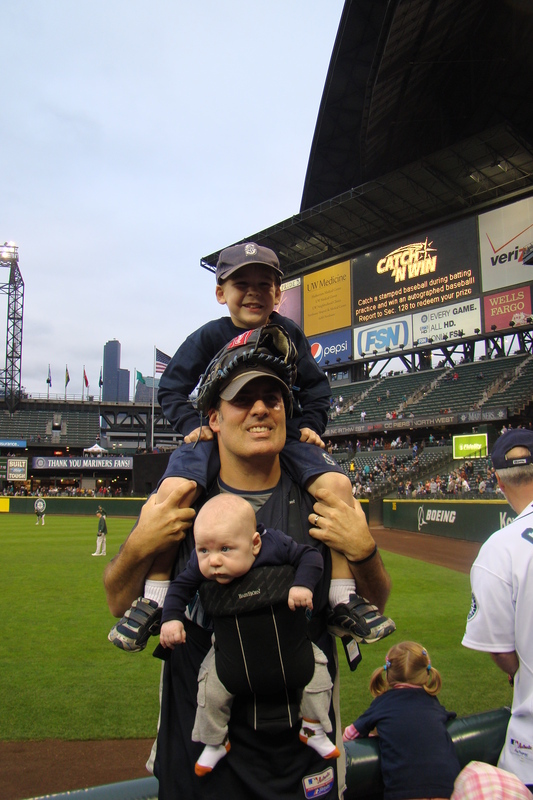 The gloves dwarfed the kids. 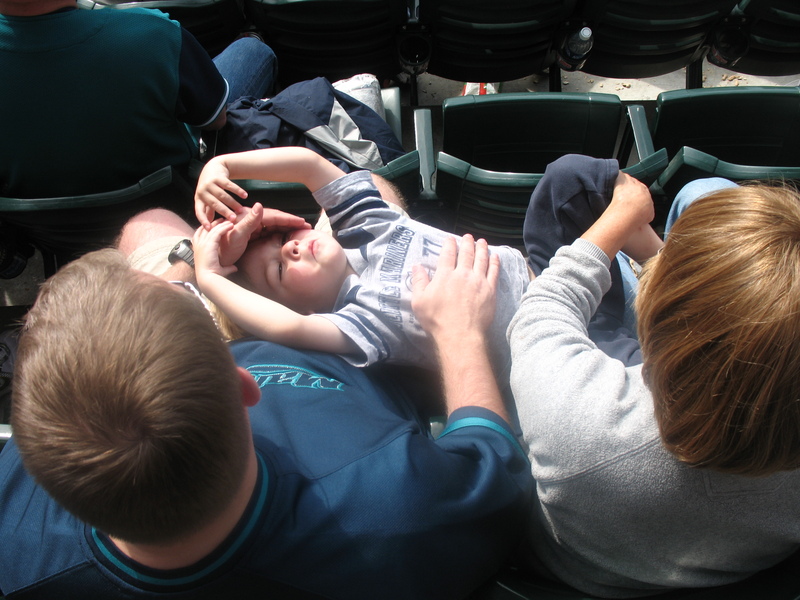 So, after the A’s scored three runs in the top of the 13th, Grandma made the executive decision that we needed to leave so her grandson could sleep in the car. I reluctantly agreed. 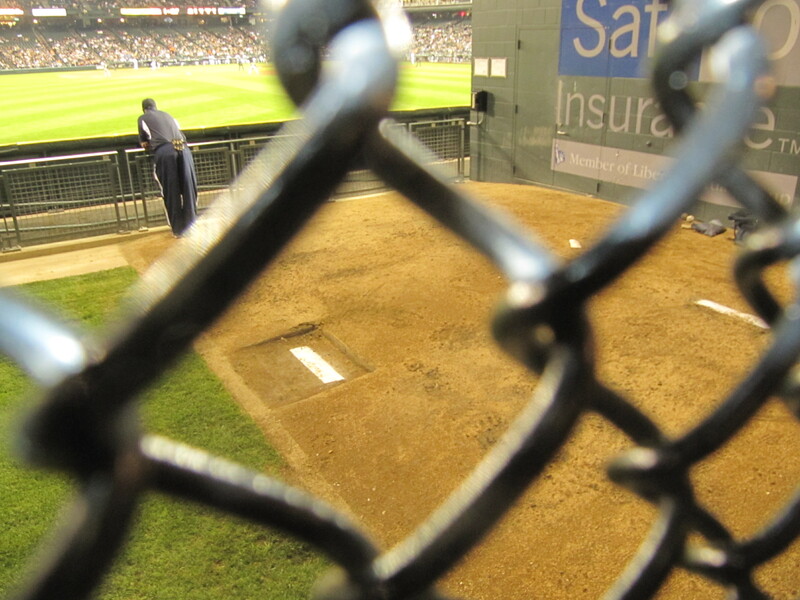 Here is a picture from above the bullpen as we walked toward the exit. For the second time in the series, Lopez came up with a walk off single! 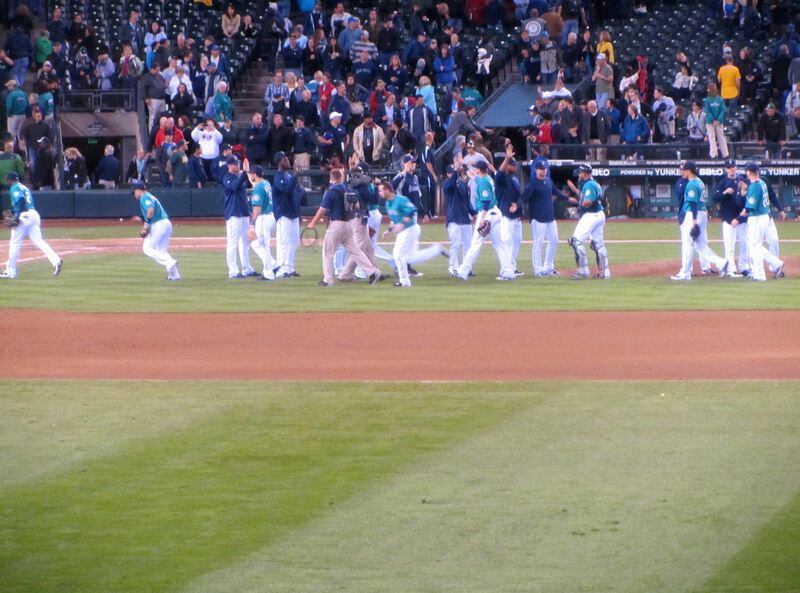 MARINERS WIN! 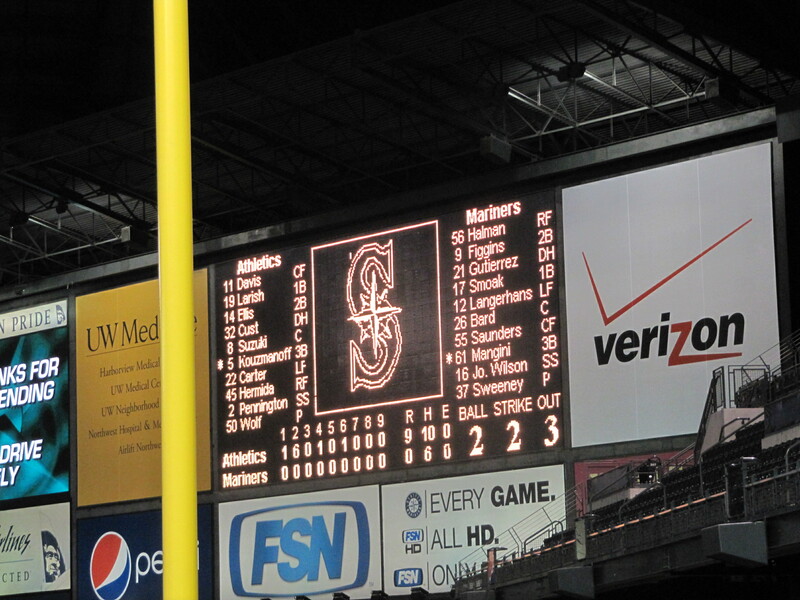 It wasn’t an ideal way to see the Mariners win, but it was better than my colleague who had to watch the Phillies (his team) win the World Series from a bar in San Francisco in a game 5 that he had attended two nights before. 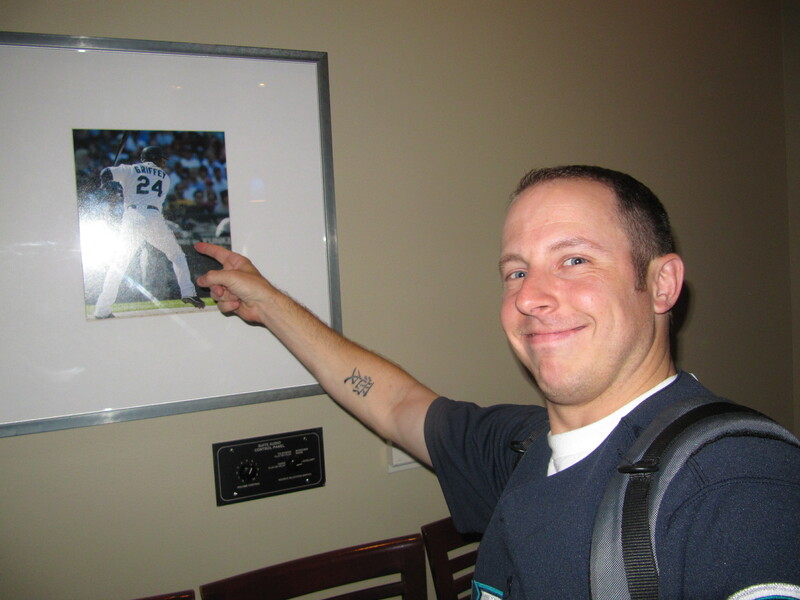 Plus, I didn’t miss a Griffey home run. So no harm, no foul. A win is a win!